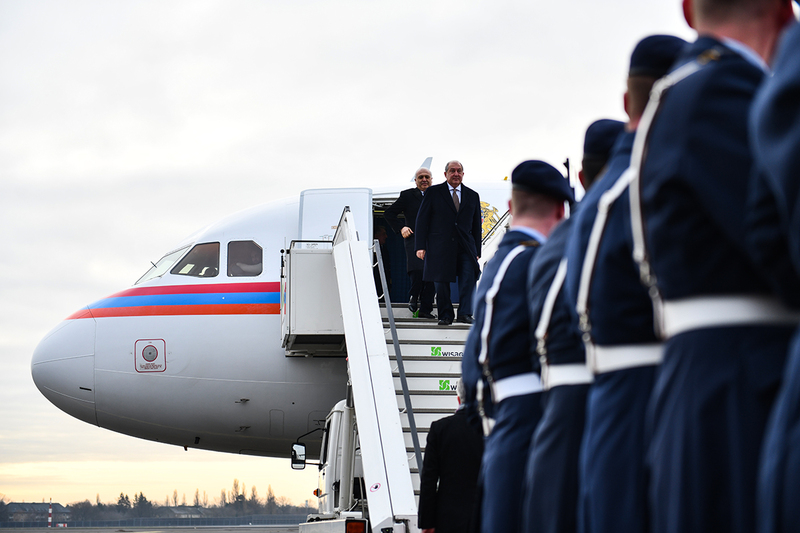 At the invitation of the President of Germany Frank-Walter Steinmeier, President Armen Sarkissian has arrived to Berlin on the official visit. 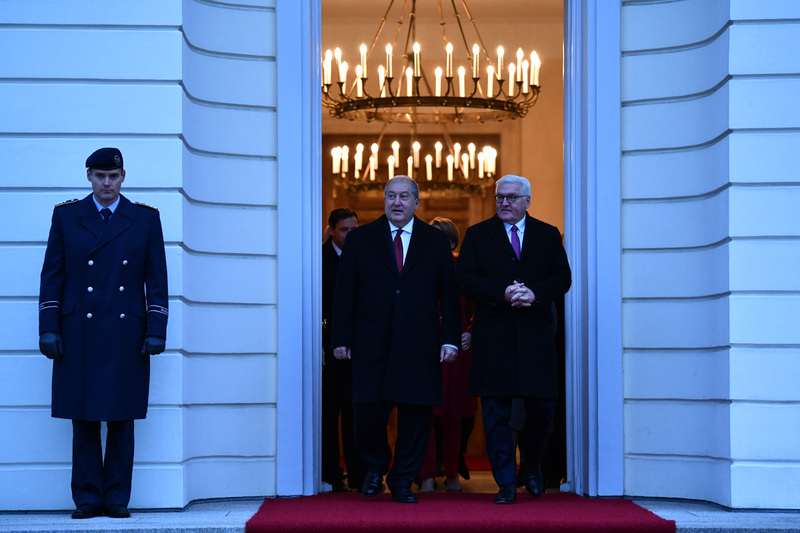 In the framework of the visit, the President of Armenia will meet with the highest leadership of Germany: Chancellor Angela Merkel, President Frank-Walter Steinmeier, and President of the Bundestag Wolfgang Schäuble. 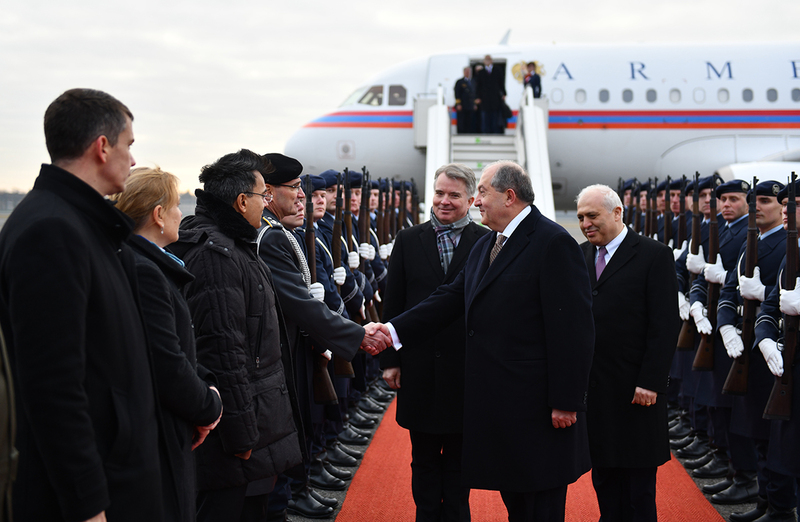 Issues related to the agenda and prospects of the bilateral cooperation will be in the center of the discussions. 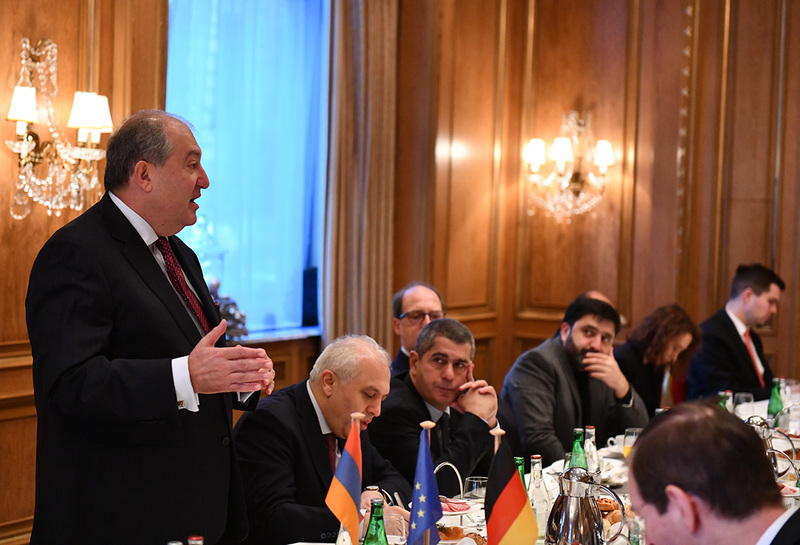 President Armen Sarkissian, who is in Germany on the official visit, in Berlin participated at the working discussions organized by the Munich Conference on International Security. 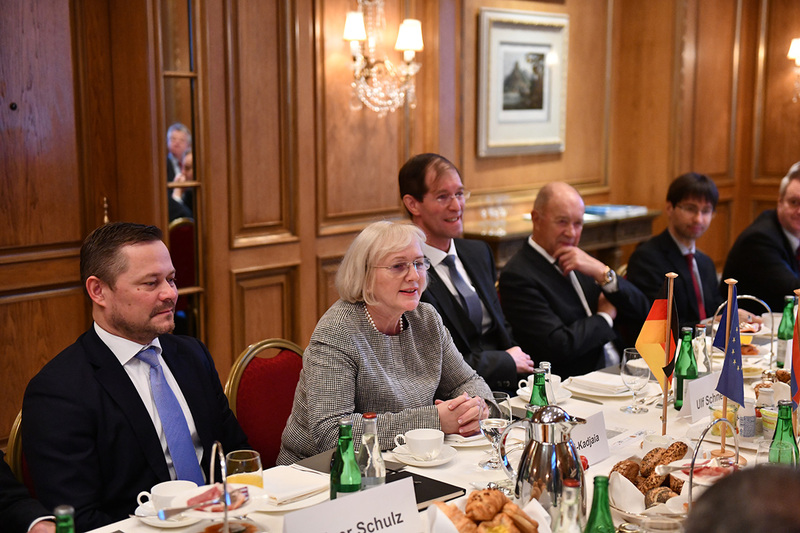 Present at the meeting was the President of the Munich Conference Wolfgang Ischinger, representatives of the foreign relations and defense agencies, members of the Bundestag and European Parliament, well-known security experts, heads of research institutions. 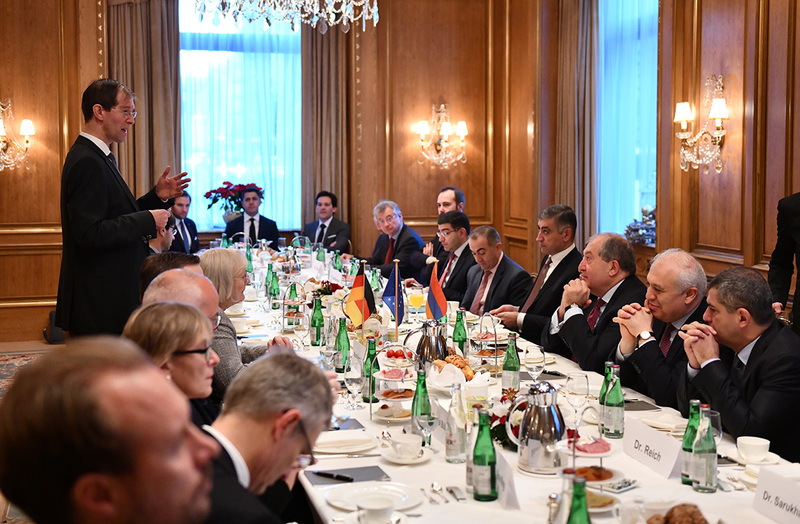 Discussed were issues pertinent to the global security, rapid changes taking place in the world, existing challenges and threats and avenues to thwart them. 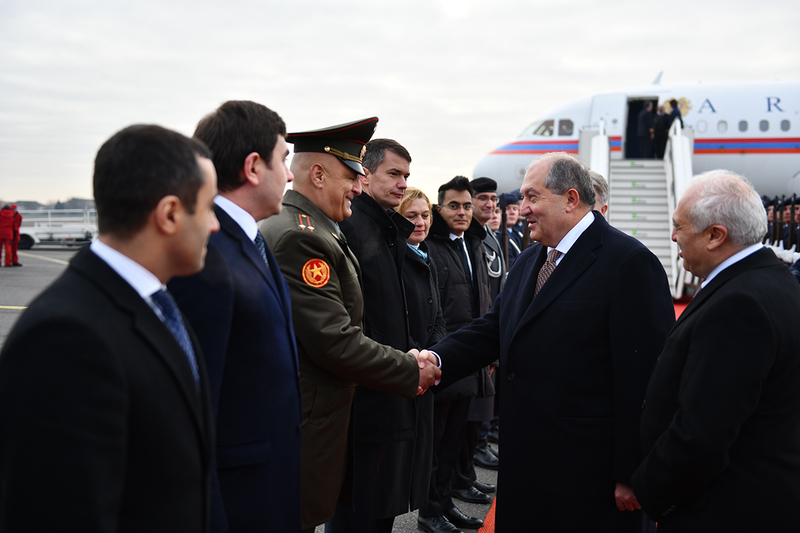 In his remarks, President Armen Sarkissian noted in particular that Armenia is open for cooperation and is ready to become a platform for various discussions. 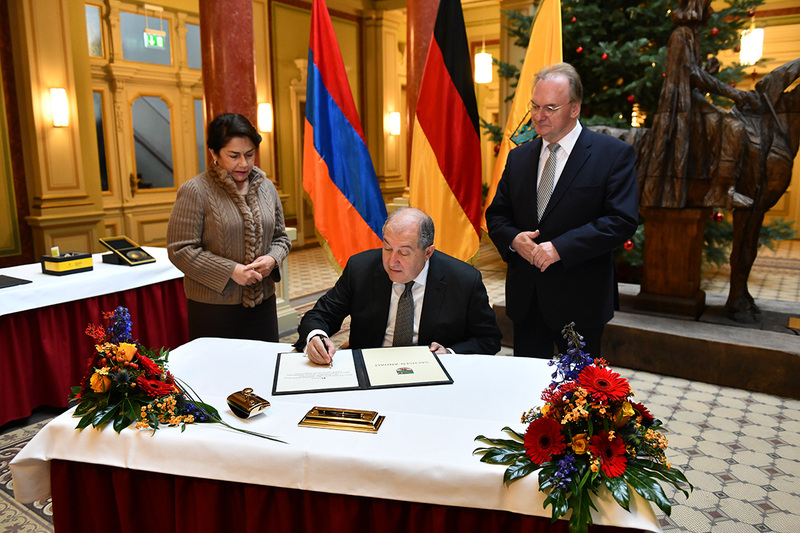 The official ceremony of welcoming President Armen Sarkissian and Mrs. Nouneh Sarkissian took place at the Bellevue Palace – residence of the President of the Federal Republic of Germany. 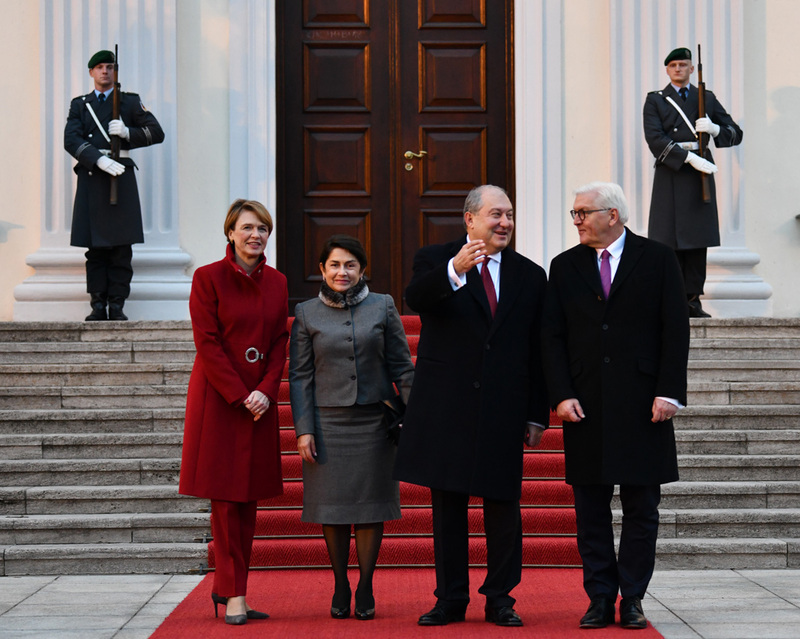 President Frank-Walter Steinmeier and Mrs. Elke Büdenbender welcomed President Sarkissian and Mrs. Nouneh Sarkissian at the entrance of the Palace and accompanied to the hall, to make an inscription at the Book of Honorary Guests. 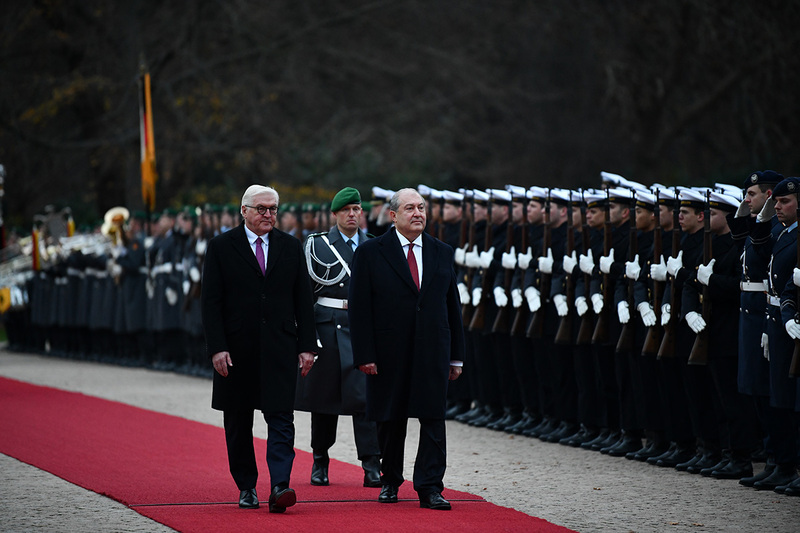 The military band played the state anthems of Armenia and Germany, and the two Presidents accepted greetings of the honor guard. 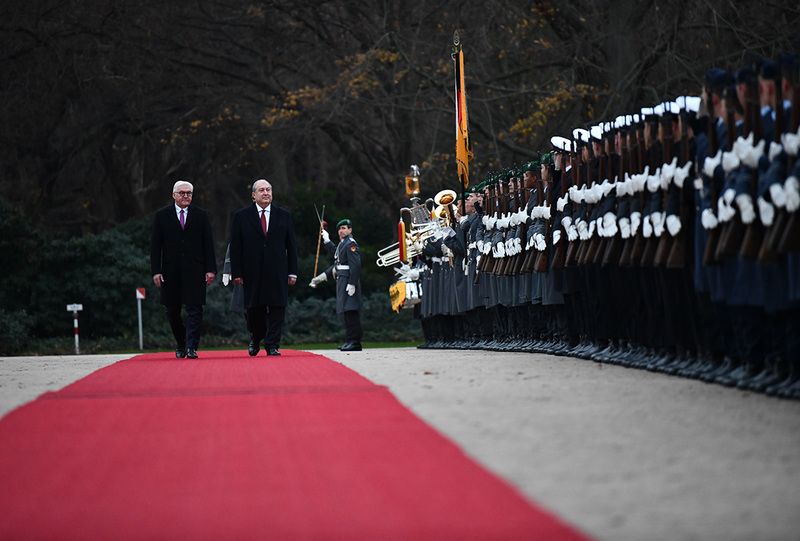 Later, Presidents Sarkissian and Steinmeier had a private meeting which was followed by the meeting in the extended format with the participation of the delegations. 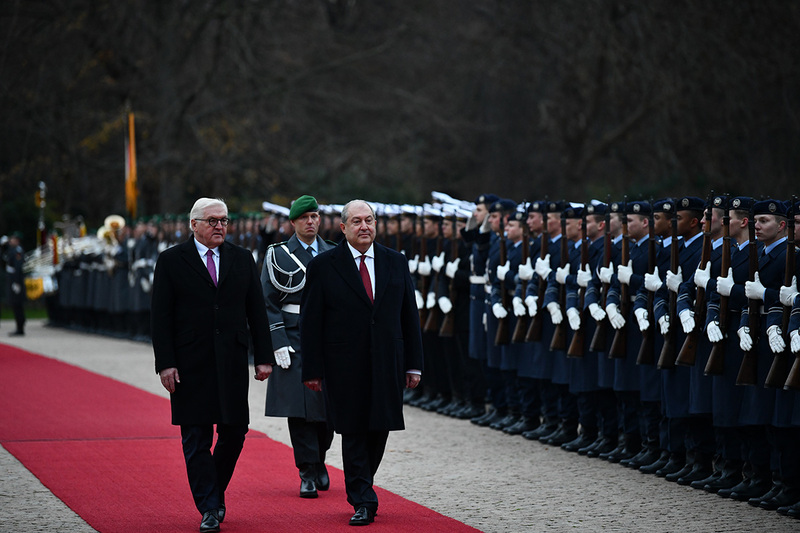 The President of Germany welcomed Armen Sarkissian and saluted his first official visit to Germany. 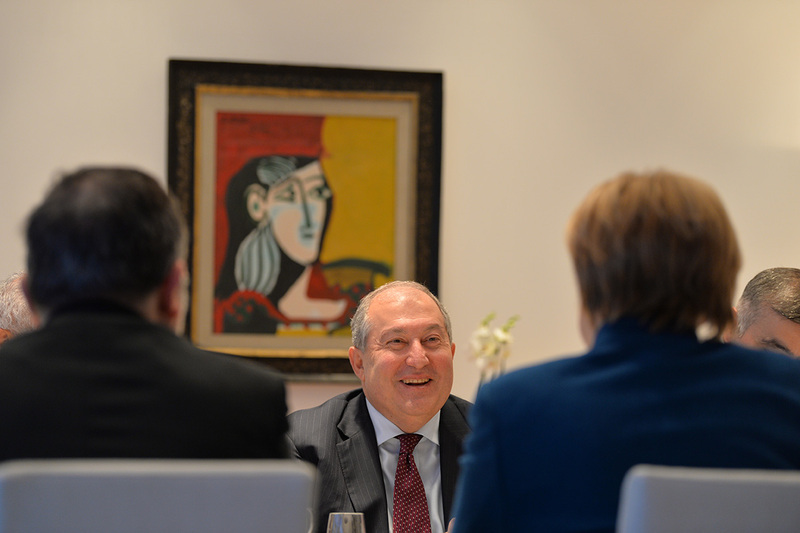 He also spoke of the recent changes in Armenia and hailed their peaceful nature. 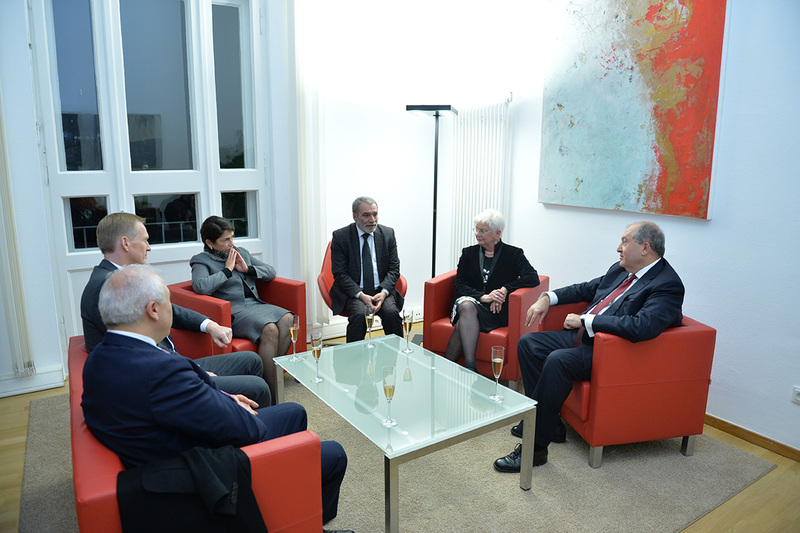 In his remarks President Sarkissian noted that he was glad to conduct an official visit to Germany. 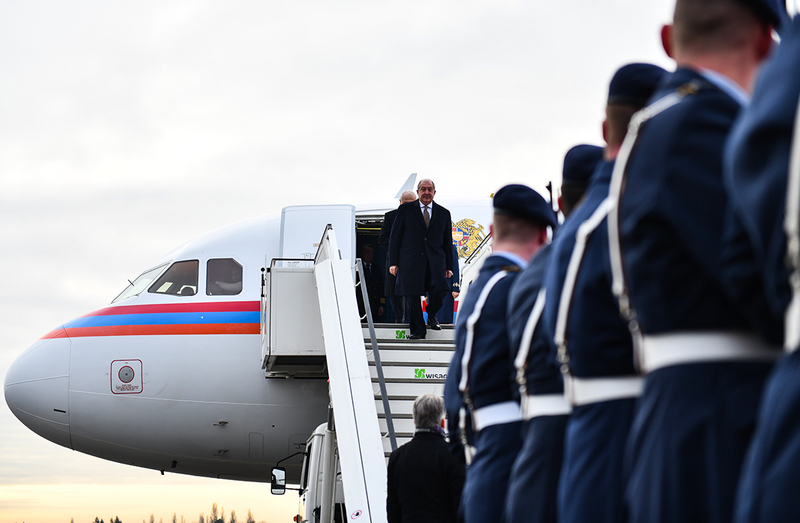 “I am glad to be hosted in the friendly Germany in the framework of my first official visit. 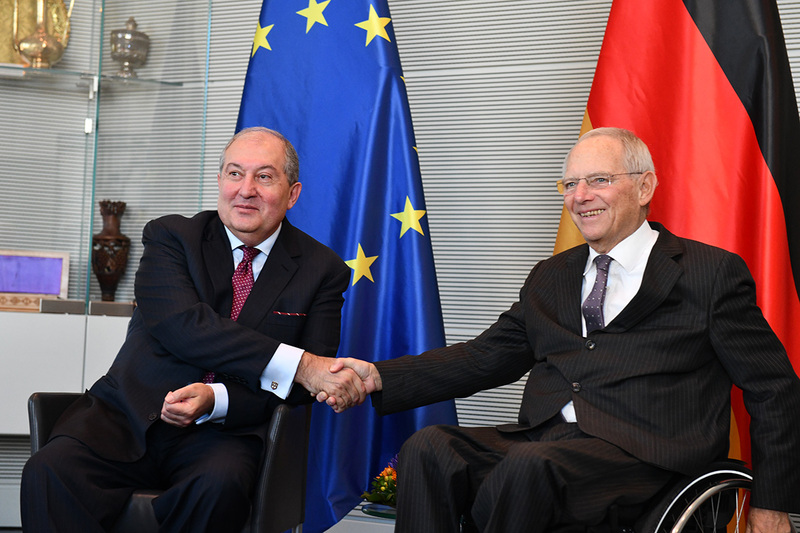 Germany is Armenia’s friend, one of our primary economic partners, an active supporter of the Armenia-EU agenda. 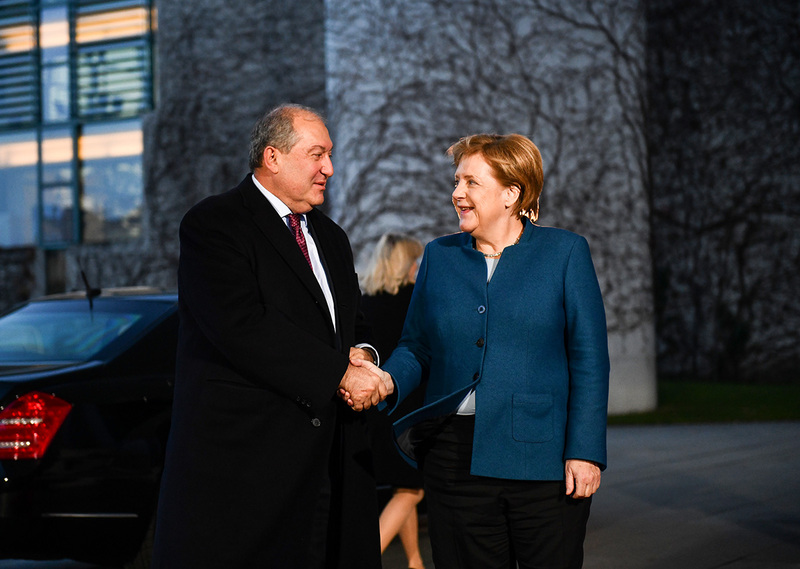 Germany is also interesting for us as a country with a parliamentary system of governance and the German experience of parliamentary democracy is very important for us and might be instructive,” President Armen Sarkissian said. 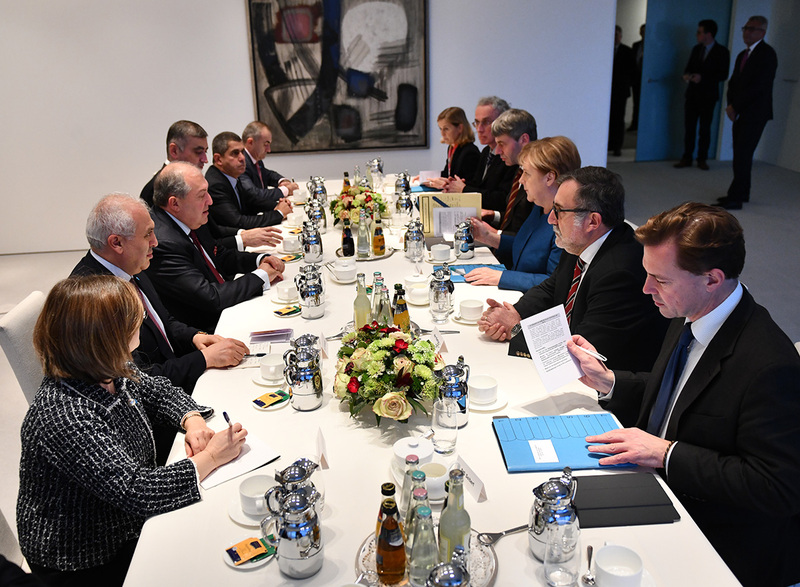 Hailing the financial, technical, and economic assistance provided by Germany to our country as well as the support to democracy and legal reforms, President Sarkissian stressed the importance of expanding cooperation in the educational, scientific, and cultural areas. 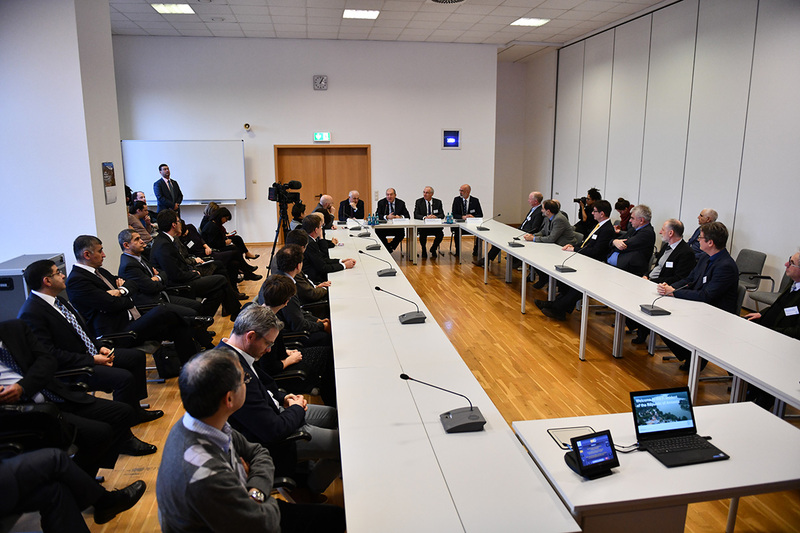 Cooperation in the area of technologies was viewed as especially promising as well as the implementation of the programs for students and science workers exchange. 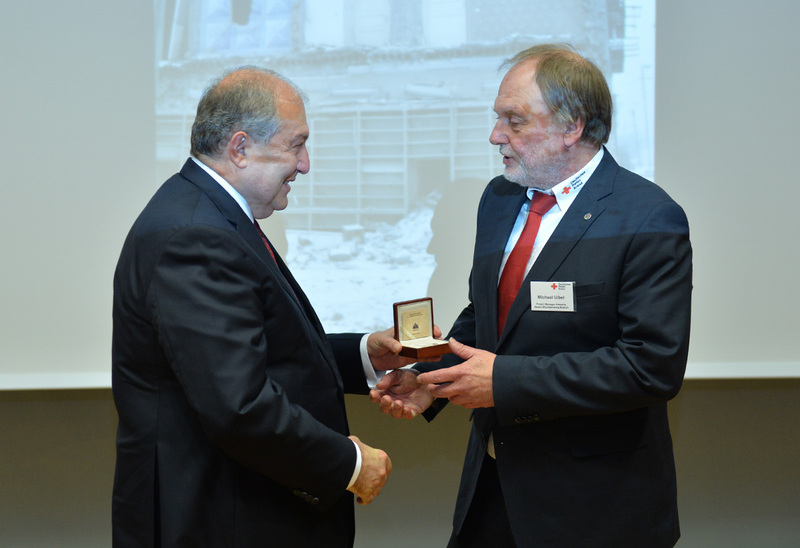 The German Red Cross, which is providing humanitarian assistance all over the world in the areas affected by natural disasters and armed conflicts, started its activities in Armenia in 1988, right after the earthquake in Spitak. 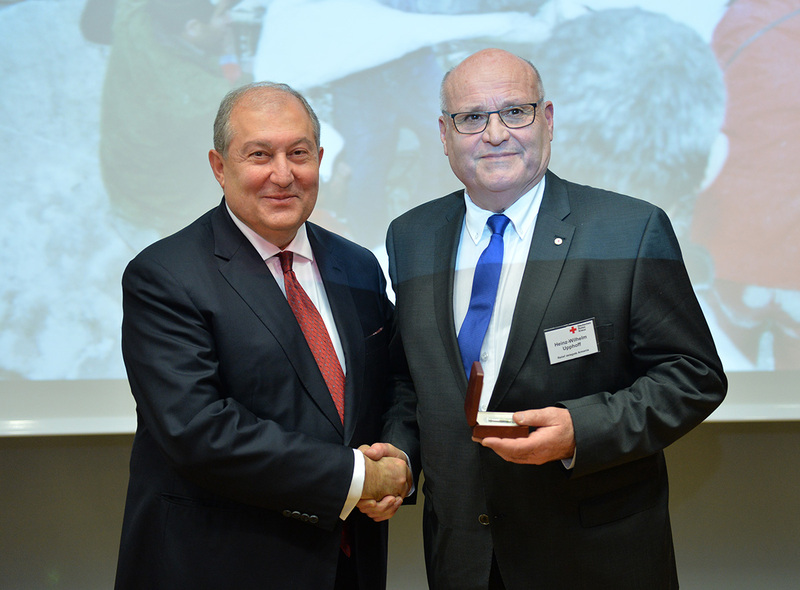 The organization had actively participated in the rescue works and later, in cooperation with the Armenian Red Cross, provided large-scale and many-sided assistance to the affected population. 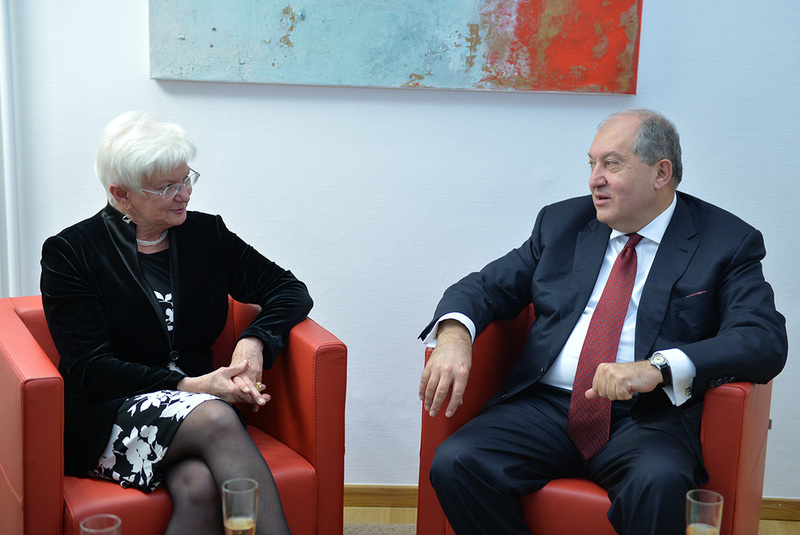 President Armen Sarkissian met with the President of the German Red Cross Gerda Hasselfeldt, expressed gratitude for landing a hand at that difficult for the Armenian people times. 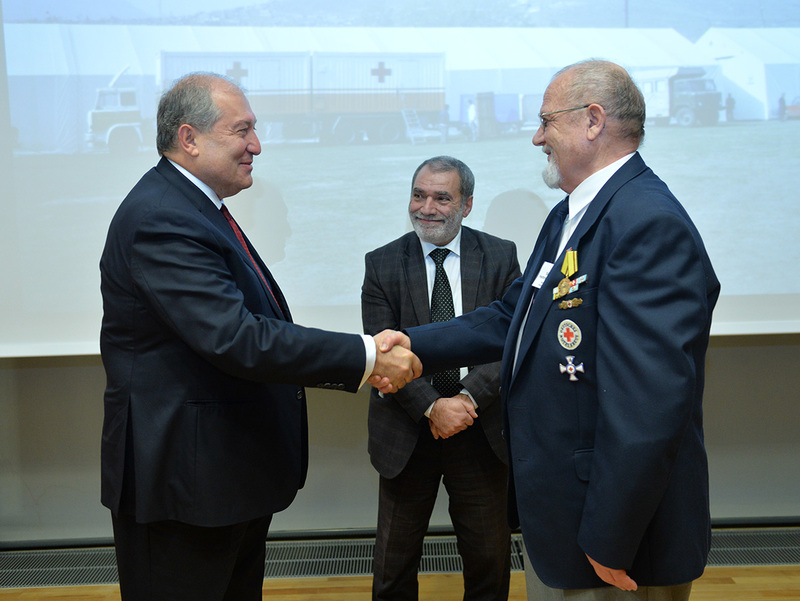 At the meeting, President Sarkissian handed RA state awards and souvenirs to a group of employees of the German Red Cross. 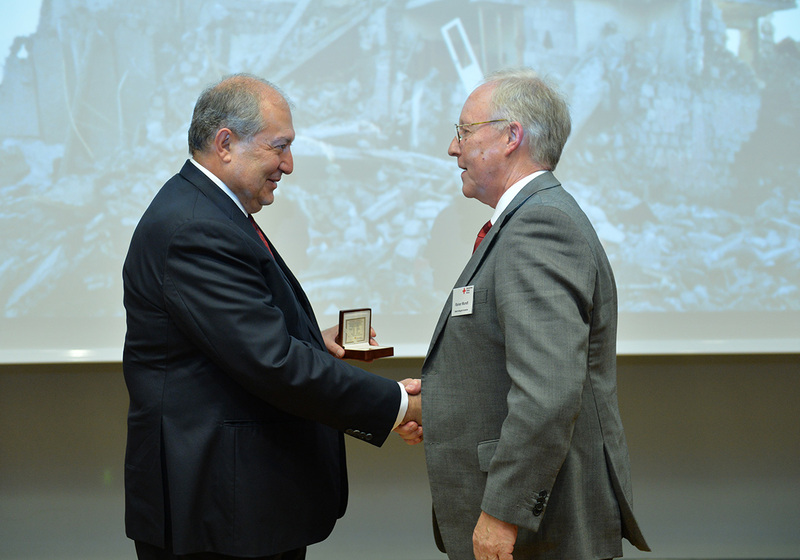 For the practical participation and tireless humanitarian activities aimed at the mitigation of the devastating Spitak earthquake, Deputy Secretary General of the German Red Cross Johannes Richter was awarded the Mkhitar Heratsi medal, and German Red Cross representatives Zigrfid Hetmannschperger and Carl-Heinz Scheiden were awarded Medals of Gratitude. 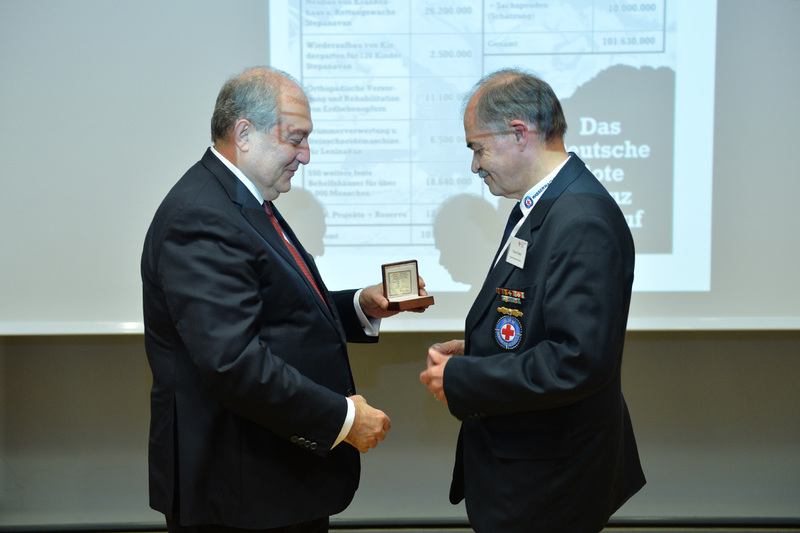 Addressing President of the German Red Cross Gerda Hasselfeldt, President Sarkissian asked her to convey his words of gratitude to thousands of German Red Cross workers, all those who are contributing their time, life, and compassion to help other overcome difficulties. 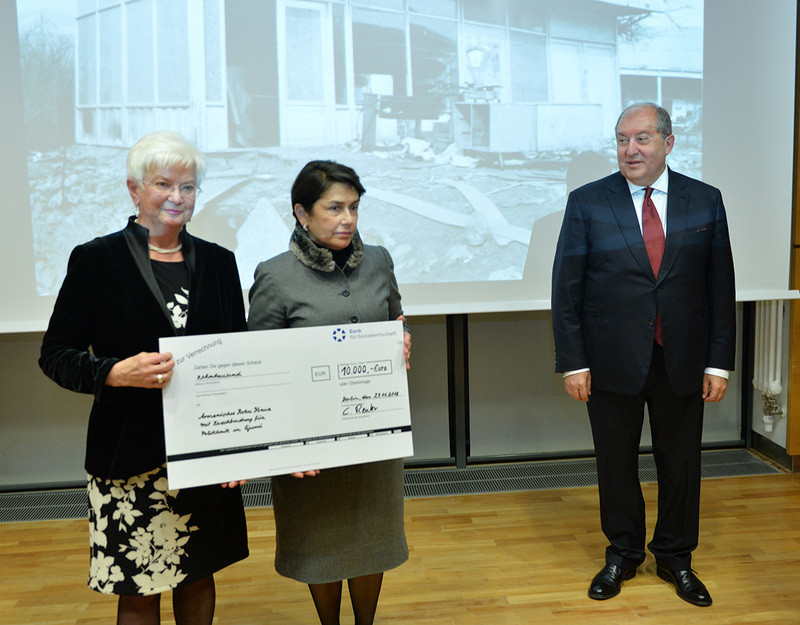 President Sarkissian thanked for the gift and added that he would make a donation for the same amount also earmarked for the renovation of the “Berlin” outpatient clinic in Gyumri as a token of a true friendship of the two nations and the opportunity to undertake tasks of a greater scale. 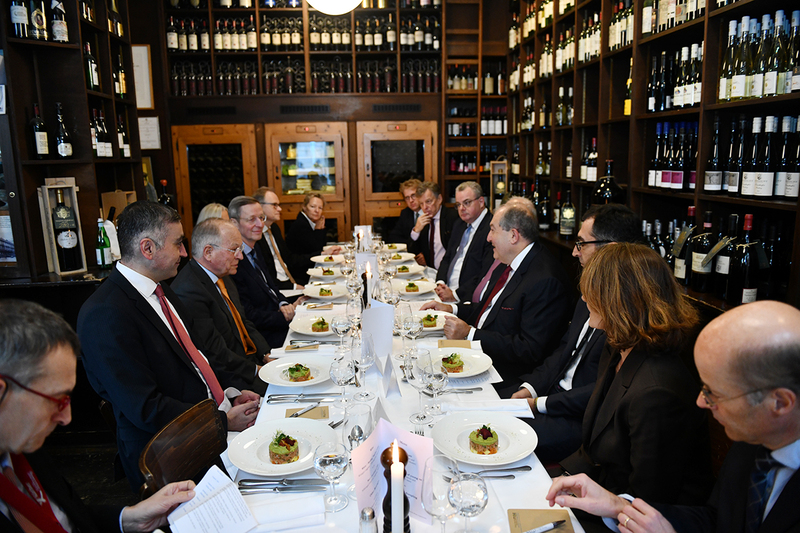 President Armen Sarkissian, who is in Germany on offcial visit, on November 28 had a wokring lunch with the heads of a number of leading German companies who are working in Armenia or are interested in doing business in Armenia. 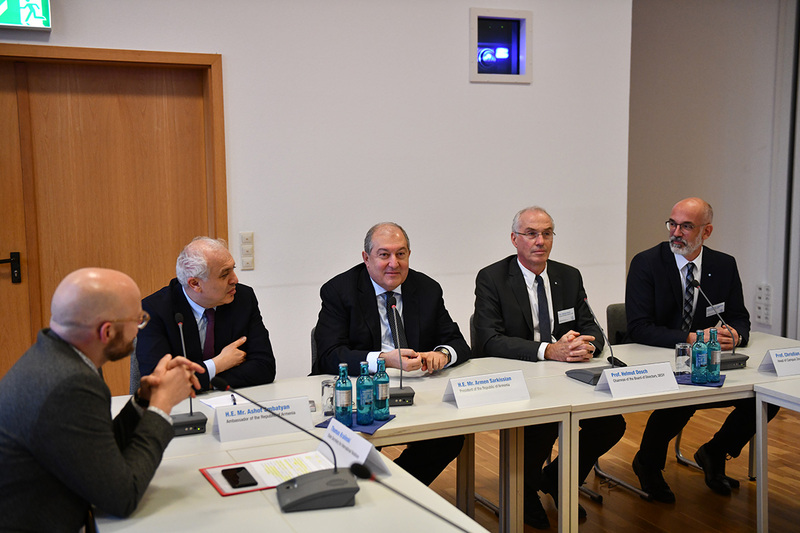 The meeting was organized by the Embassy of Armenia in Germany, OWC publishing house, Oriental Commision of the German Economy and ''Eastern Europe: Union of Small and Medium Enterprises''. 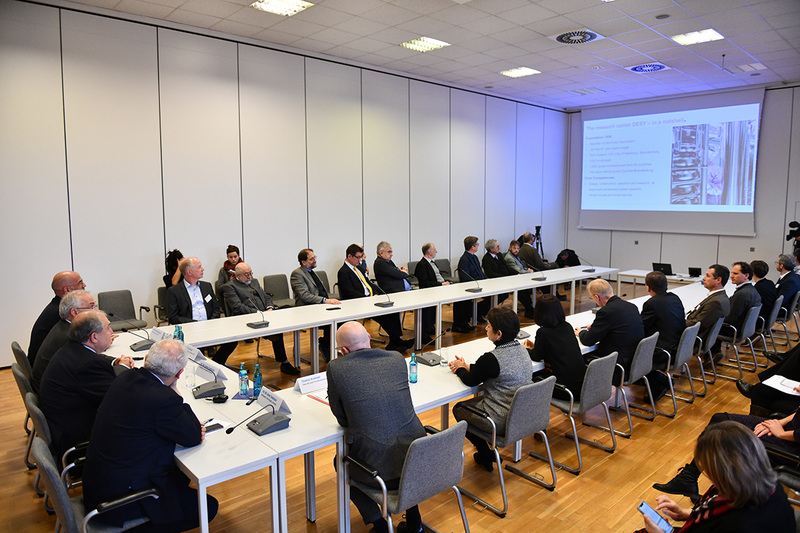 The meeting was attended in particular by the heads of Zepeling, Simmens, SAP, Nokia, Schneider Group, Airbus Group and other companies. 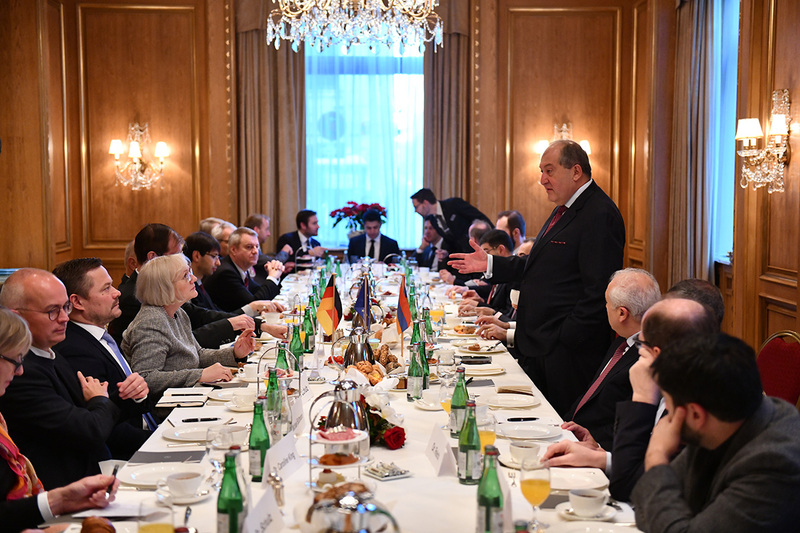 Noting that in different areas of the Armenian economy, a number of companies with German captial is working quite successfully, President Sarkissian at the same time expressed confidence that there is a great potential to expand and deepen cooperation in these areas. 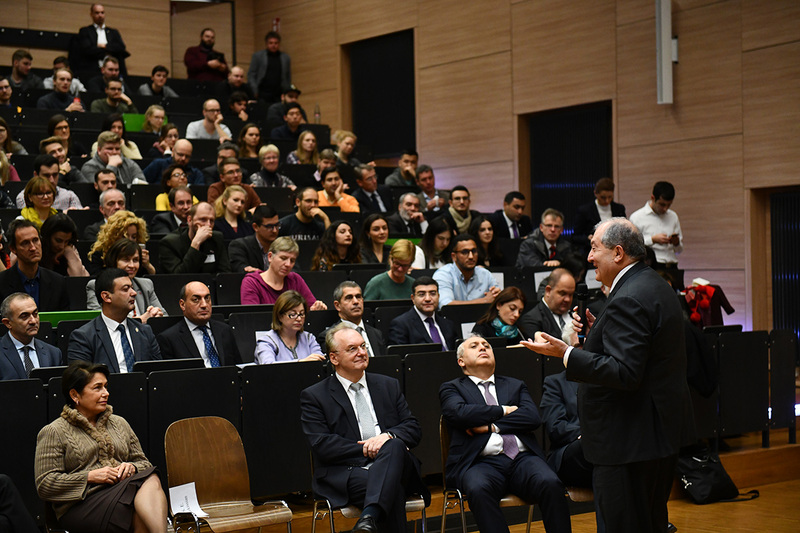 President Sarkissian said that the 21st century is a period of rapid changes, and Armenia is the right country, at the right place: ''It's the right time because we live in the beginning of the 21st century. This is a period of time when everything is changing fast. 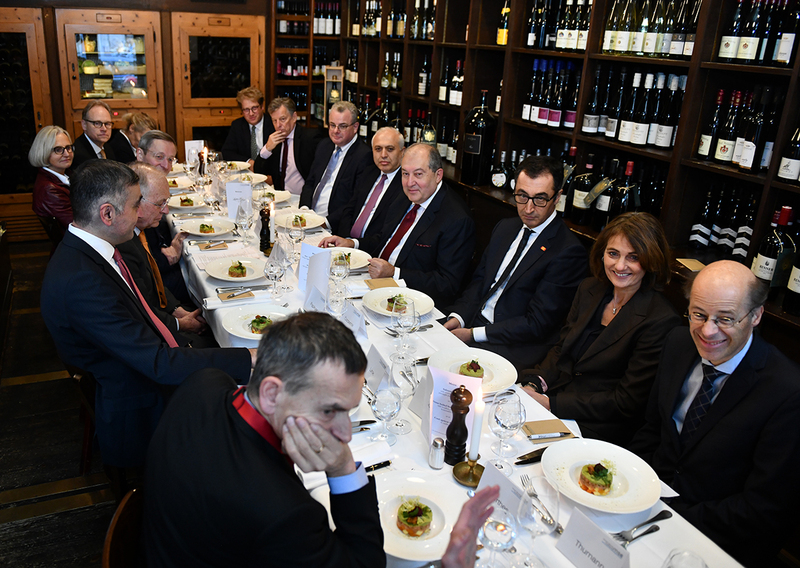 It's no secret that recently I have finished my book titled «Quant behaviour of global risks». When I say quant, it doesn't mean that laws of the quant mechanics are applicable. Quant means that the behaviour is not classical any more. 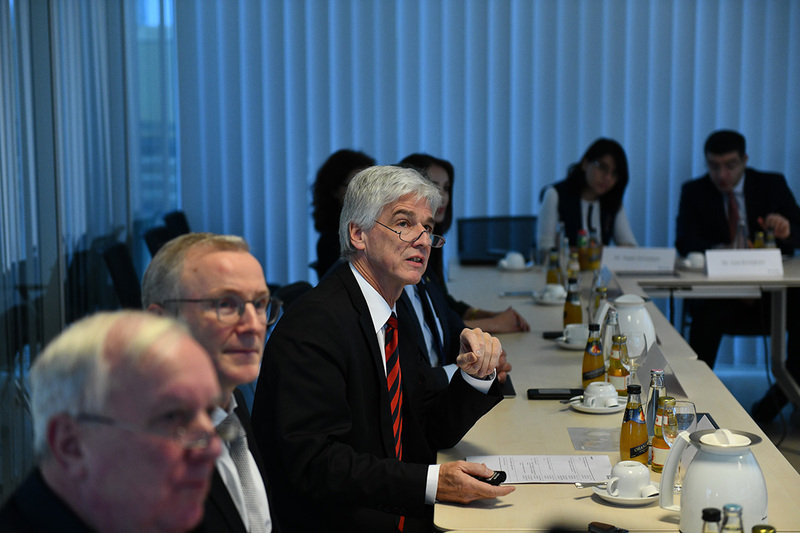 Means to manage and describe risks in the 21st century are also not classical and will not be. 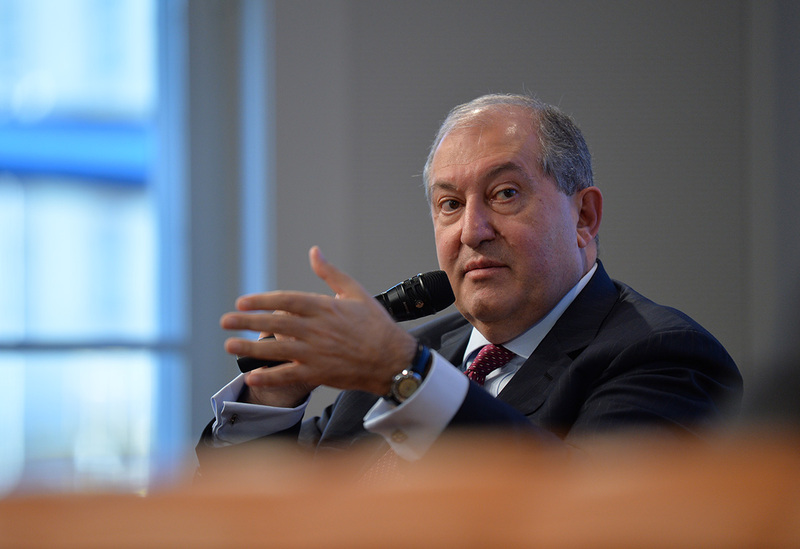 From this point of view, this is the right time for Armenia,'' President Sarkissian said and added that the humanity is going through a rapid evolution and with each year things are changing faster and faster. 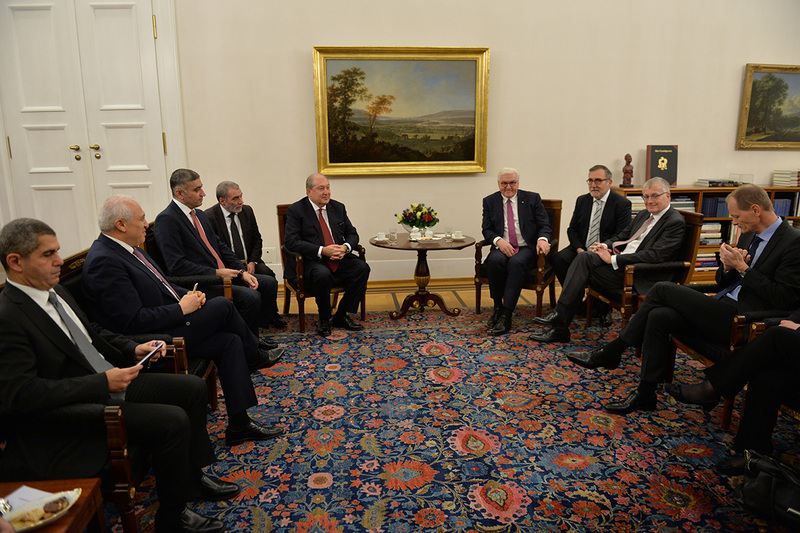 The President said that Armenia has been at the crossroad of civilizations for centuries. 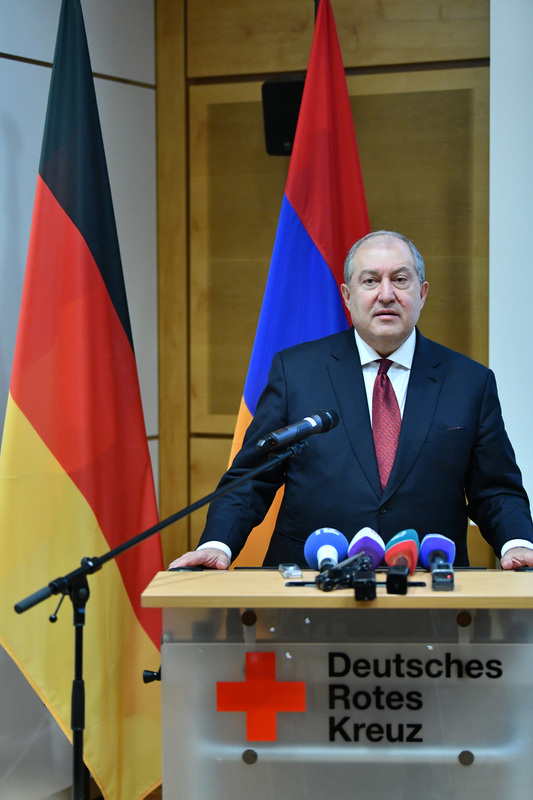 ''That crossroad may become a bridge because today Armenia is the only country which is a member to the Eurasian Economic Union which means that the country has not just a 3 million strong market but 200 million which includes Central Asia and Russia. 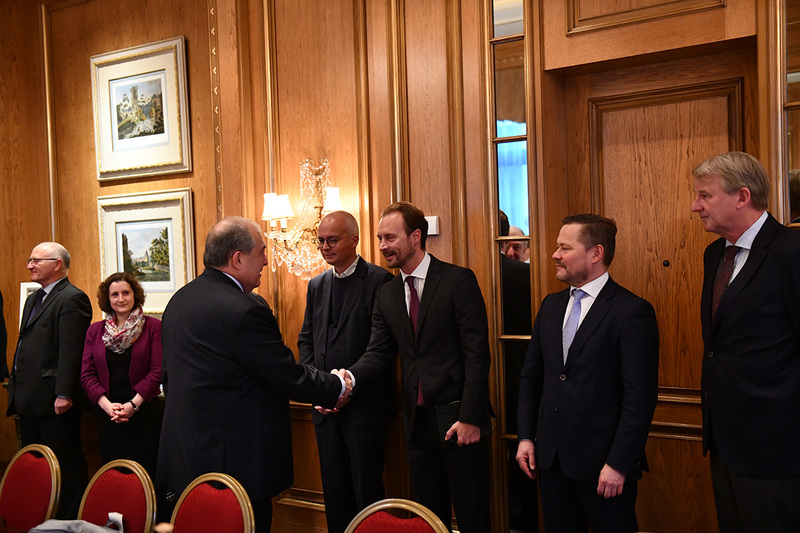 Besides, Armenia signed the Comprehensive and Enhanced Partnership Agreement with the EU, and we are striving to deepen cooperation with that structure. 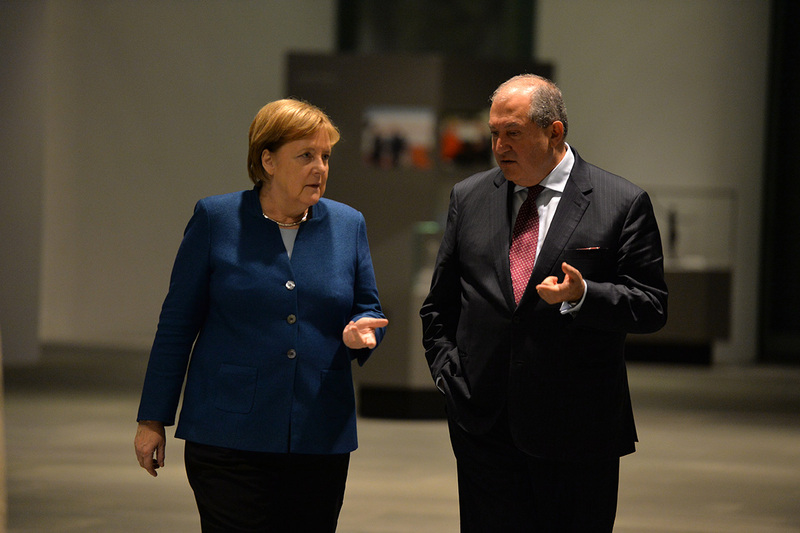 It means that Armenia is the only country which maintains strong relations with the East and the West at the same time. 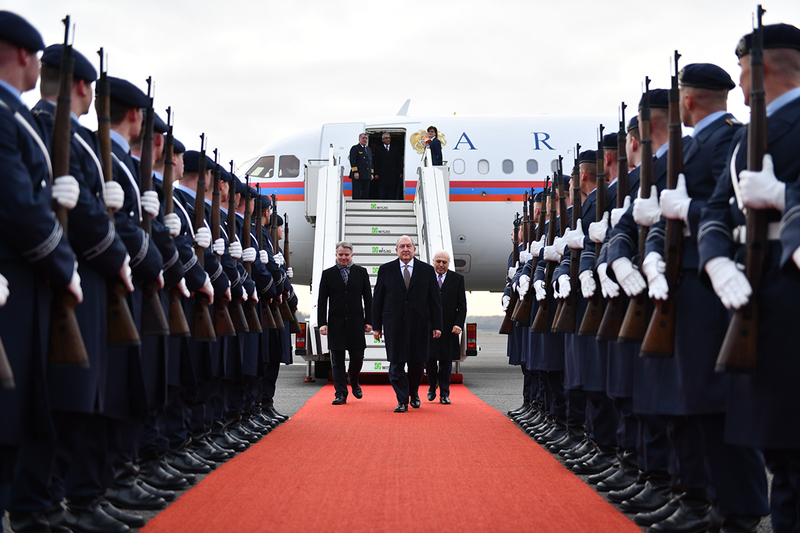 Our country is at the right place,'' the President of Armenia underscored. 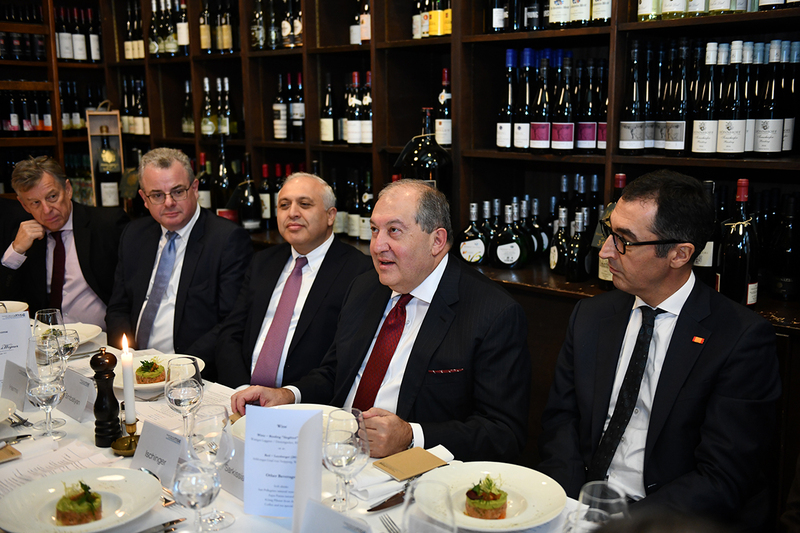 President Sarkissian presented to the entrepreneurs the primary areas of the Armenian economy, attractiveness for investments and business climate, competative advantages for doing business in Armenia. 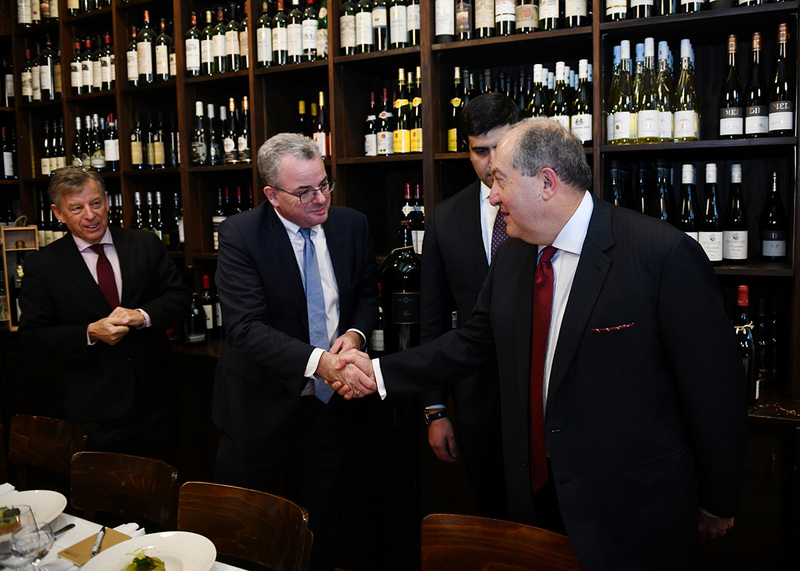 ''Armenia is an interesting place to make investments. 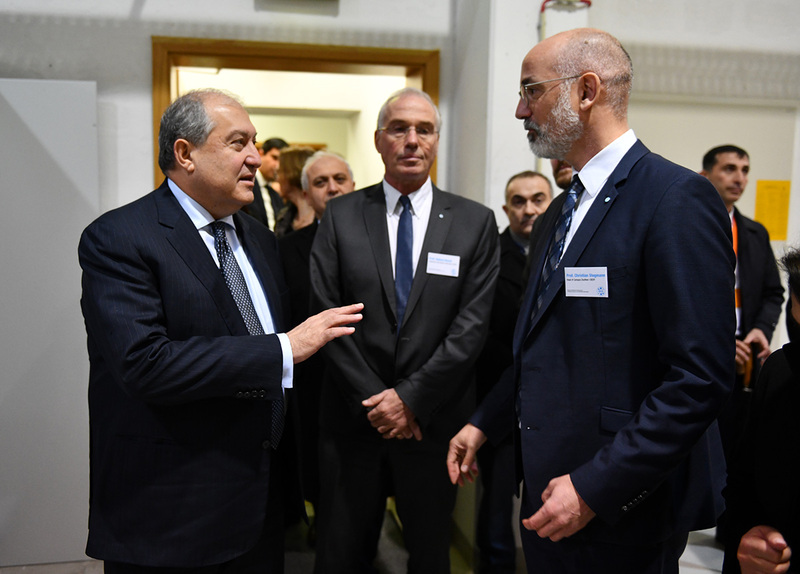 The country has a great potential in different areas ranging from agriculture to light industry, banking system and information technologies,'' Armen Sarkissian said. 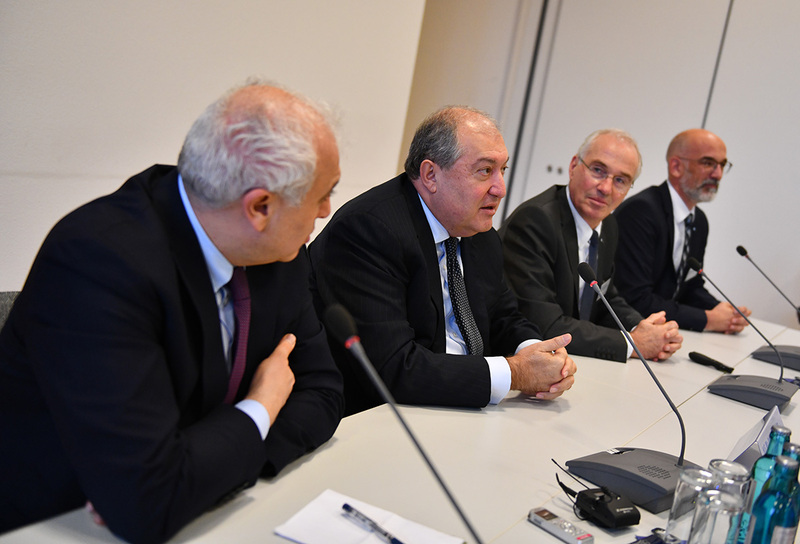 Heads of the companies working in Armenia told about their current programs and opportunties to expand them. 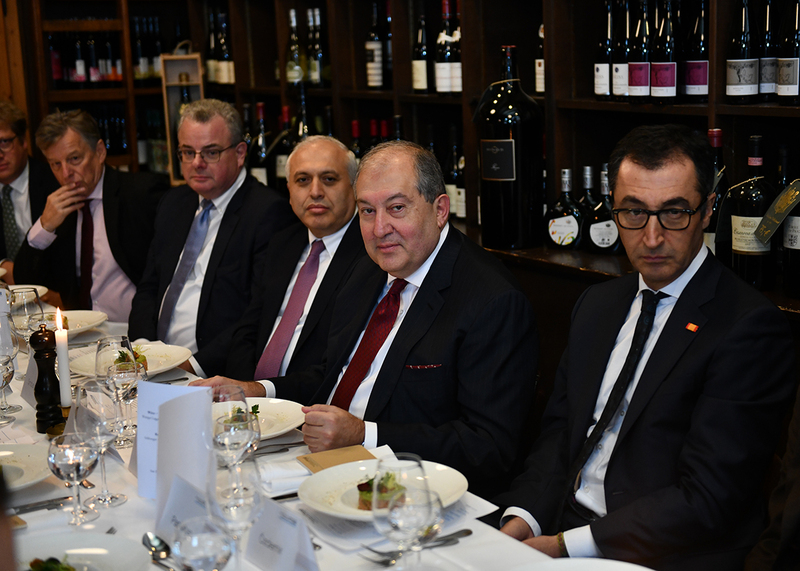 To other businessmen participating at the meeting, President Sarkissian suggested to visit Armenia to study at the spot perspective areas of cooperation and to discuss mutually beneficial cooperation. 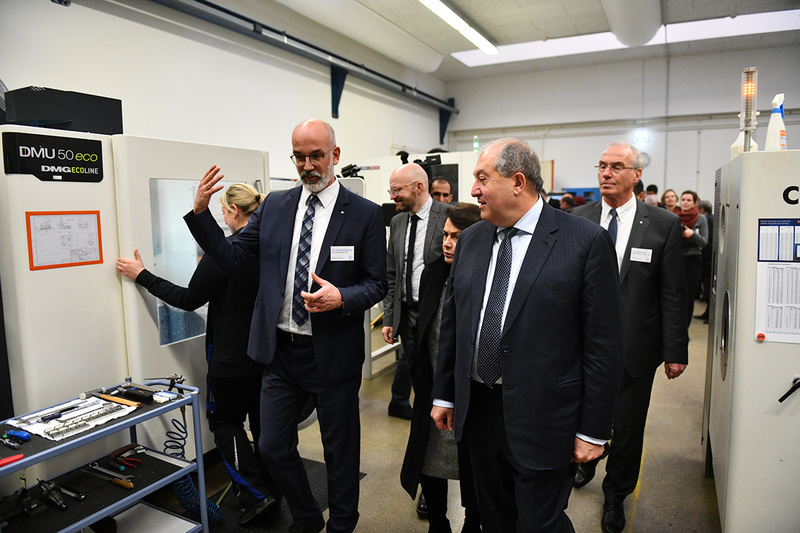 President Armen Sarkissian and Mrs. Nouneh Sarkissian visited today the Fraunhofer Institute for Production Systems and Design Technology (Fraunhofer IPK) which is specializing in developing innovative technological solutions for the entire spectrum of production processes. 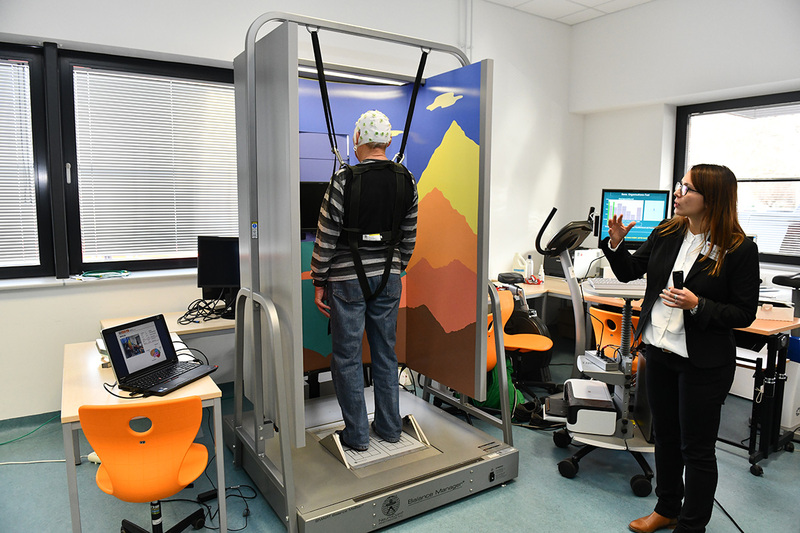 The Institute is also implementing research programs aimed at the development of innovative ideas. 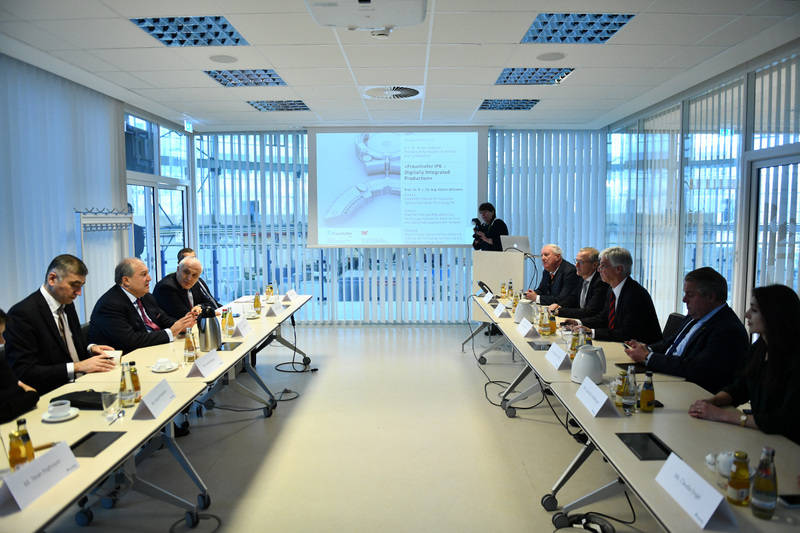 Fraunhofer IPK has over seventy scietific and research centers and is working in a number of countries. 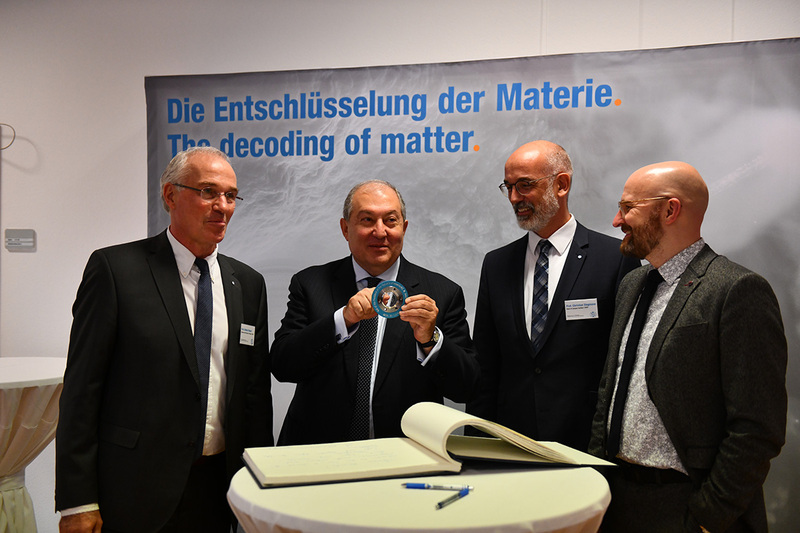 Since 2016, Fraunhofer IPK is cooperating with the Mesrop Mashtots Institute of Ancient Manuscripts – Matenadaran, in the framework of the program on digitalization and vitrual restoration of ancient and medieval manuscripts. In 2017, the works on the digitalizaiton and restoration of Narek prayer book manuscript of 13-14 centuries commenced. 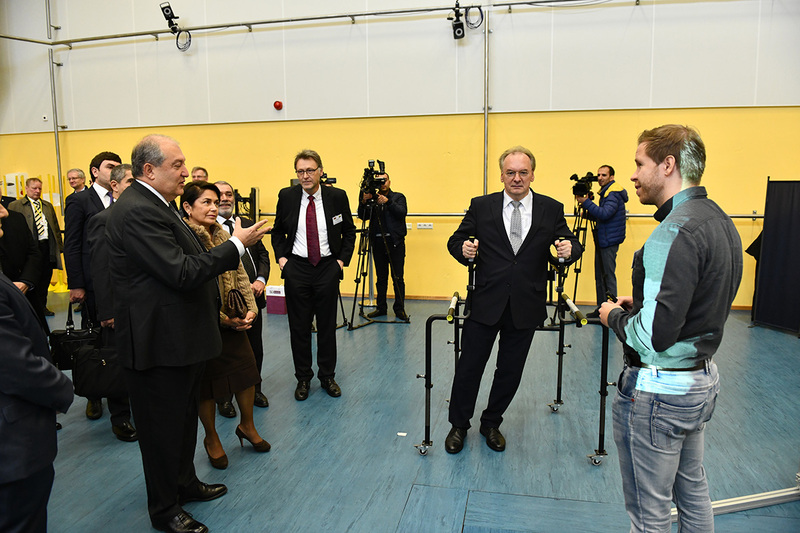 Accompanied by the Director of the Institute Eckart Uhlmann, President Sarkissian and Mrs. Sarkissian toured the Production Technologies experimental hall and familiarized with the activities of the establishment. It was noted that this valuable manuscript was torn and in a rather bad condition, some of the pages missing. Thanks to a unique technology, the missing pages were virtually restored and pieces were digitalized. 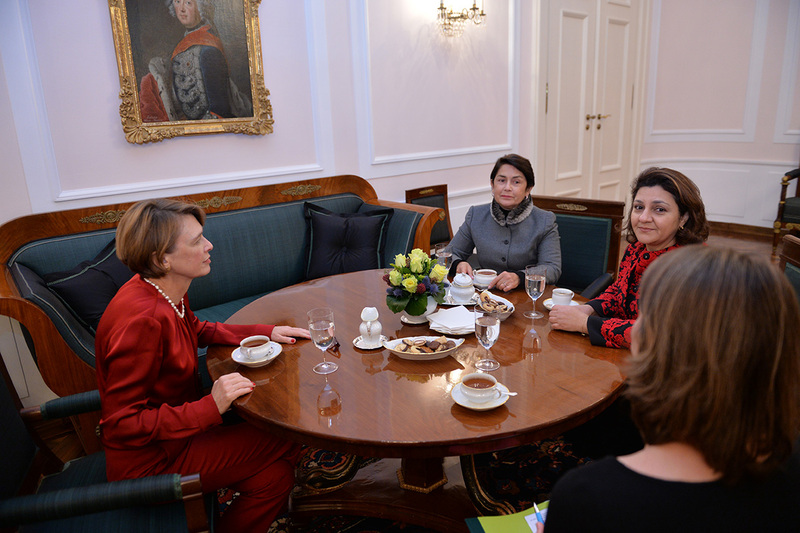 At the meeting, discussed were also opportunities for future cooperation with Armenia. 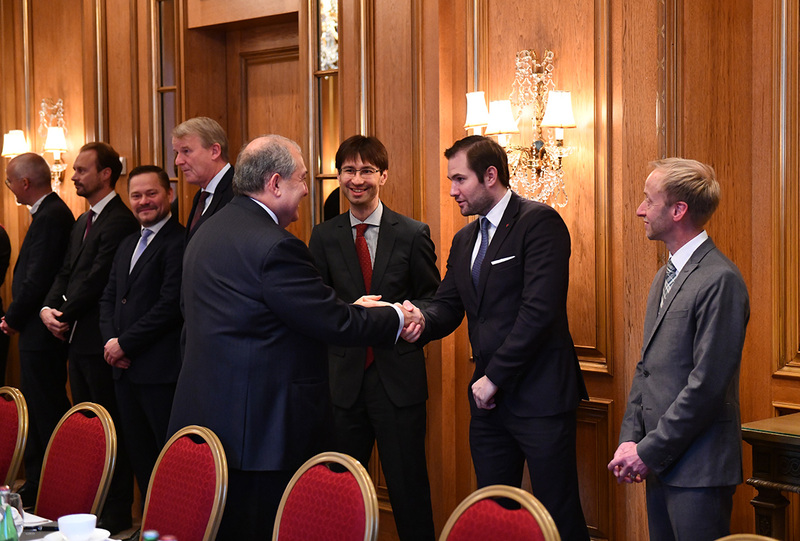 The leadership of the Fraunhofer IPK informed that they were interested in carrying out projects in Armenia and noted that they had some ideas regarding colaboration related to the areas of information and high technologies, automated systems, robotics, and others. 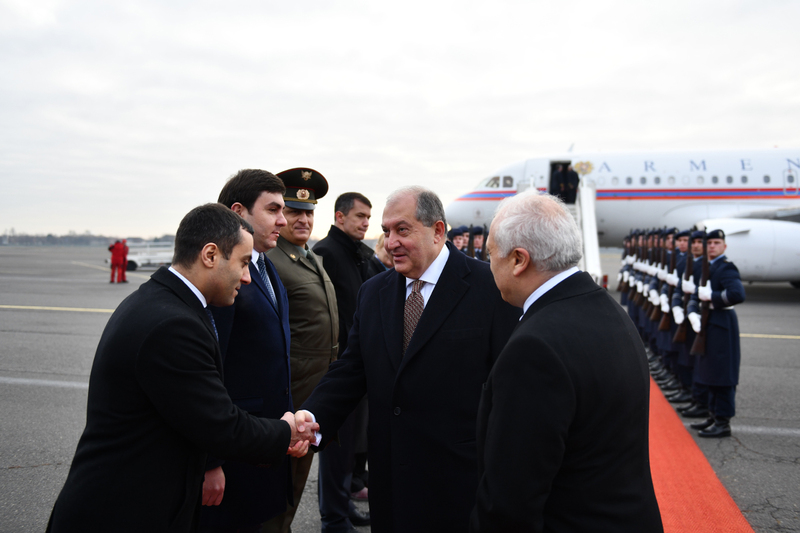 President Sarkissian stressed the importance of expanding the Institute's activities in Armenia. 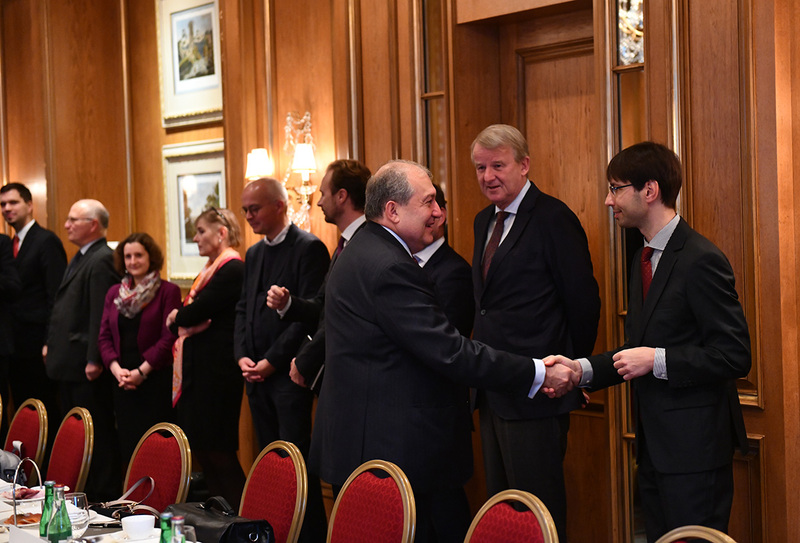 ''Fraunhofer IPK staff members have already had meetings in the Armenian government, and there is a preliminary agreement on new cooperation. 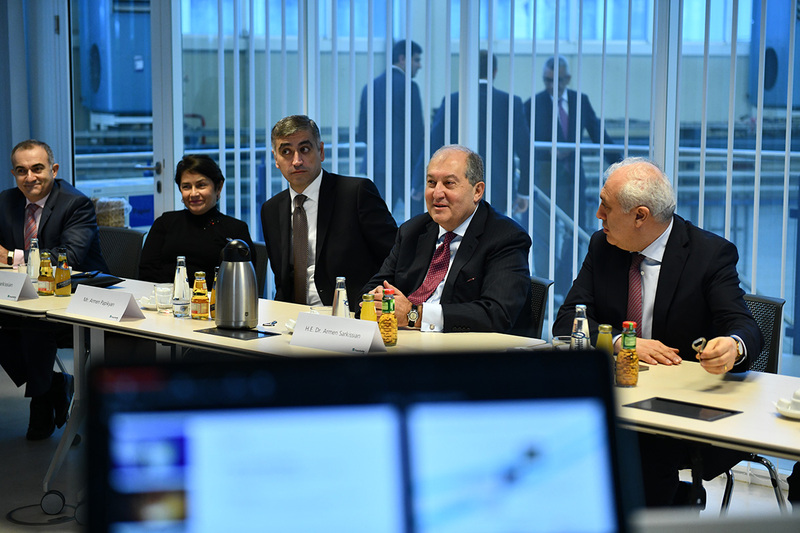 It relates not only to Matenadaran, it is also about industrial cooperation,'' President Sarkissian said in his conversation with journalists and noted that Fraunhofer may become a good partner for Armenia while the future programs may promote the development of the Armenian industry and production. 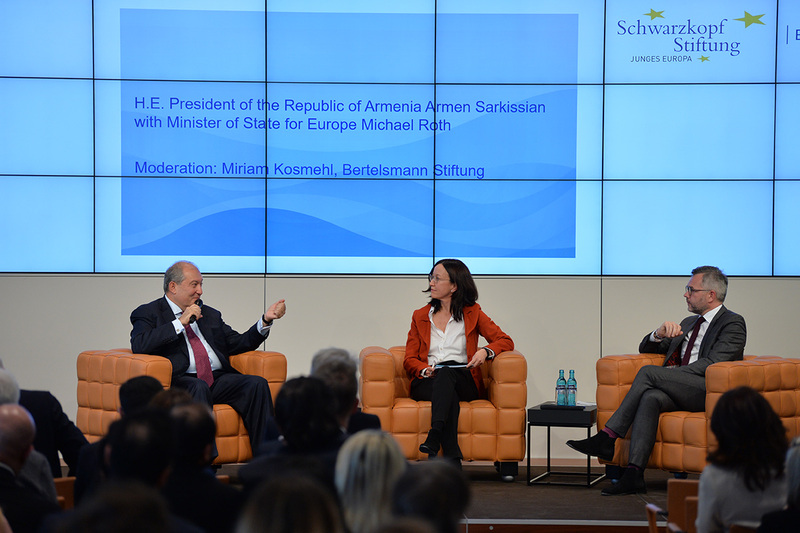 In the framework of his visit to the Federal Republic of Germany, President Armen Sarkissian was hosted at the Bertelsmann Foundation. 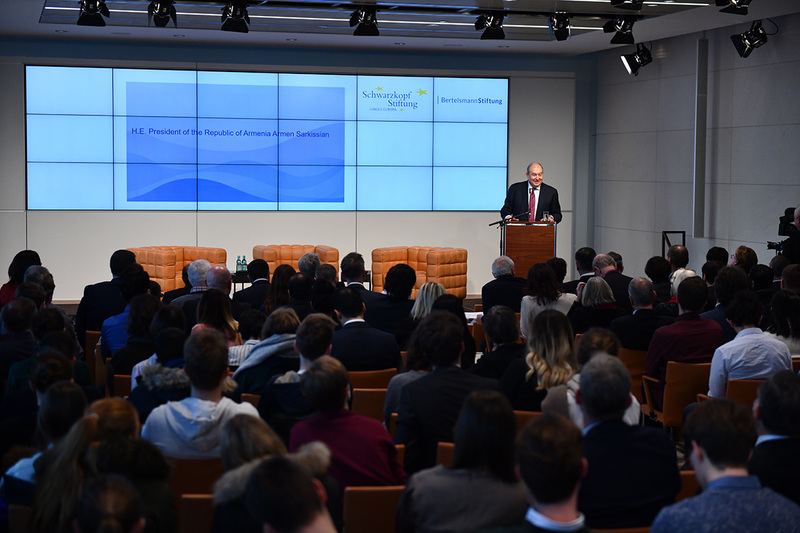 It is a famous analytical center, a thinktank which conducts research and offers solutions to resist serious global economic, political, and social challenges. 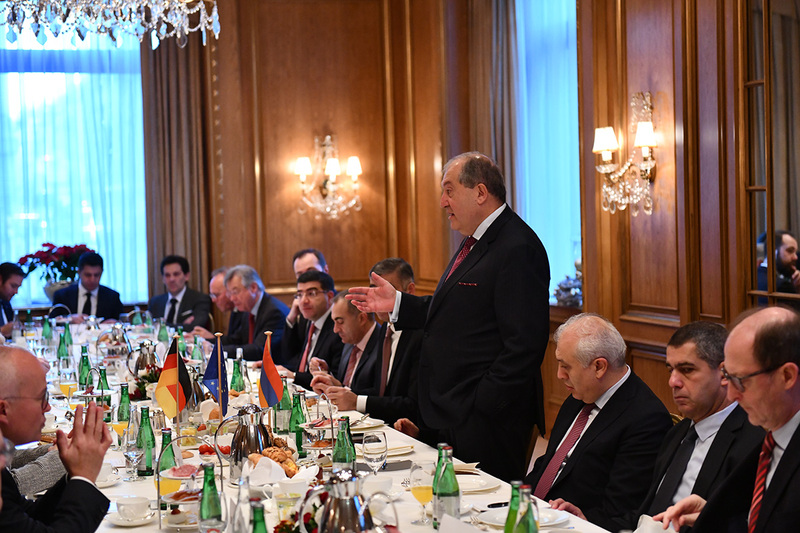 President Sarkissian made a statement titled “Armenia in 2018 and the Region”, presented Armenia’s comparative advantages and highlighted the three points which make Armenia interesting for cooperation. 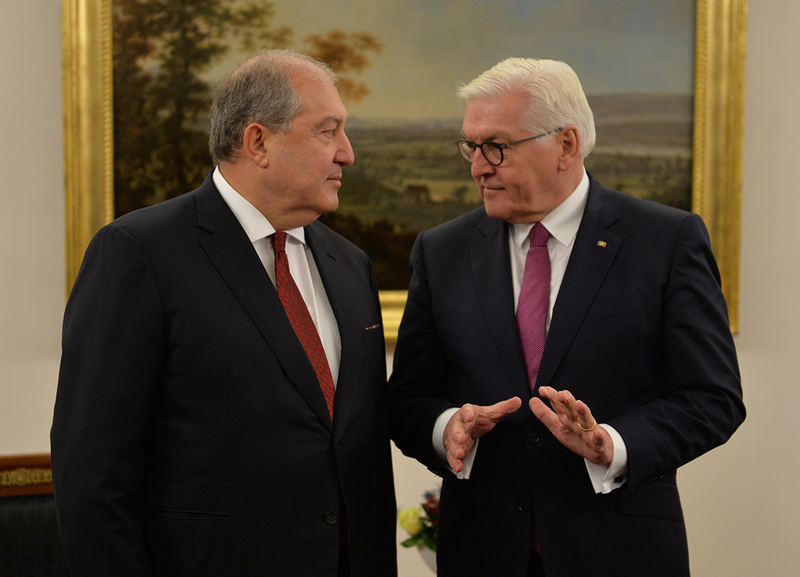 “Allow me to explain why Armenia is important today. I will concentrate on three points. These are: precise timing, the right place and the right model. We are right at the beginning of the 21st century. Everything is changing and is changing with the speed of light. 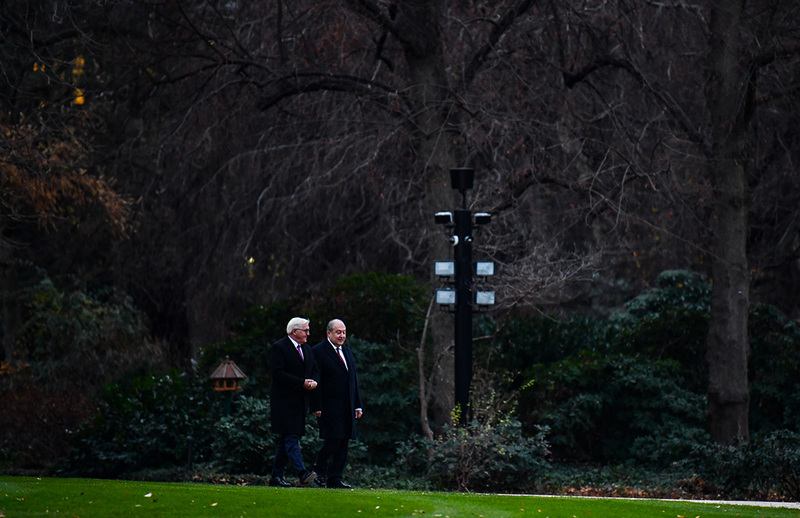 I believe, in political and economic sense, the time is right to see what’s going on in the world. Speaking of economy, we often refer to industrial revolutions. 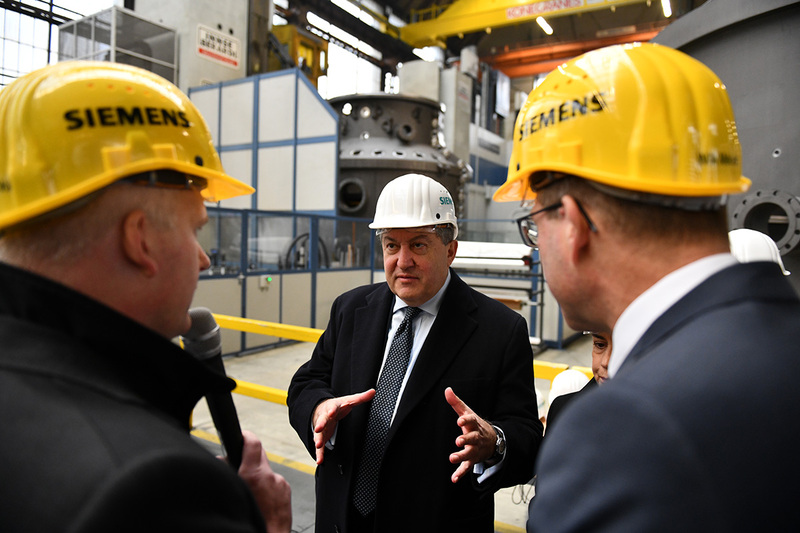 I will not agree that we are living in the period of the 4th industrial revolution because I believe it’s not a revolution that’s going on but a very fast evolution. 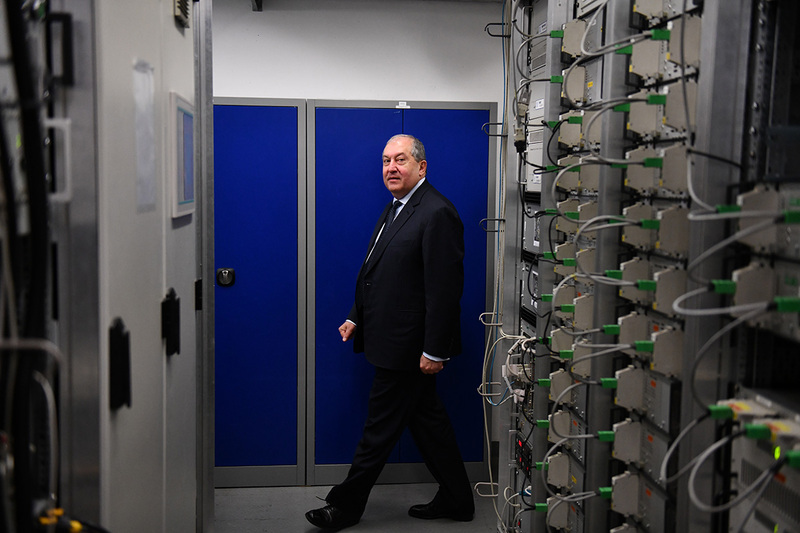 In five years, this will be a technologically different world, much more integrated and interconnected. Some would say that processes of globalization have slowed down but allow me to differ on this too. Maybe globalization has slowed down but it has turned into microglobalization and that process is unstoppable. 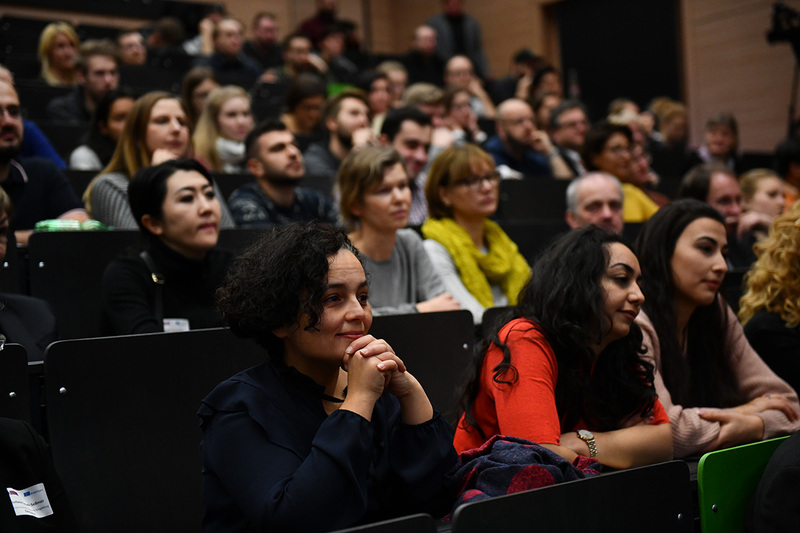 Certainly, sometimes our behavior acquires a quant nature, in the sense that it becomes possible to apply quant physics in social and political activities. It means that not everything has classical behavior, economy and politics are not working in a classical way. All this has multiple examples one of which is the Armenian revolution. 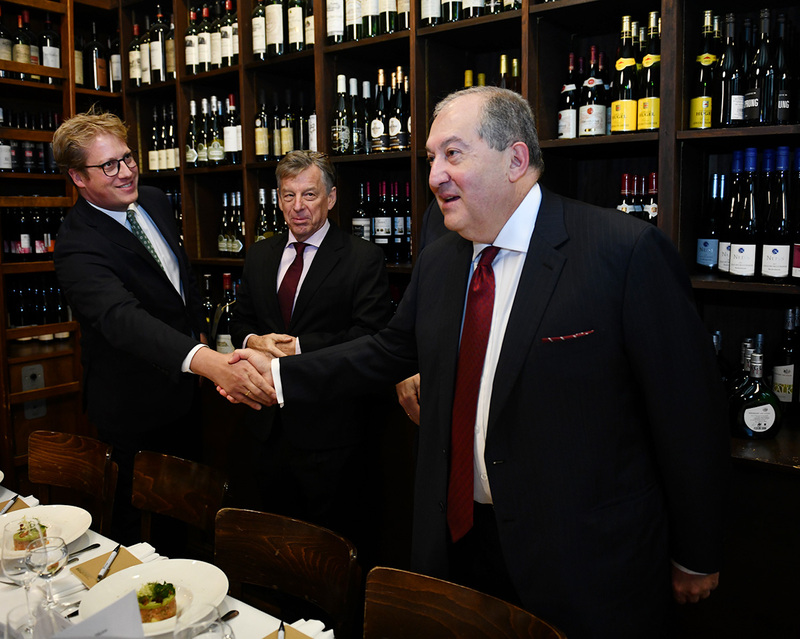 The time is right for Armenia in the sense that we have entered the 21st century of quant politics and industries. The second point or factor is the place. 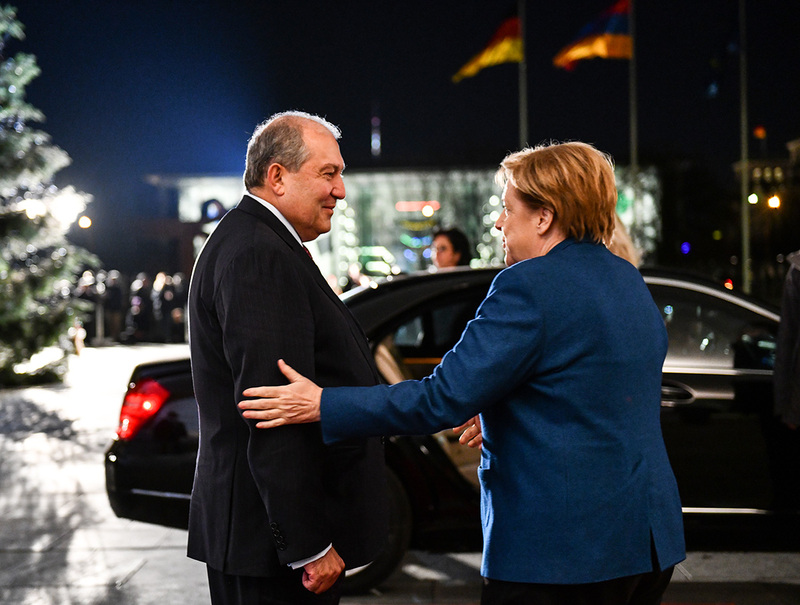 If you view Armenia’s not virtual but physical place, you will notice that Armenia – a member of EAEU, has also an agreement with the European Union. 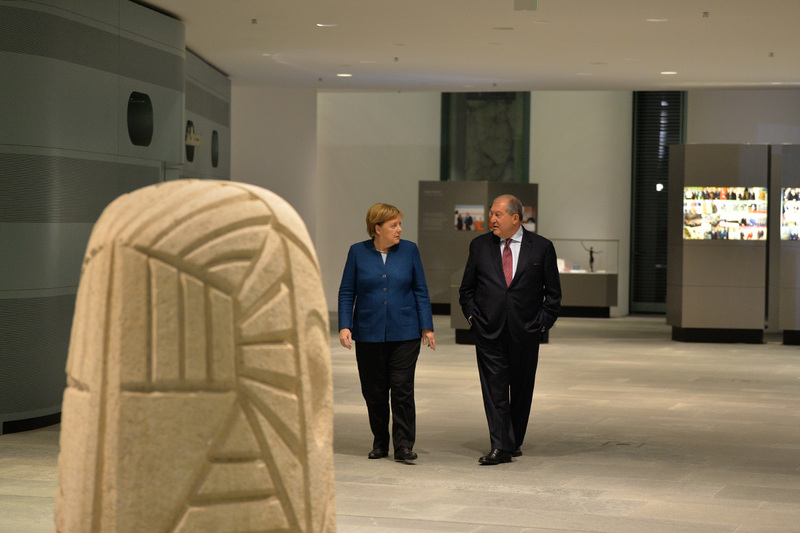 Armenia is the only country which has these two factors and may become a bridge between the West and the East. 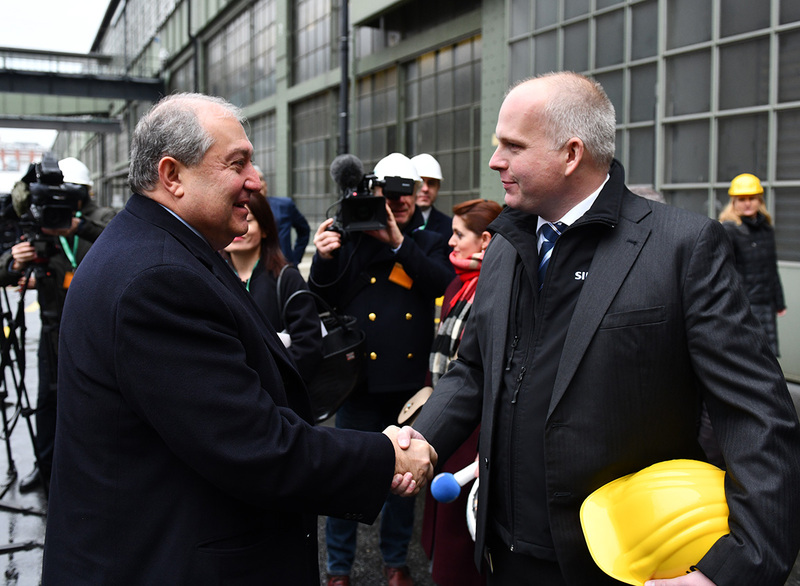 In the economic sense, Armenia can offer a much bigger market. 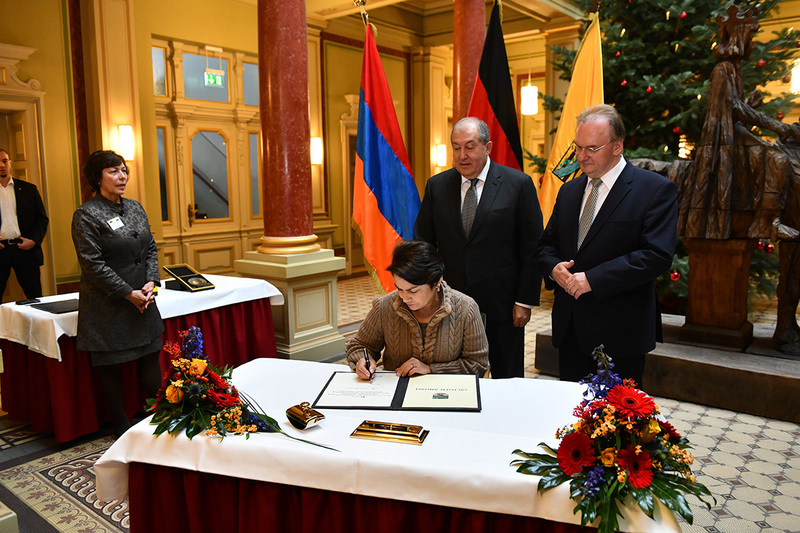 It must be taken into consideration that along with the population of 3 million within the country, many more Armenians are living abroad – in California, New York, Singapore and Bombay, Buenos Aires and Middle East. 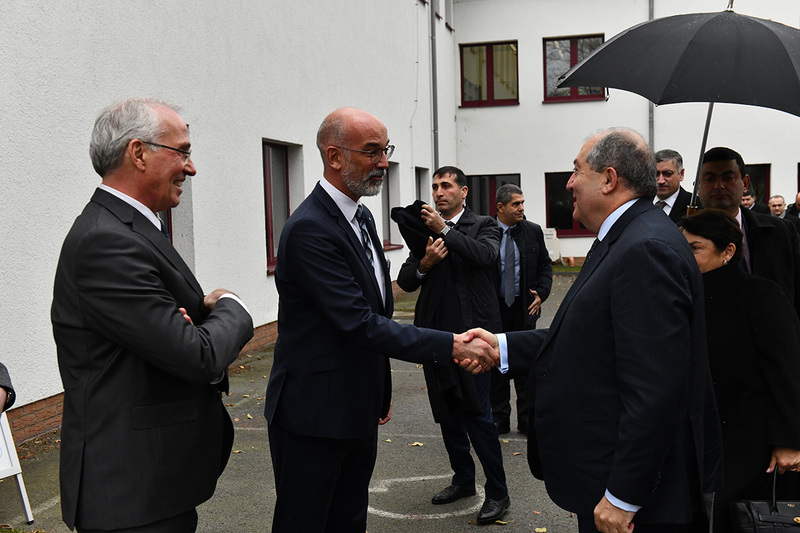 Armenian communities are well-organized, advanced and successful. 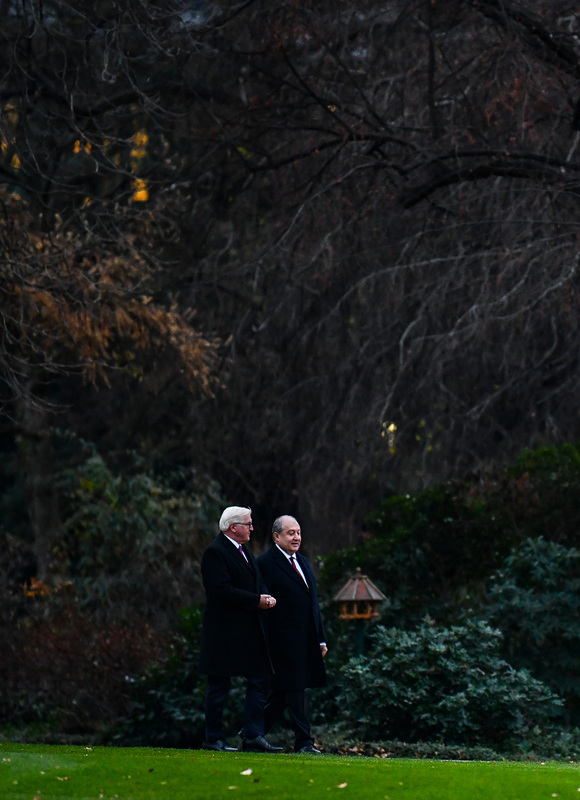 Because of them, we can state that the reputation of the Armenian businessmen stands very high, these are diligent people. In 21st century, all this commands great appreciation. 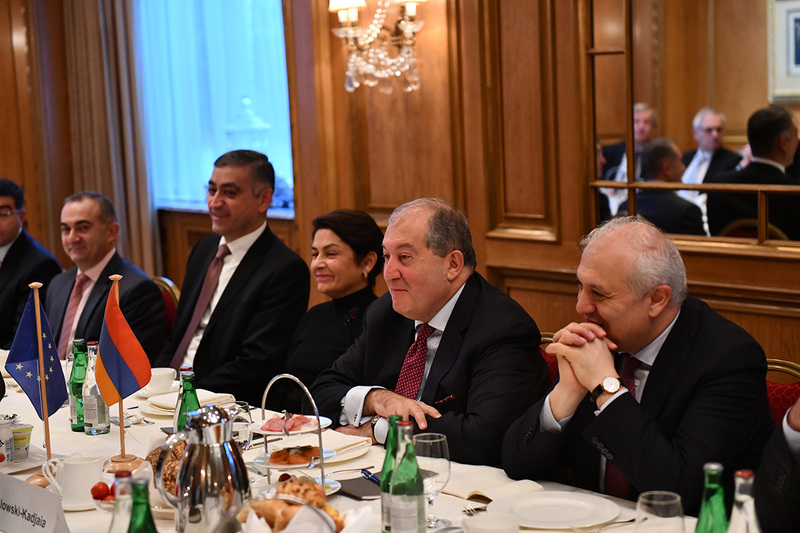 Besides, Armenians living abroad are greatly involved in the processes which are taking place in Armenia and this is very important. 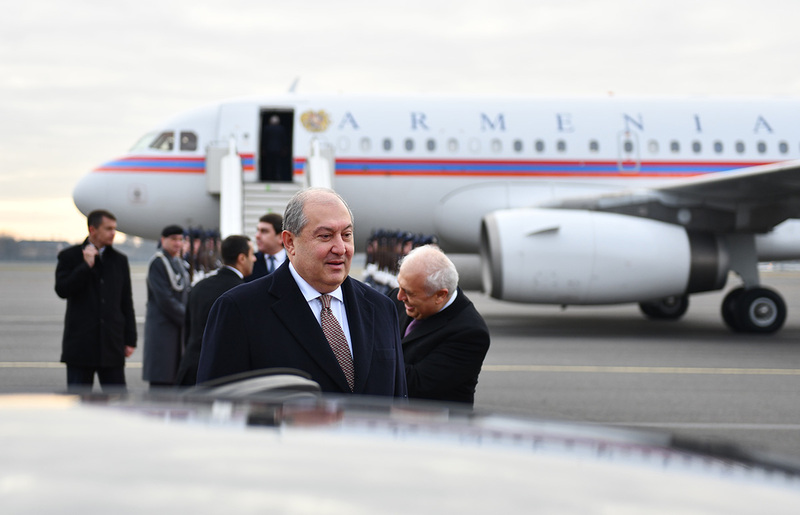 Armenia is a small country but a global nation which is significant in the 21st century. 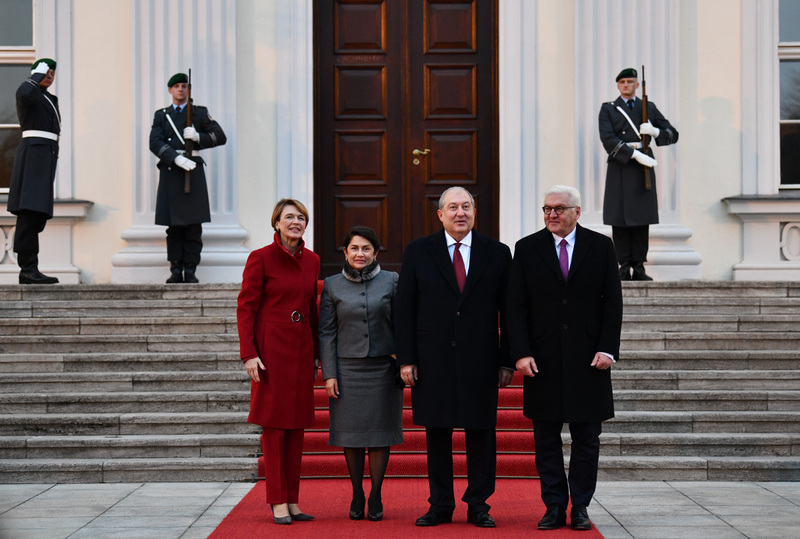 Besides, Armenia may become an important link between the North and the South because maintains good-neighborly relations with Georgia and Russia, countries of the South, including those of the Persian Gulf. So, it’s a real crossroad and has been one for centuries. 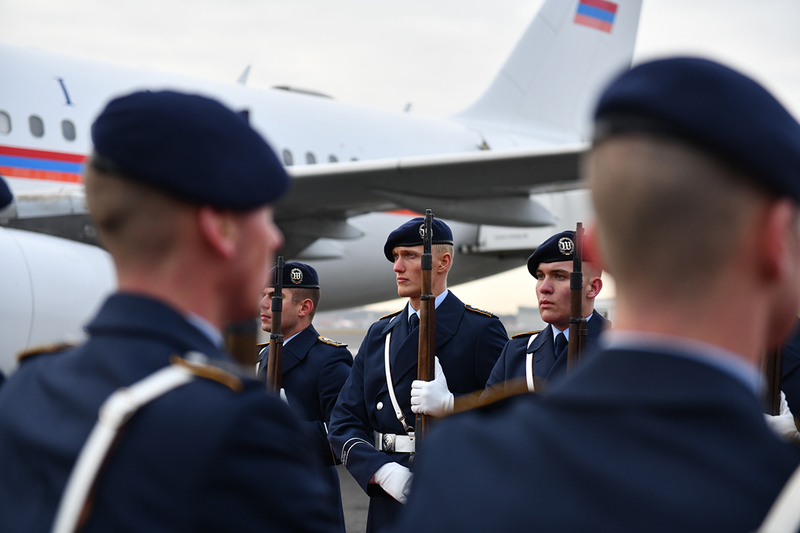 It means that Armenia is in the right place at the right time. Now about the model. If we look back 20-30 or 50 years, at that time we would had to speak of a model which was considered a closed model. 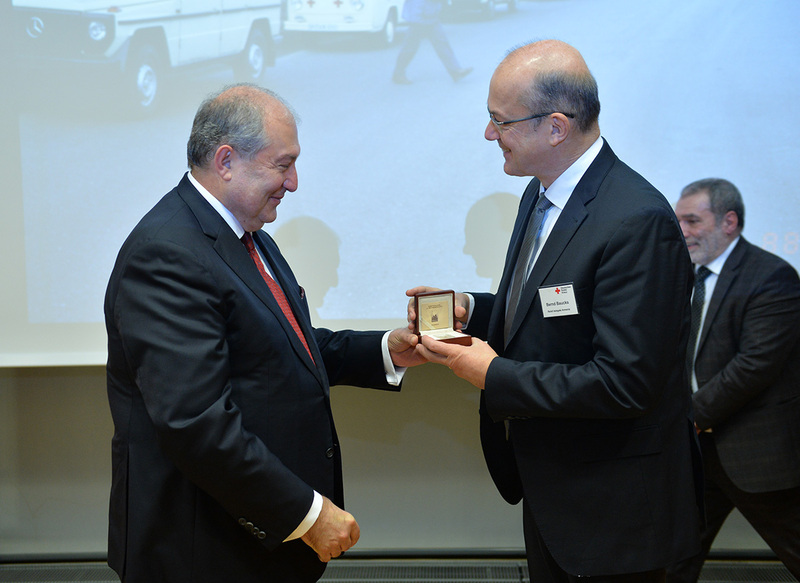 Now, the small Armenia has a great Spyurk, around 12-15 million Armenians live all over the world. 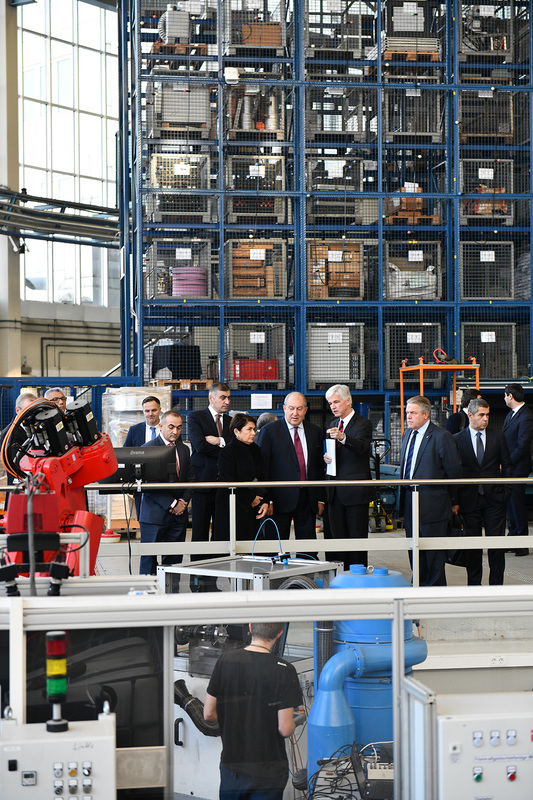 The President spoke of other advantages of our country, noted its young spirit and advancement in the area of technologies. 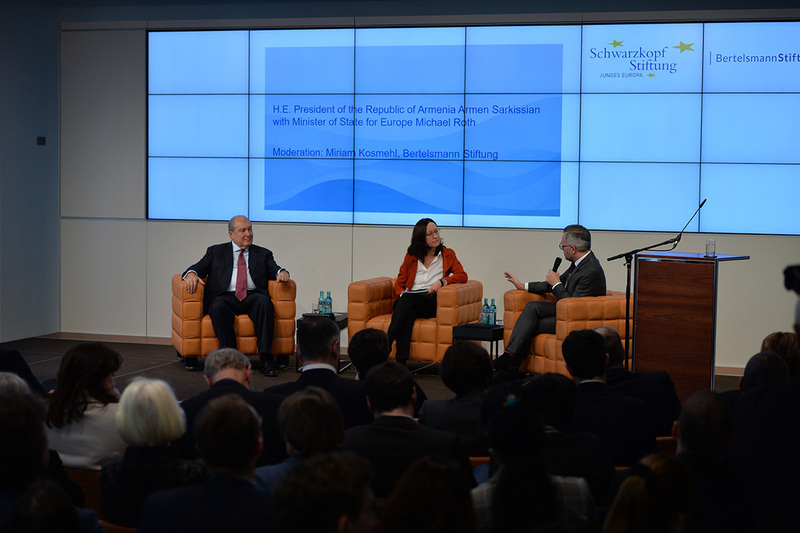 “This is a young Armenia, a country which has a spirit, which looks into the future and is confident that it will be better than ever. 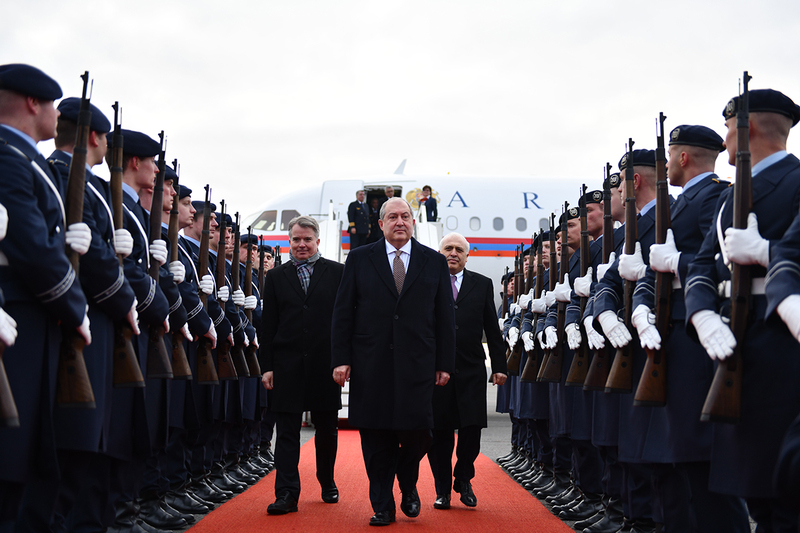 Anyone, who comes to Armenia, will feel the same, it’s a young generation, a young country. 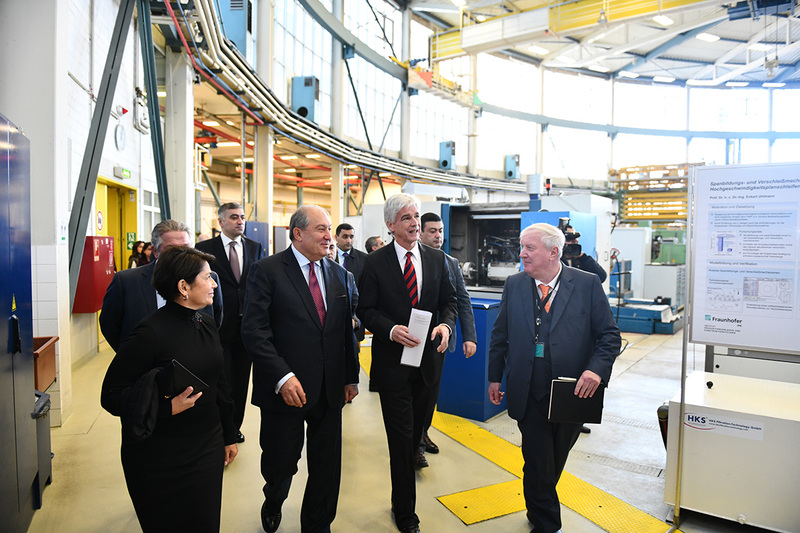 Armenia is keen on new technologies, education, science, especially mathematics and physics. 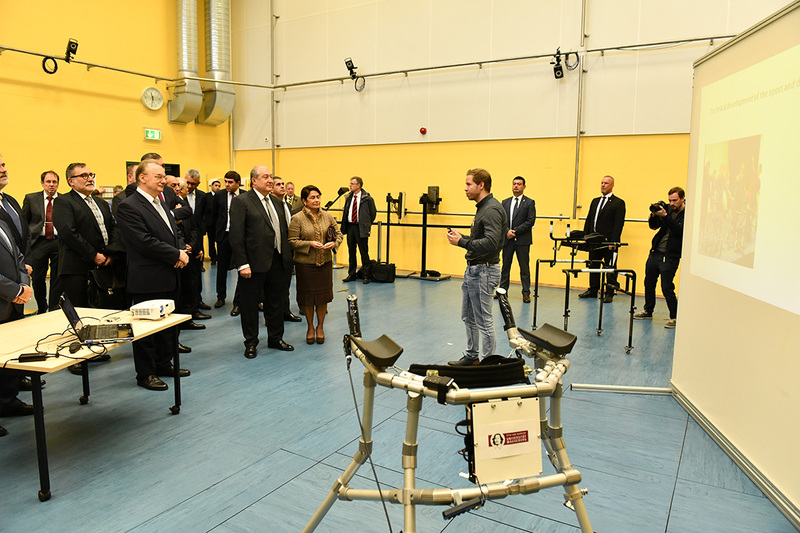 Today, the country has the most advanced sector of information technologies in the region. 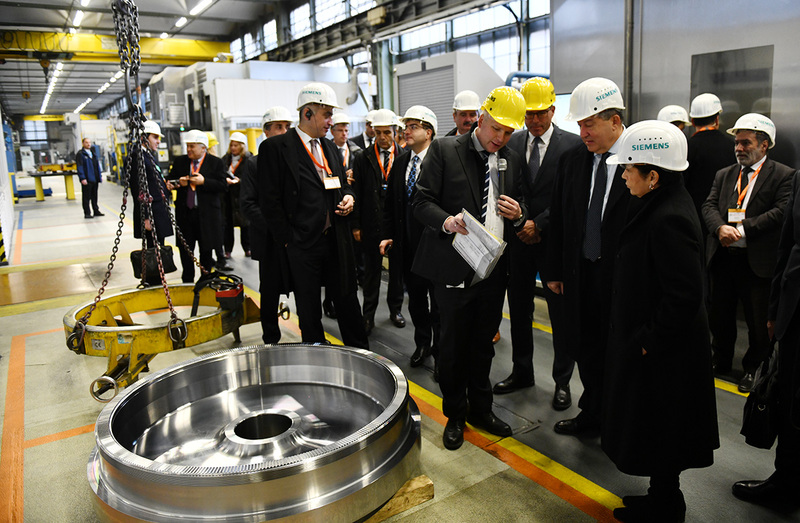 Technologies of the 21st century will be based on innovation, research and development. 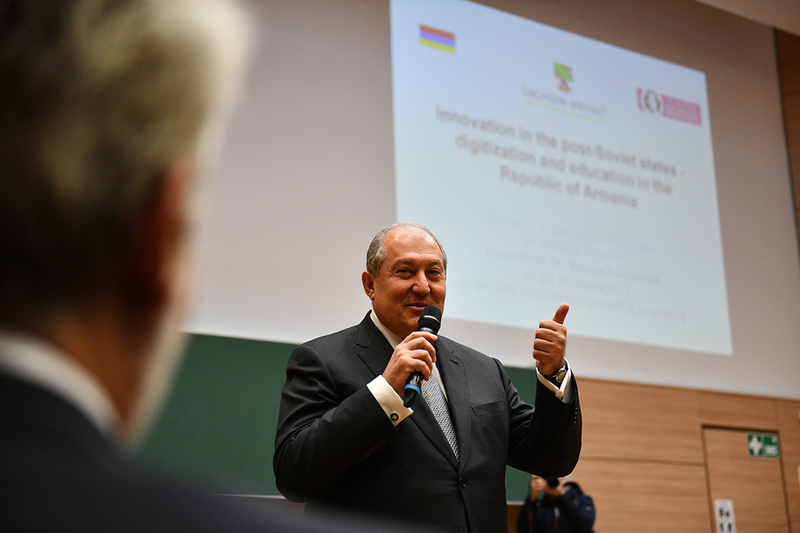 This is Armenia’s time because innovations, research and development are also the future of the economy. 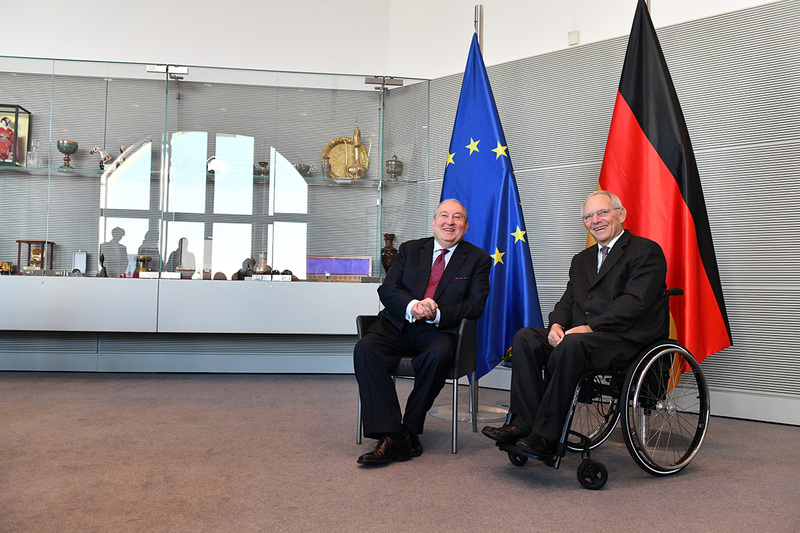 President Armen Sarkissian visited the Bundestag and met with the President of the Bundestag Dr. Wolfgang Schäuble. 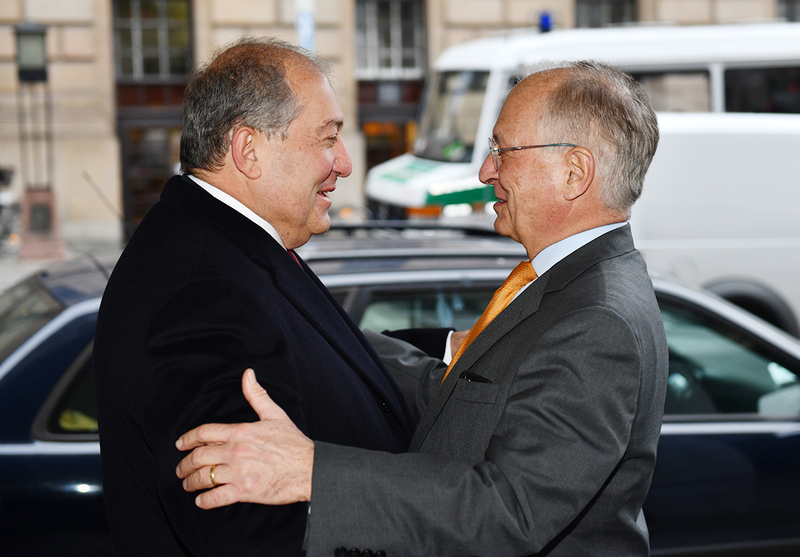 Dr. Wolfgang Schäuble welcomed the first official visit of President Armen Sarkissian to the Federal Republic of Germany. 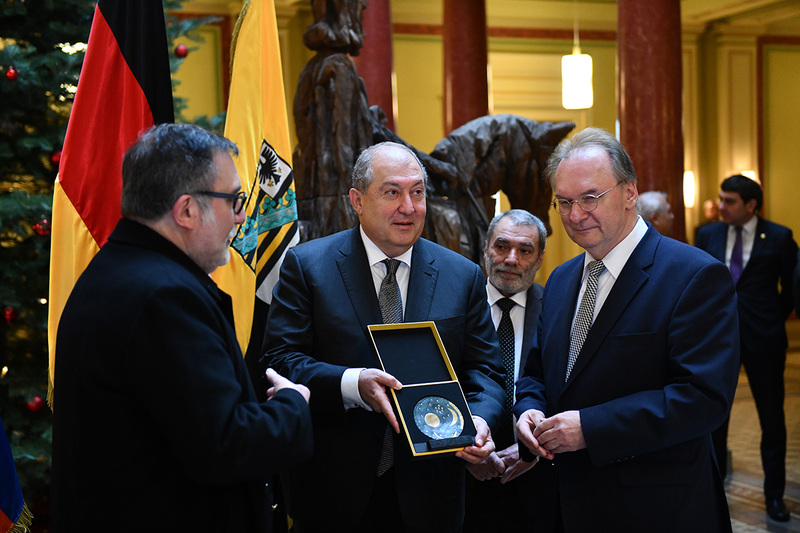 “It is a great honor for me to represent in this historic building my country,” President Armen Sarkissian said and noted that Armenia attaches great importance to the multifaceted cooperation with Germany and consistent development of the interparliamentary relations. 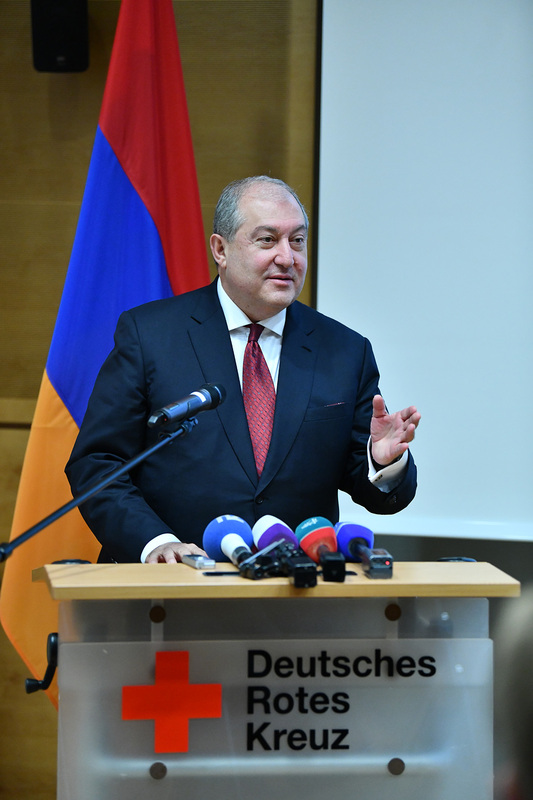 According to the President of Armenia, for a country with a very brief history of a parliamentary system of governance, the German traditions and culture of parliamentary democracy are very interesting. 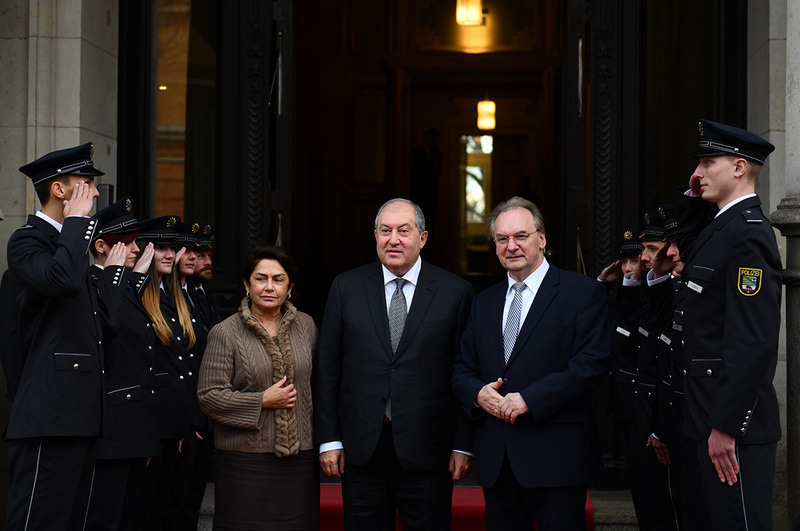 Noting that Armenia today is viewed in the world as a country which has been able to make great changes peacefully, President Sarkissian noted that the New Armenia’s task today is to translate the existing positive energy into positive results. He said that he was optimistic about the future. 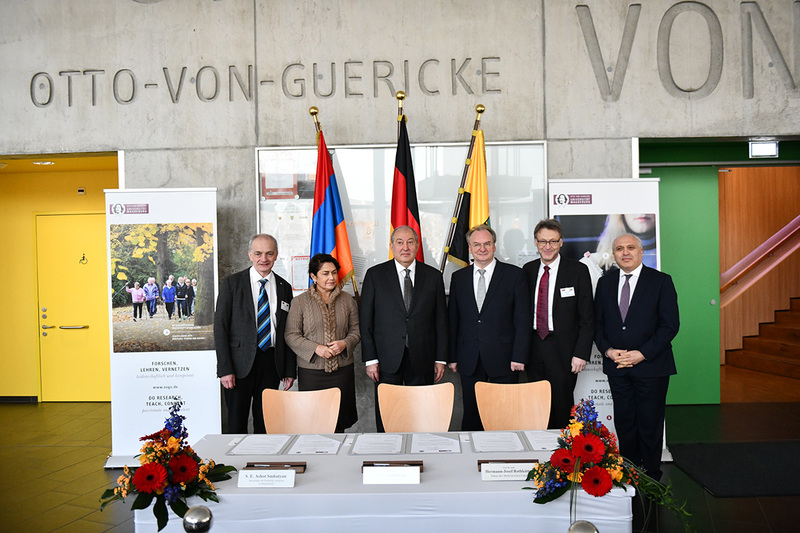 The President of Armenia and the President of the Bundestag spoke also about the process of ratification of CEPA signed by Armenia and the European Union, liberalization of visa regime, as well as about the necessity to expand cooperation in the areas of education, science, and culture. 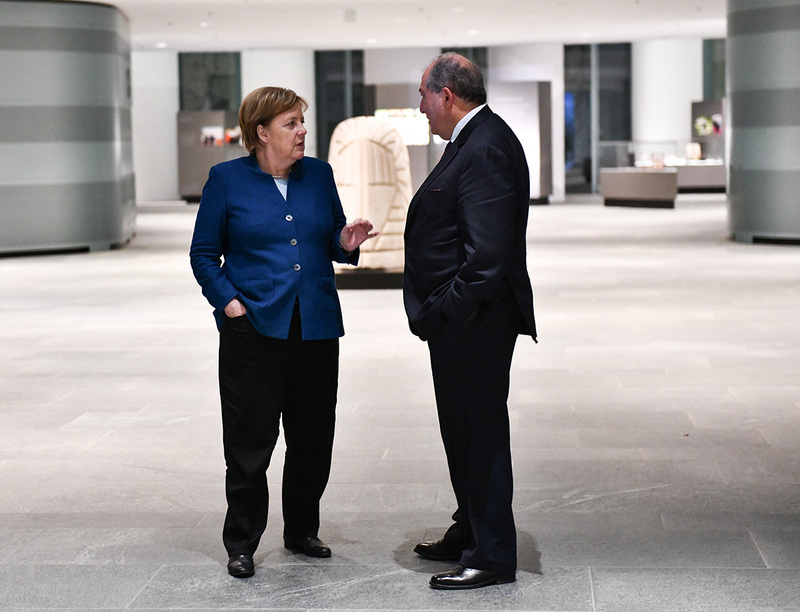 At the office of the Chancellor of the Federal Republic of Germany, President Armen Sarkissian had a meeting with Chancellor Angela Merkel. 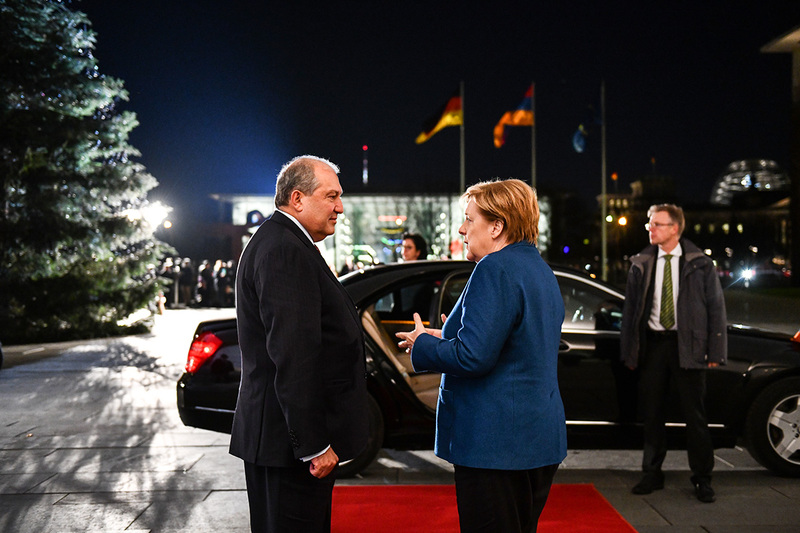 Welcoming the official visit of the President of Armenia to Germany, Chancellor Angela Merkel said that she had very good memories of her last visit to Armenia. 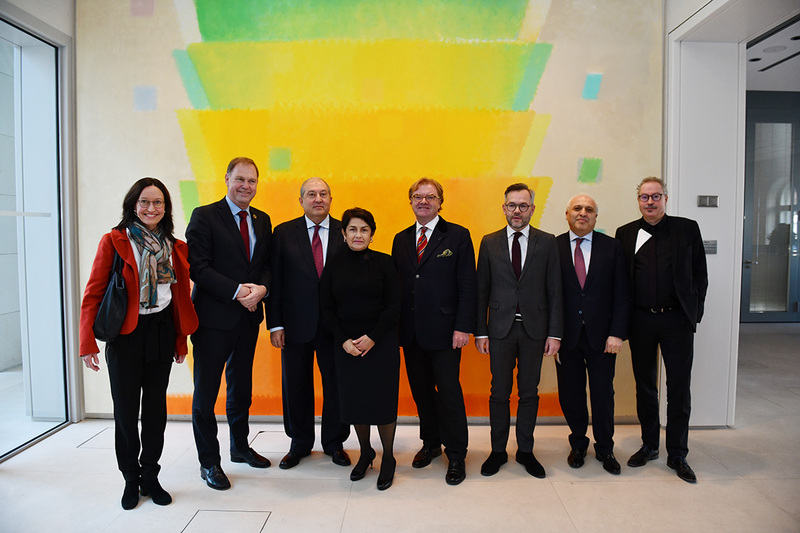 She noted that was especially impressed with the TUMO Center for Creative Technologies, and noted at this moment the German side is looking into the opportunities for cooperation. 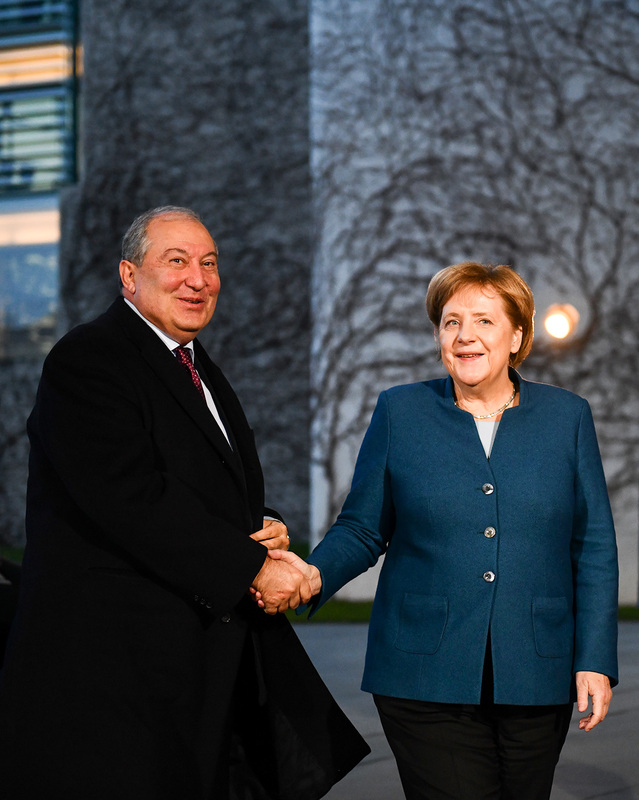 “Armenia is viewing Germany as an important political and economic partner and a friendly state,”President Sarkissian said and noted that would be glad to meet again and continue discussions on the expansion of the Armenian-German relations. 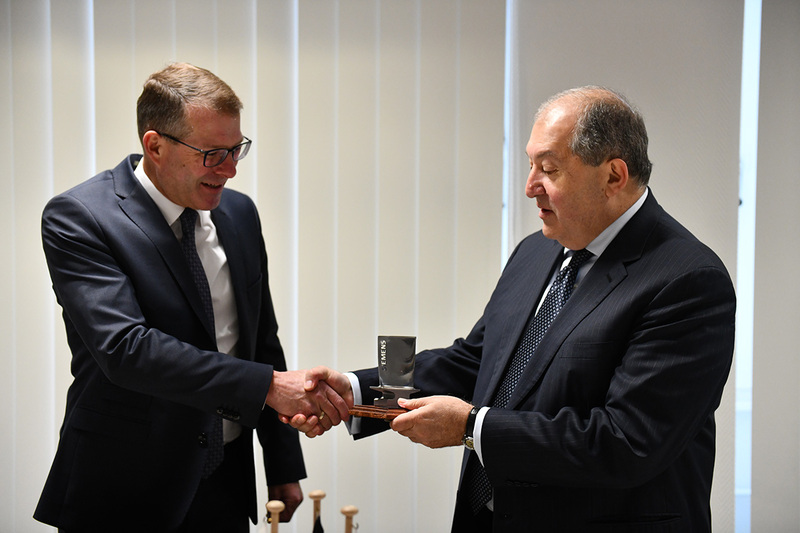 In his words, the two countries can successfully cooperate in the area of high and information technologies in which Armenia holds a great potential. 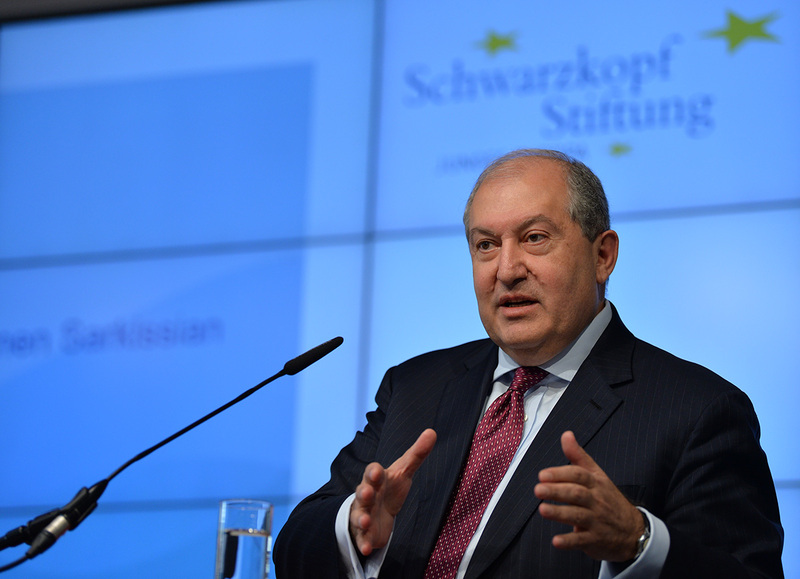 “Our country may become a platform for different startups,” President Sarkissian underlined. 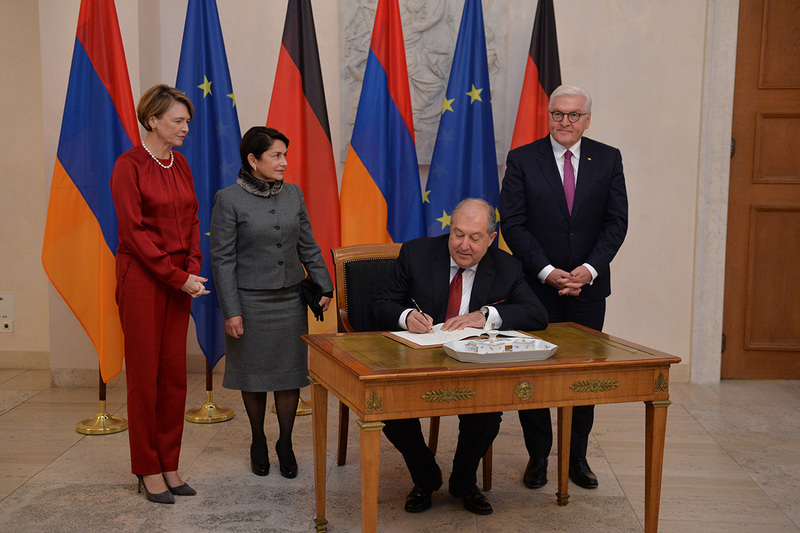 From the viewpoint of strengthening the ties between the two friendly nations, the President of Armenia and Chancellor of Germany stressed also the importance of expansion of the already existing efficient cooperation in the areas of science, education, and culture. 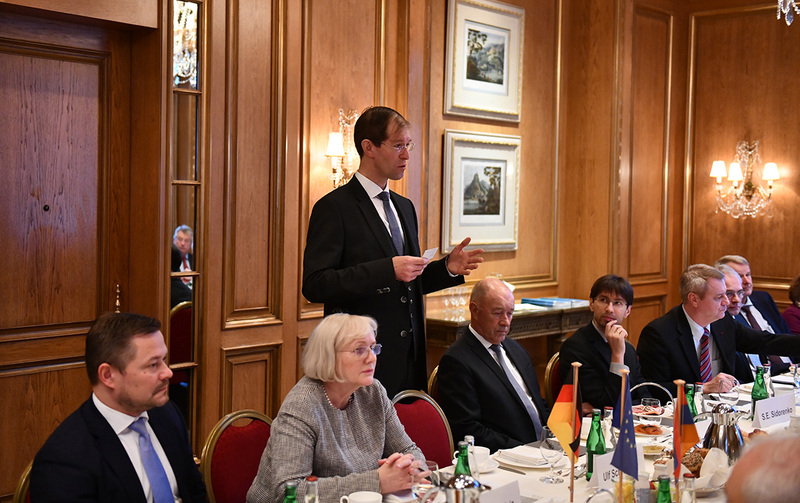 They also spoke about cooperation in the area of tourism and exchanged views on visa liberalization. 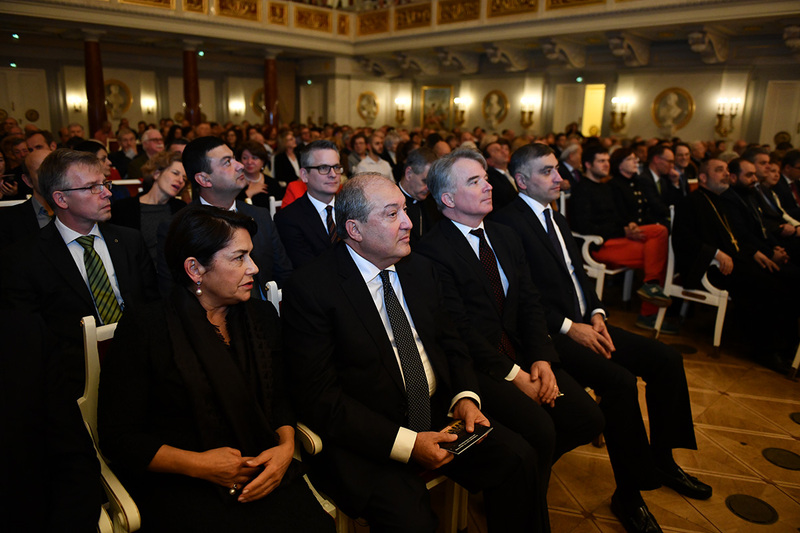 President Armen Sarkissian, who is in Germany on official visit, and Mrs. Nouneh Sarkissian in the evening of November 28 were present at the concert of the National Philharmonic Orchestra of Armenia in the Konzerthaus Berlin dedicated to the 115th birth anniversary of the great Armenian composer Aram Khatchatrian. 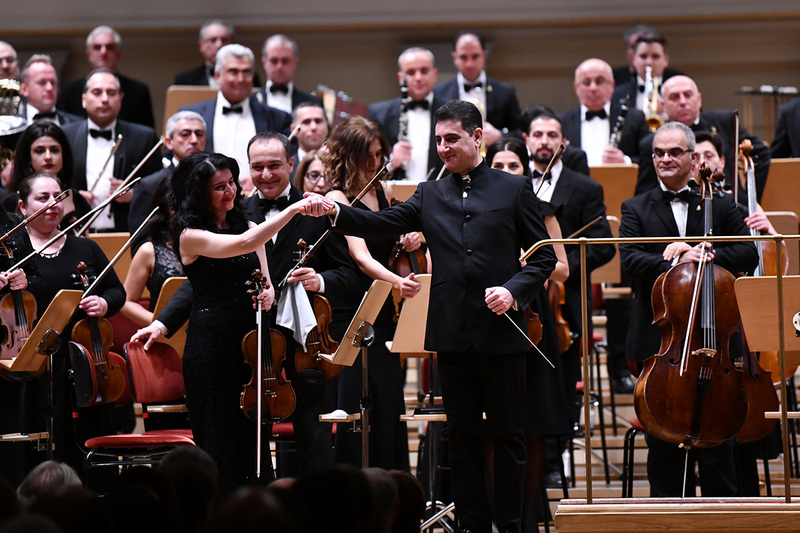 The world-famous violist Sergei Khatchatrian participated in the concert. 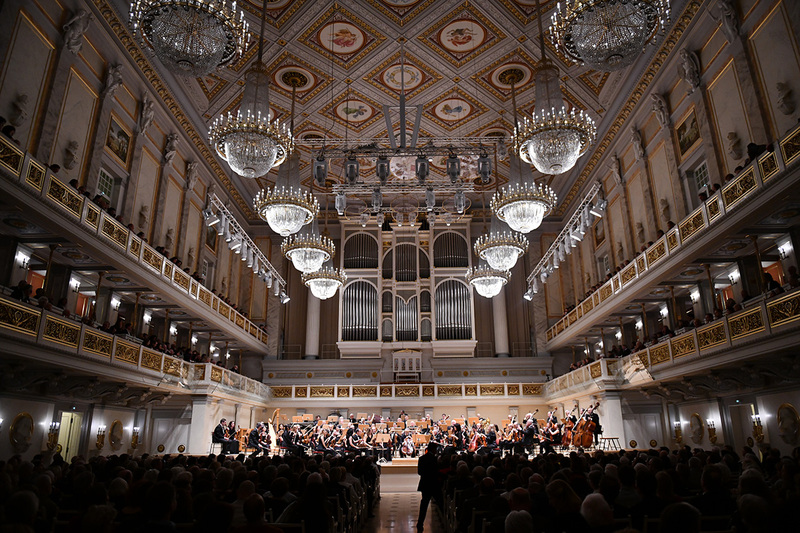 The Orchestra performed under the direction of its Artistic Director and Chief Conductor Eduard Topchian. 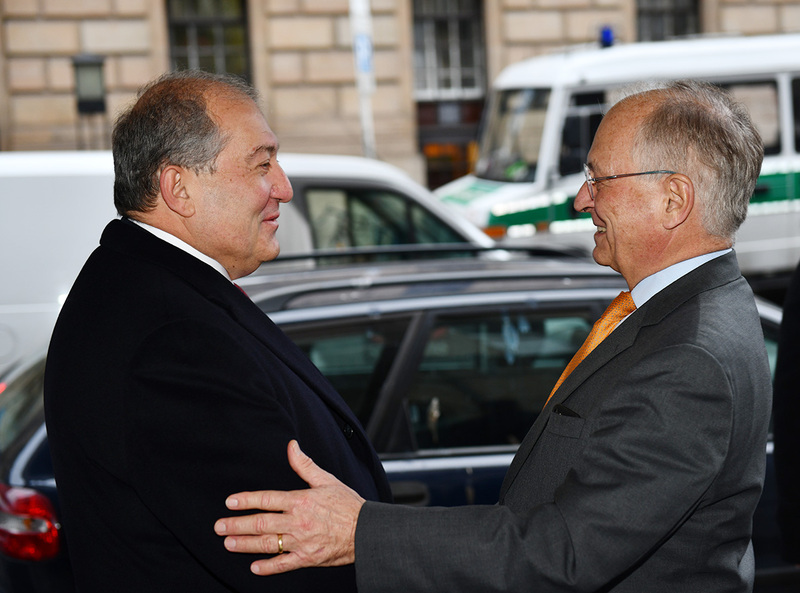 In the framework of his official visit to Germany, President Armen Sarkissian and Mrs. Nouneh Sarkissian left for Magdeburg, the capital city of Saxony-Anhalt region of Germany, where he met with the President Minister of the region Reiner Haseloff. 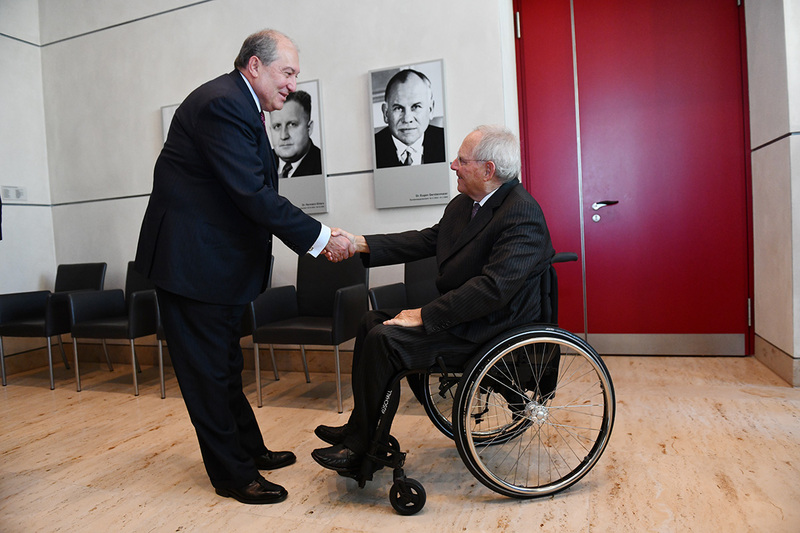 Reiner Haseloff welcomed the President of Armenia at the entrance to his office. 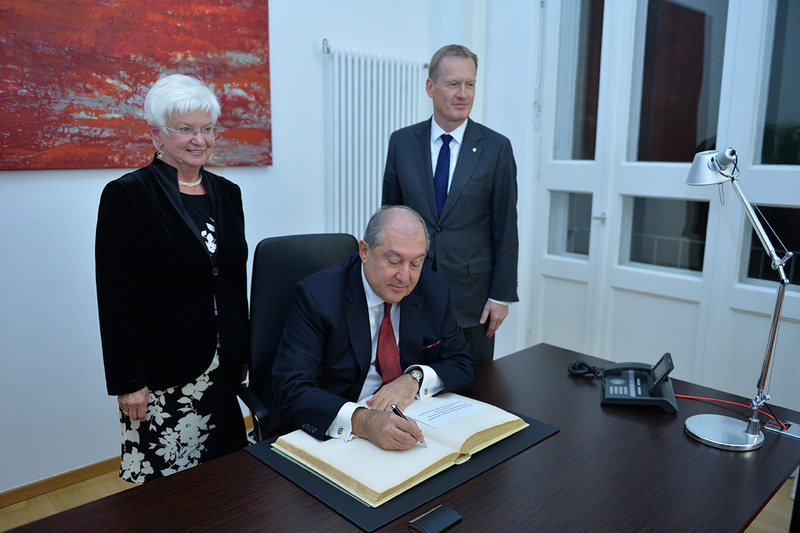 President Sarkissian made an inscription in the Book of Honorary Guests. 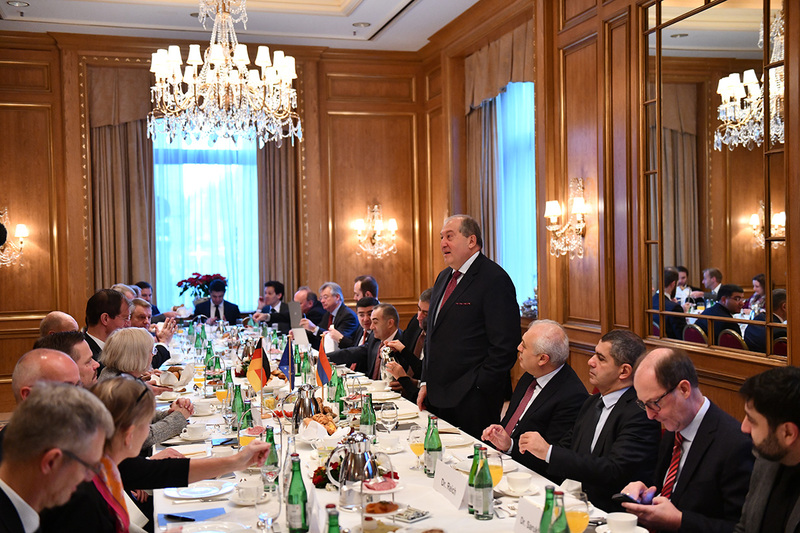 Later, President Armen Sarkissian and President Minister of Saxony-Anhalt held a meeting with the participation of the delegations. 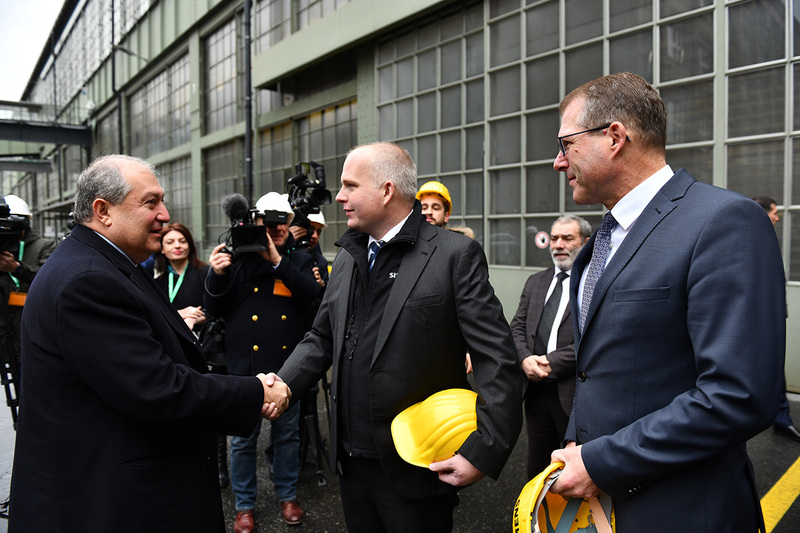 Reiner Haseloff welcomed the visit of the President of Armenia to the region and noted that he was aware that Armen Sarkissian had visited Magdeburg before and was glad that was hosting him as the President of Armenia. 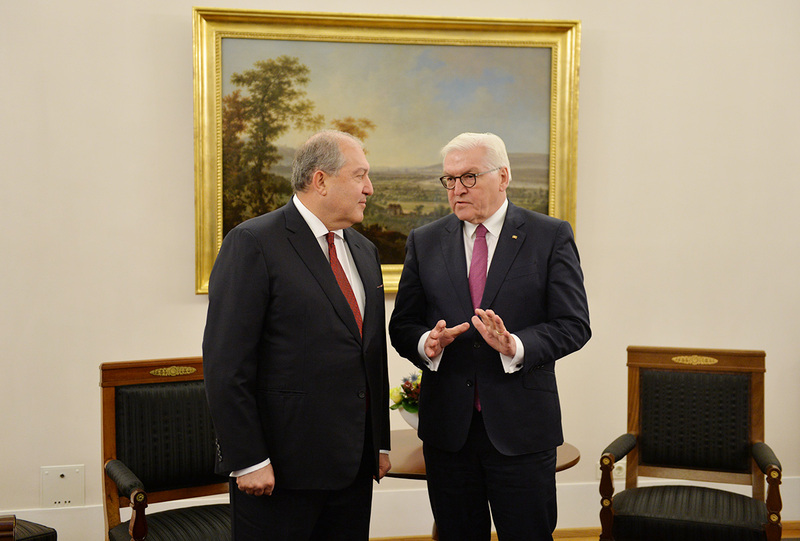 “Our region maintains close relations with Armenia. 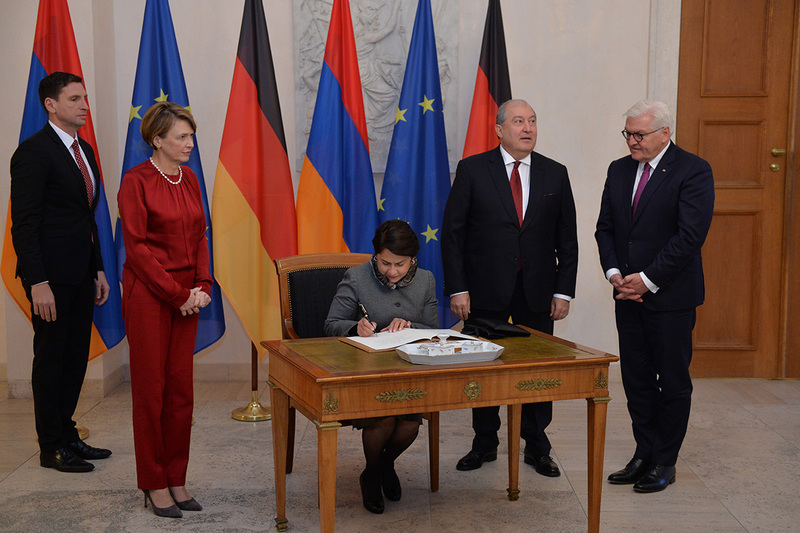 Armenia and Saxony-Anhalt have already signed agreements on cooperation. 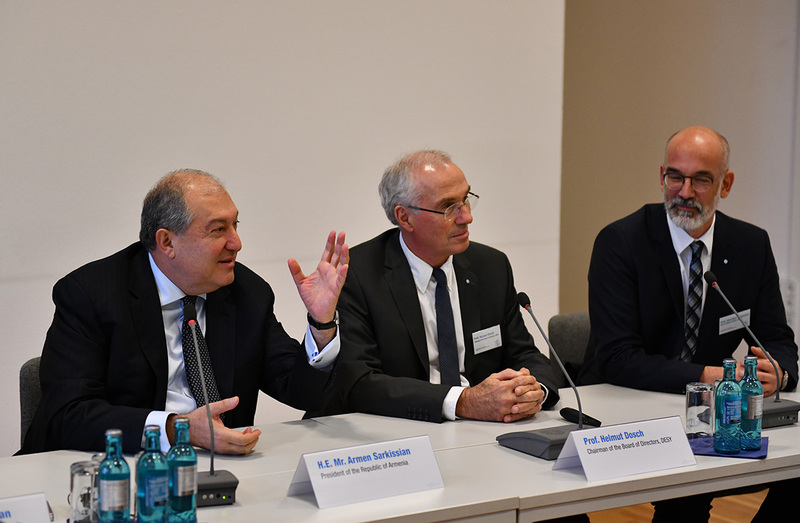 At the Martin Luther University in Halle, there is the Mesrop center for Armenian Studies which plays an important role in these relations. 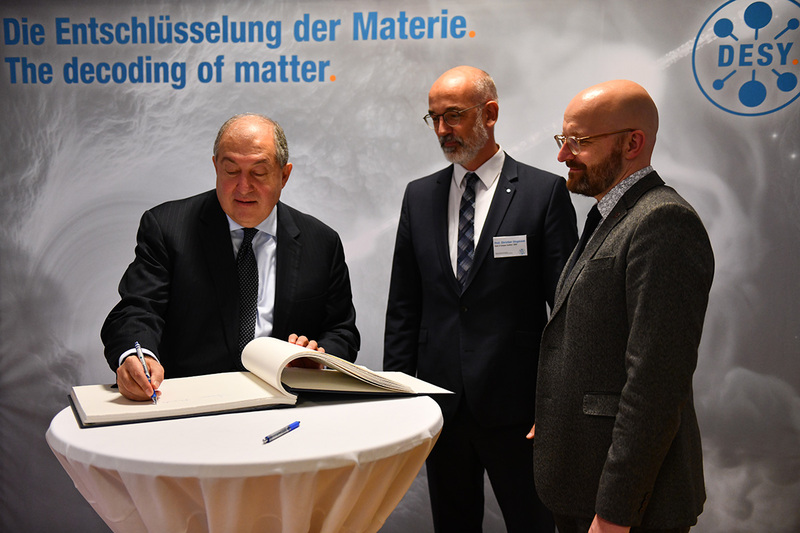 The agreement to be signed today will also promote cooperation in the area of education and science,” Reiner Haseloff said. 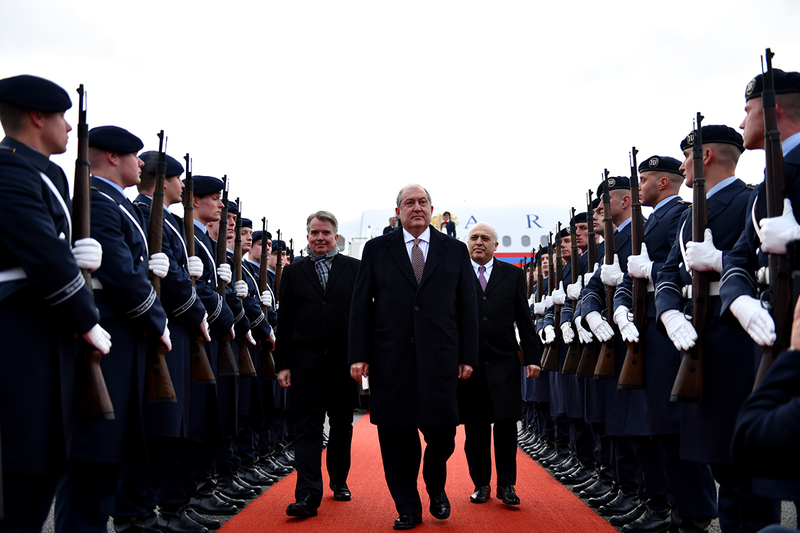 President noted that in 1980s, he had visited Germany as a Soviet scientist, including Magdeburg. 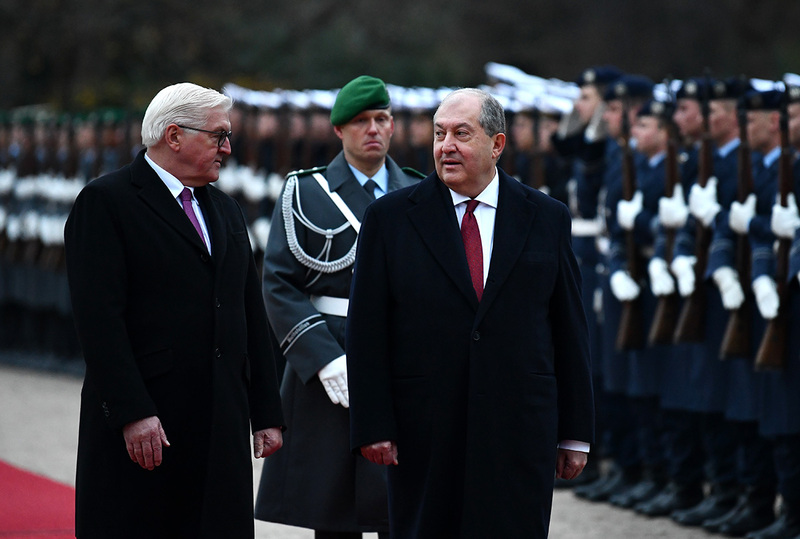 “Armenia and Saxony-Anhalt are good friends. 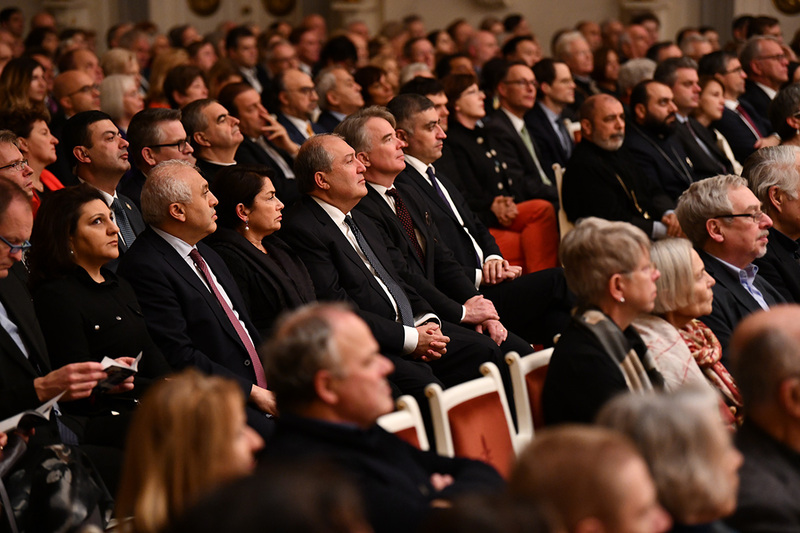 History and culture are the source of our friendship and dialogue, and in the future, I hope, also science. 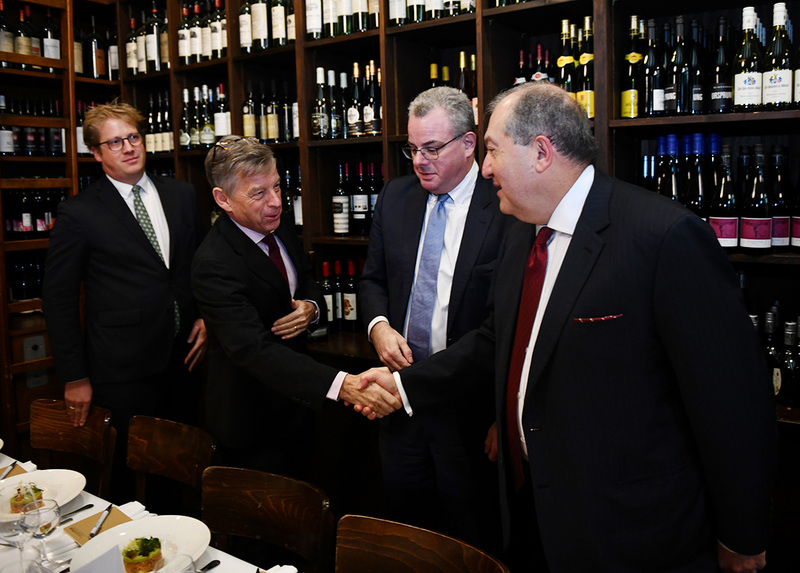 We highly value the existence of Mesrop Center here. 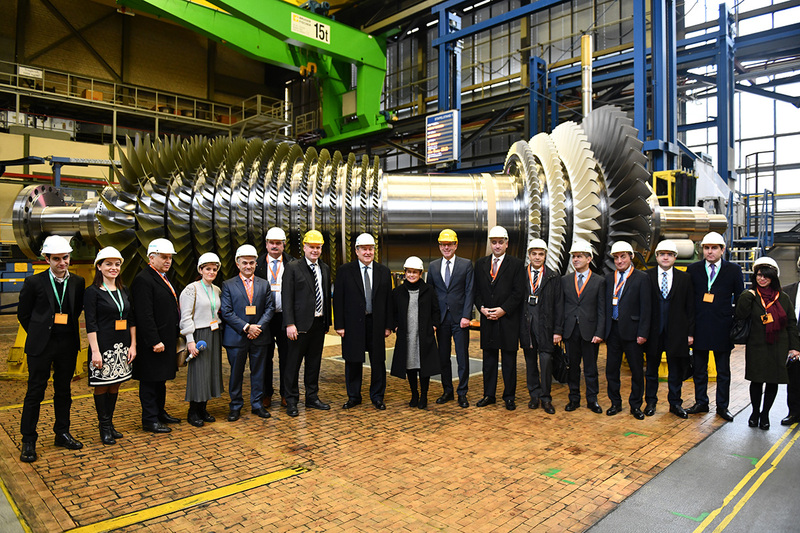 This is our small but very important presence in Germany. 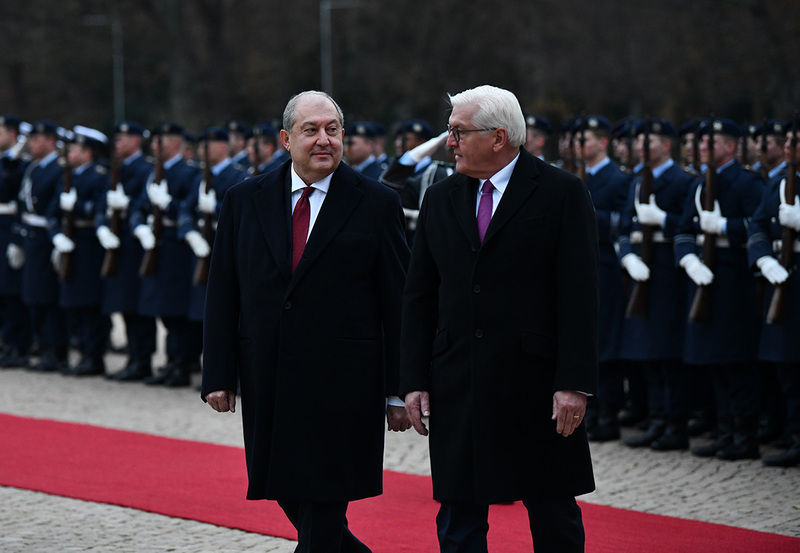 I am confident that together we can do much more to deepen and expand our cooperation because there is a good base for it,” President Armen Sarkissian underscored. 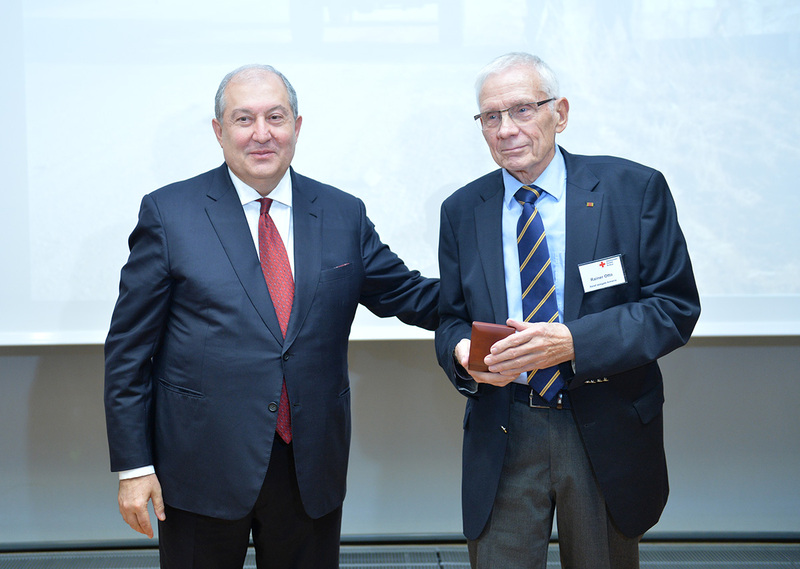 Noting that the two nations stand at the historical origins of astrophysics, he invited Reiner Haseloff, who is a physicist, to visit Armenia and to see one of the first observatories in the world which has a history of over 4,000 years. 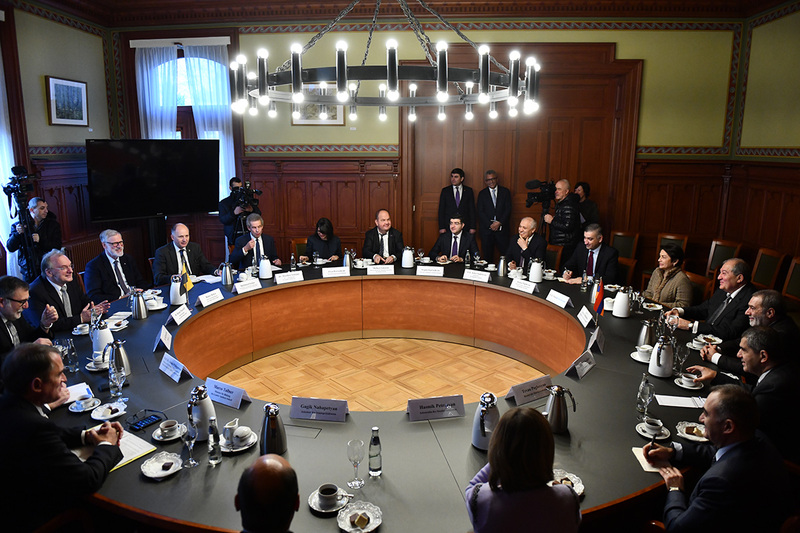 At the meeting, discussed were issues related to the broadening of cooperation in the areas of science, education, and culture. 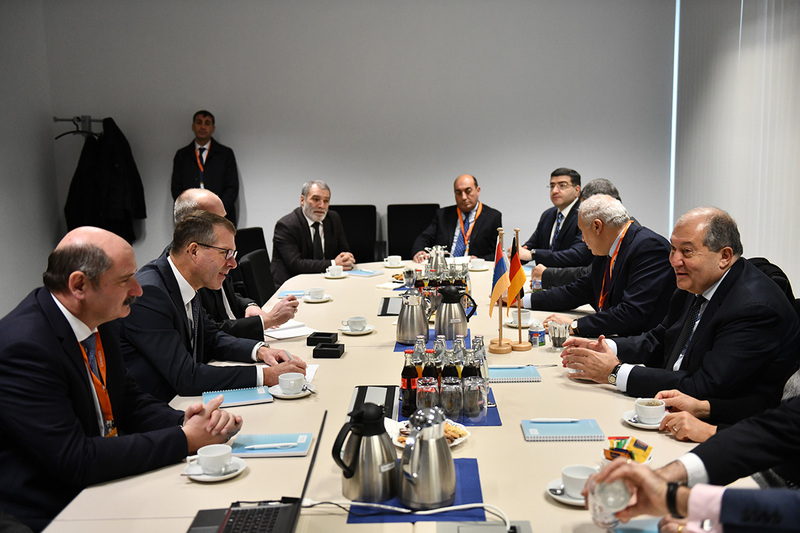 Reiner Haseloff and sectoral ministers of the region presented programs of cooperation with Armenia. 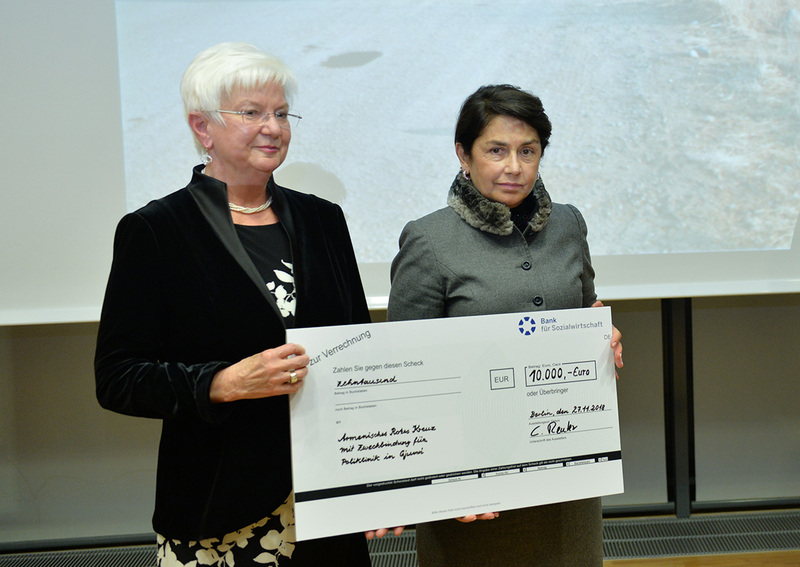 It was stated that currently there are programs of exchange for school children and students. 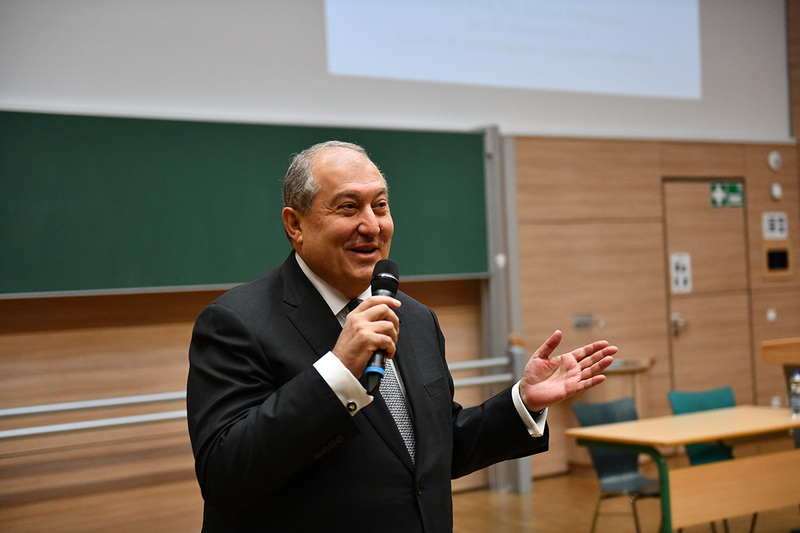 President Sarkissian proposed to expand student exchange programs to include also the areas of IT, mathematics, and physics. 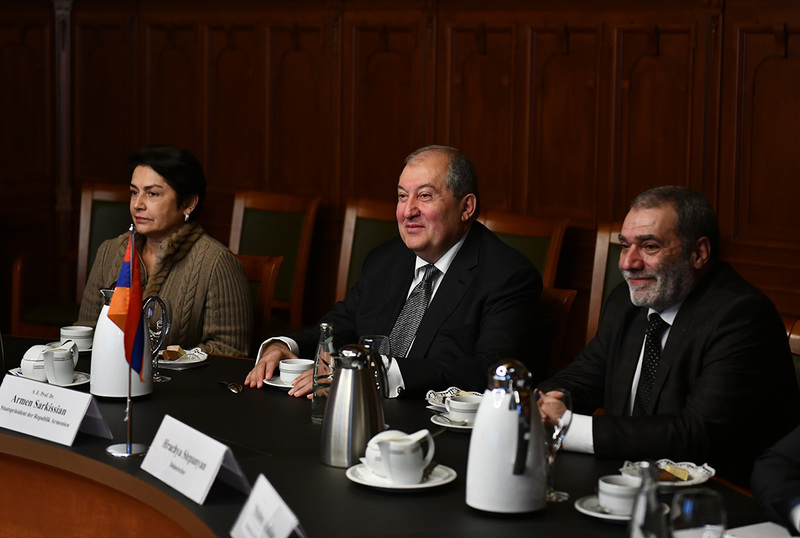 He noted that Armenia is interested in ecological problems. 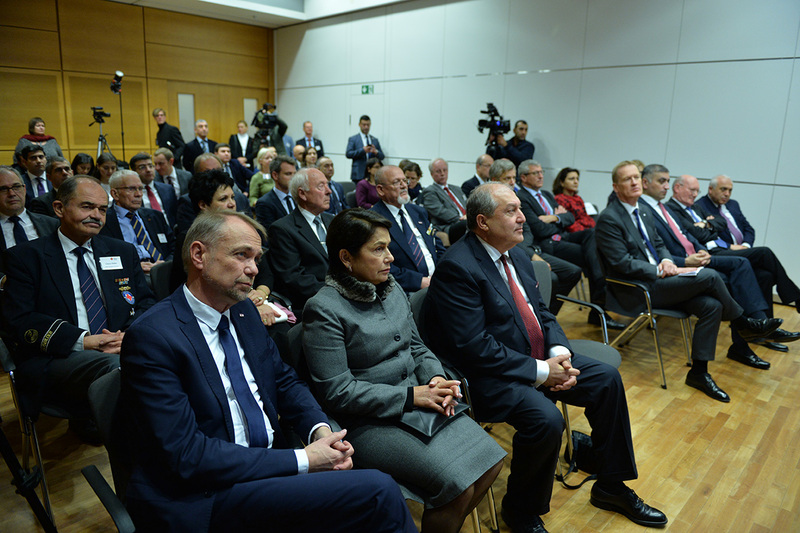 “Germany has excellent experience in Green science area which can be useful for our country. 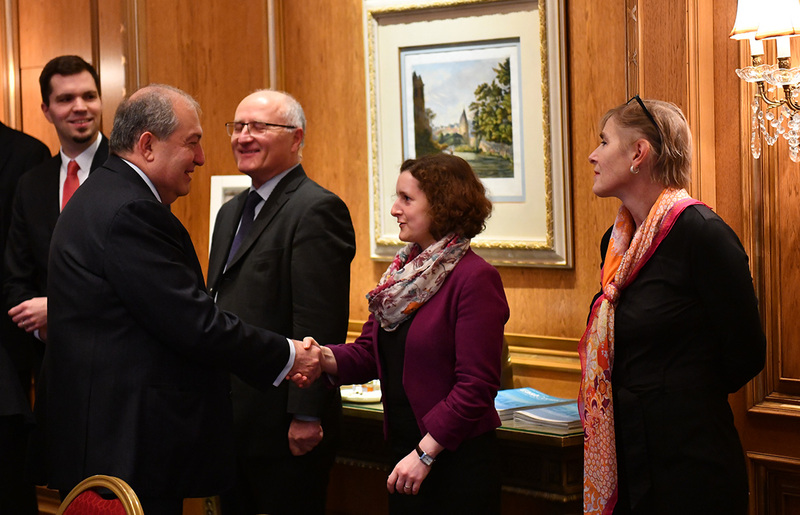 Armenia can also become a good partner in the area of science and research,” President Sarkissian said. 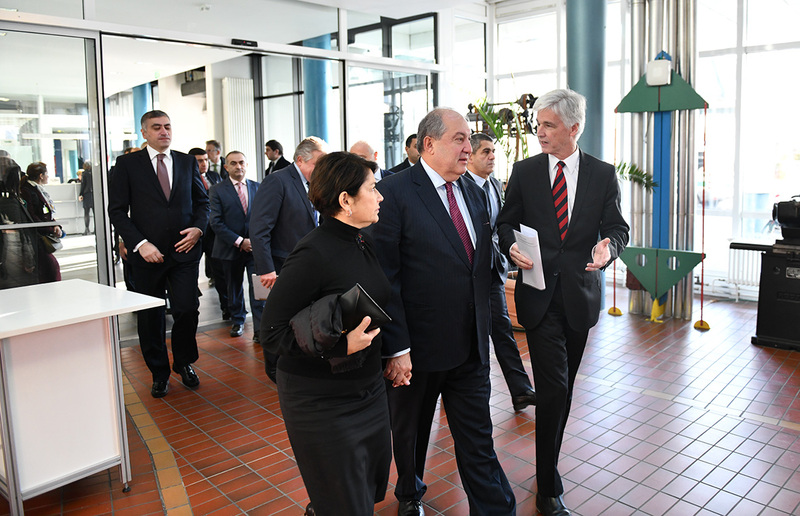 Together with Reiner Haseloff, President Sarkissian visited also the Otto von Guericke University. 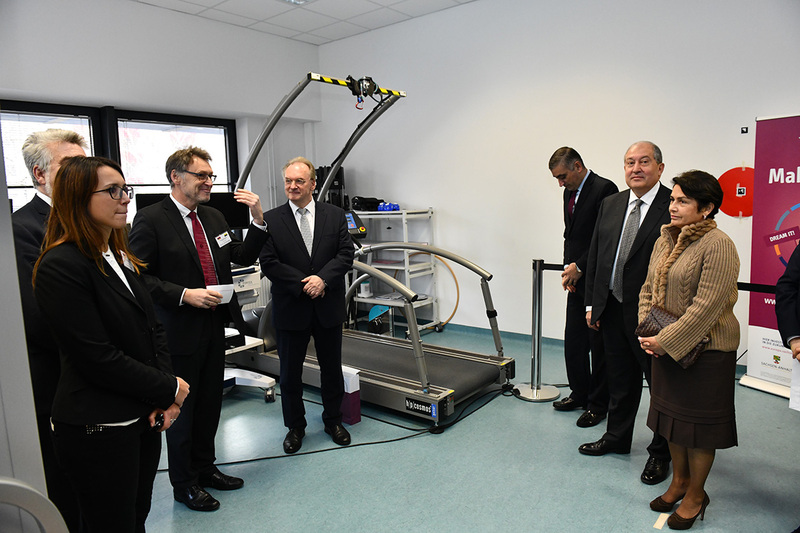 Accompanied by Rector Jens Strackeljan, President Armen Sarkissian toured the sport research unit, familiarized with the lab activities where students and scientists work on the devises for the people with limited physical abilities. 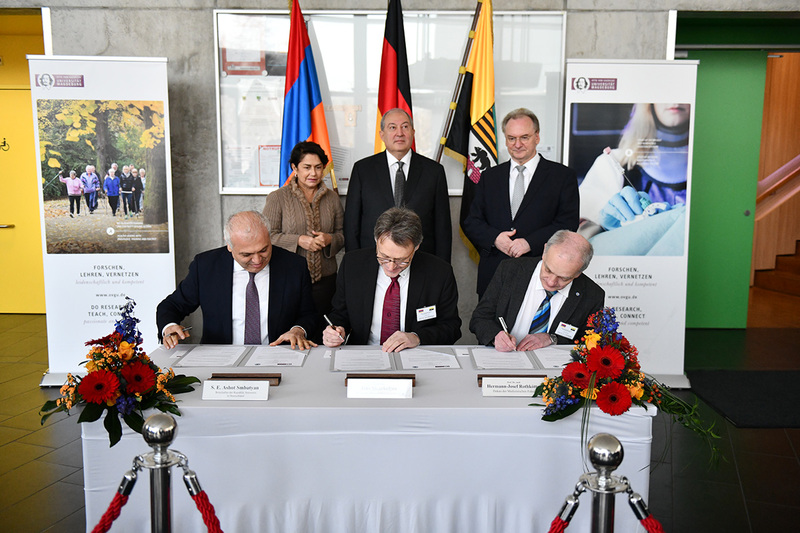 In the framework of the visit, the Yerevan State Medical University and Medical Department of the Otto von Guericke University signed an agreement on cooperation. 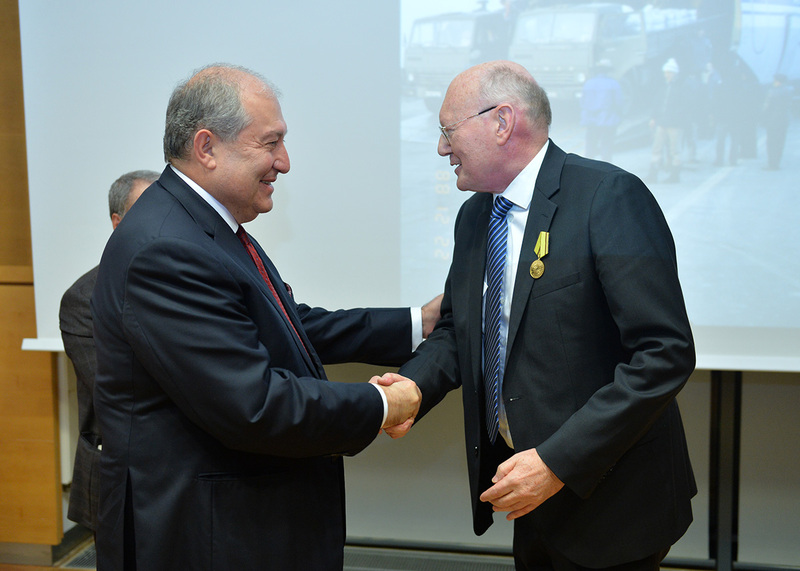 The ceremony was attended by President Armen Sarkissian and Reiner Haseloff. 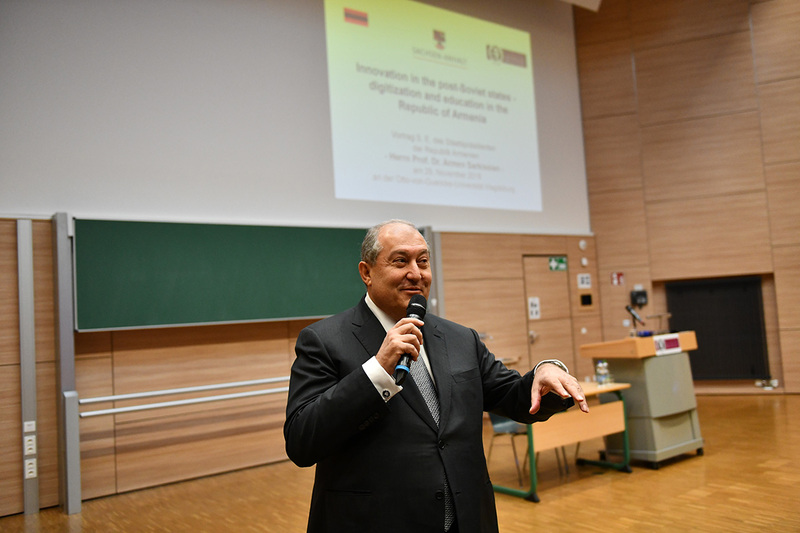 Today, President Armen Sarkissian met with the students and faculty of the Otto von Guericke University of Saxony-Anhalt region in Germany. “We start to age when we stop to learn, when we stop feeling happy about new discoveries, when we stop to explore and discover. What does it mean to be young? I don’t think the number of years is an issue here. I am sure everyone of you have met people who are 16 or 20 but are already old, are disinterested and passive. At the same time, you have seen 60, 70, 90 years old people who are full of life. 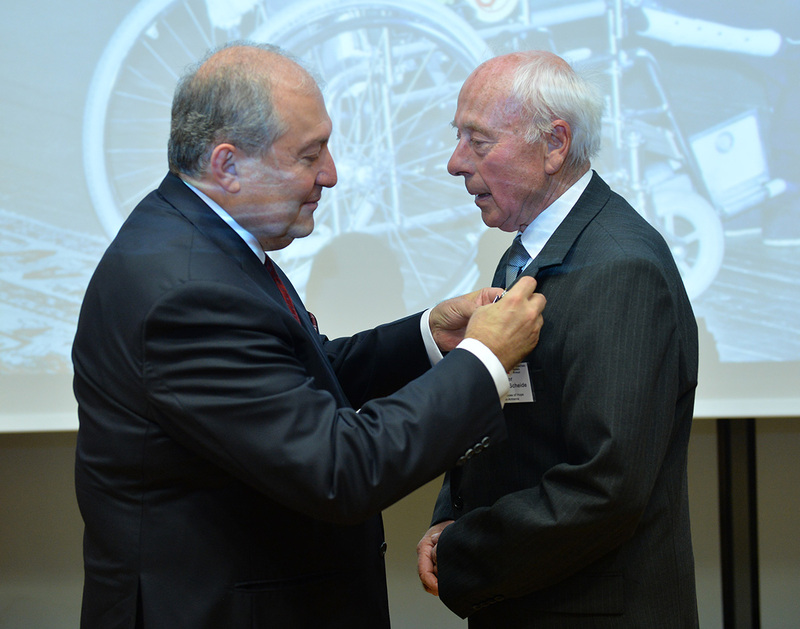 Physical activity is an indicator of being young. The more active life you lead, the younger you are. It is important every day to learn something new. Time is relative and depends on the individual’s speed. It is up to us to be young and live a full life, regardless of our age. The 21st century is the young people’s time. Why is it so important to be young in the 21st century? Because the 21st century will be different. I am finishing my book which I named the Quant Behavior of the Global Risks. It doesn’t mean we will apply the laws of quant physics to explain everything. It means that the events and politics will not develop in the classical way. Events happening in the world today prove it. 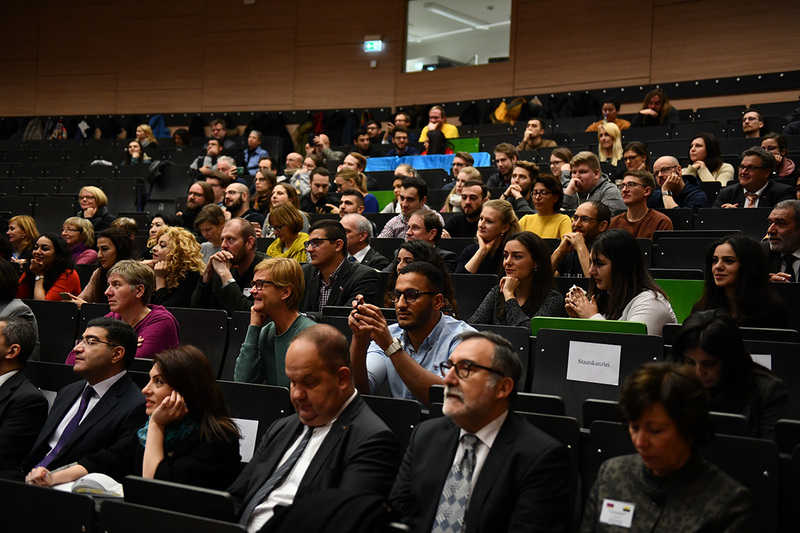 The 21st century is young people’s time, in the 21st century you will be governing in a totally different way than we used to do in the past. I hope you all will stay young. In conclusion, I would like to say that to stay young one has to learn new things every day, need to be happy and get surprised with every day discoveries. 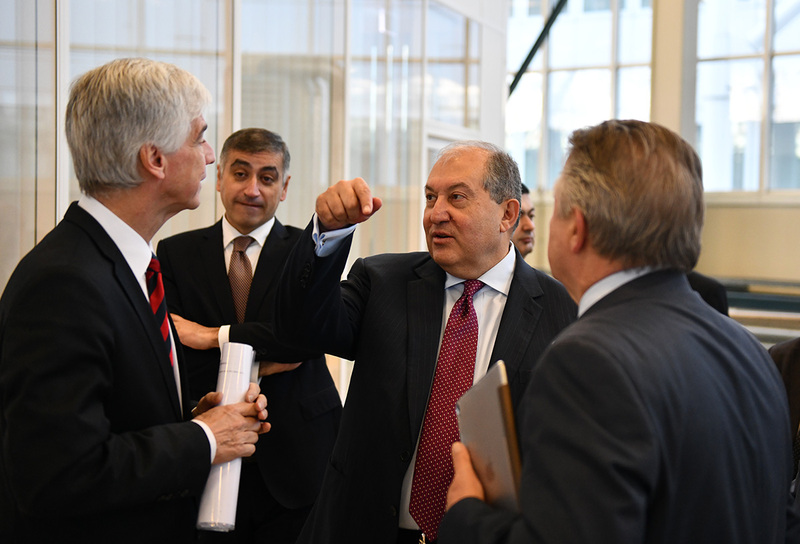 When you come to Armenia, I will be happy to show you that Armenia is a country of the 21st century indeed, moving very fast. The country lacks huge natural resources but possess a huge human potential and good education. 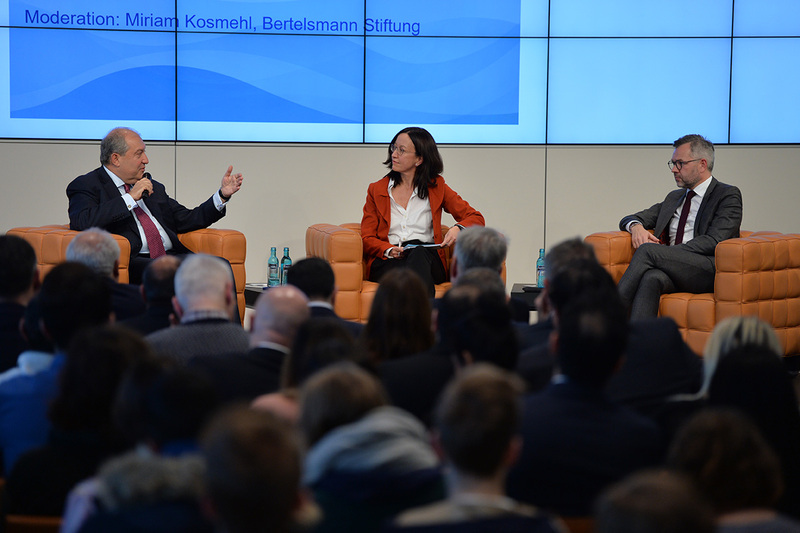 The President responded also to the questions raised by the participants. 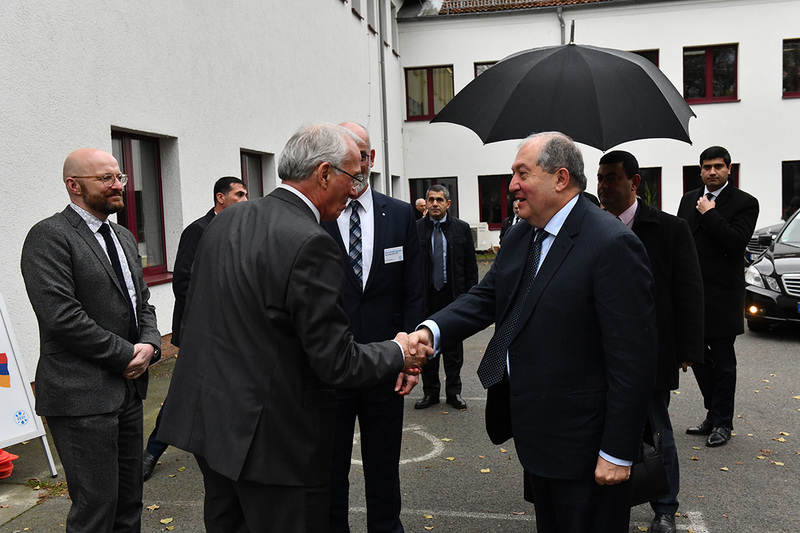 Responding to the question of the Azerbaijani participant related to the Nagorno Karabakh conflict, President Sarkissian said, “From the humanistic point of view, things that have happened in Armenia, Azerbaijan, and Nagorno Karabakh are tragic. I will not dwell on history. 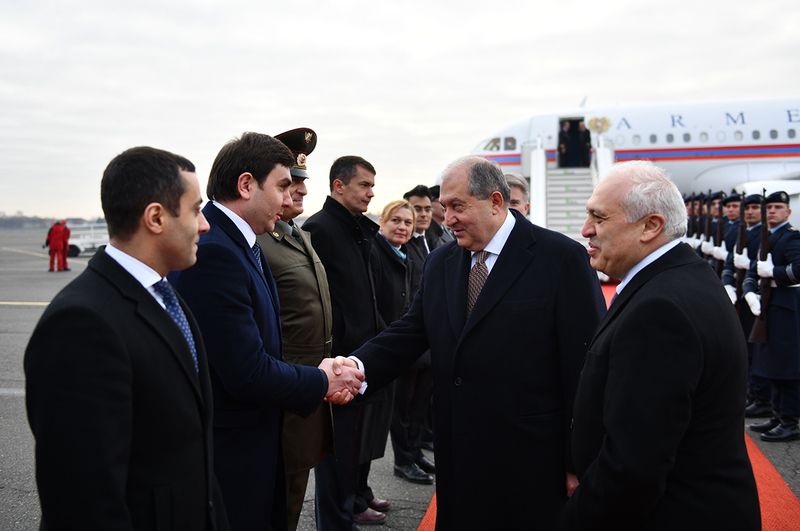 Armenia has a new government and a new Constitution. 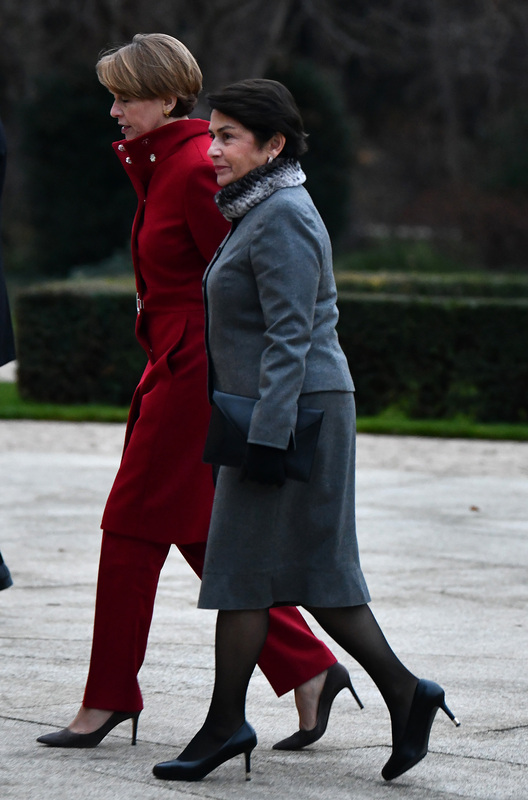 I am the head of state but not the head of government. Currently, Armenia is like Germany. 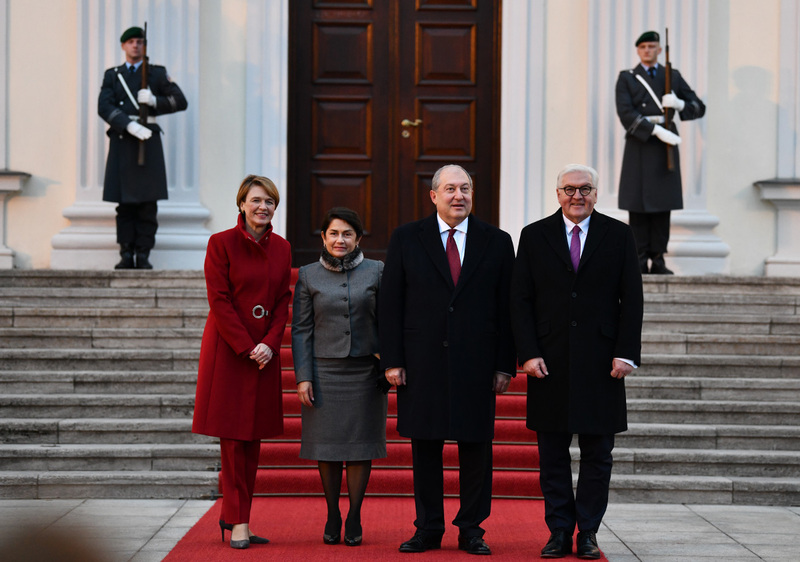 According to the Constitution, it is the head of government who will negotiated with Ilham Aliev. My role can be in providing advice. 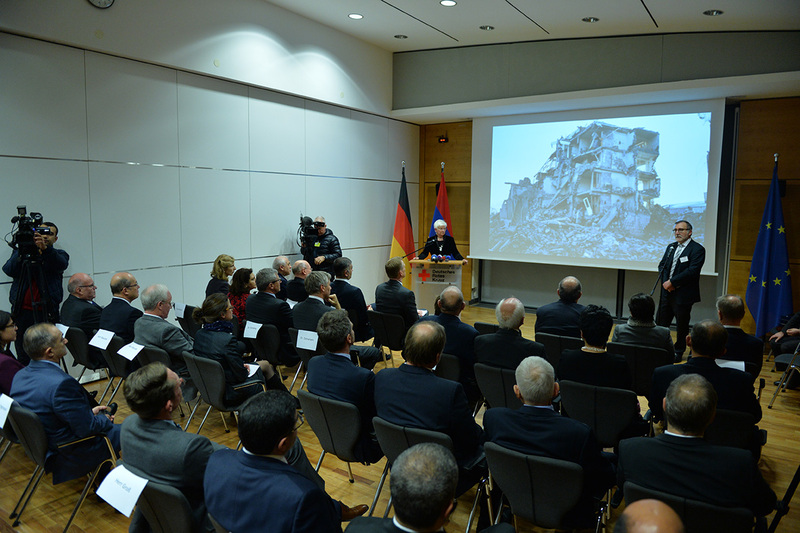 I would like to stress another important thing: People died not only in Azerbaijan but in Nagorno Karabakh and Armenia. I believe, we need to do everything we can to create a fair and peaceful environment to solve the problem. Is it easy to achieve? No. But we need to try to do it today, otherwise your and our children years later will be forced to ask the same question. 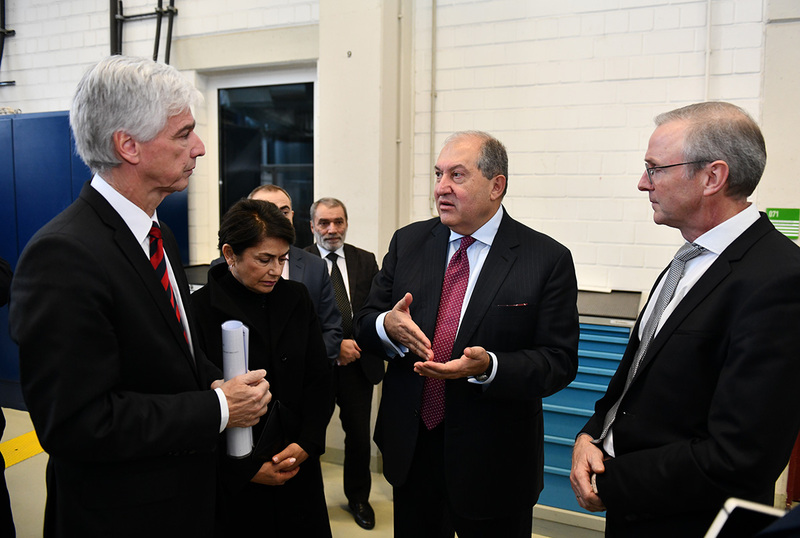 President Armen Sarkissian, who is Germany on official visit, visited in Berlin the production unit of Siemens – one of the largest industrial and technological companies in Europe. 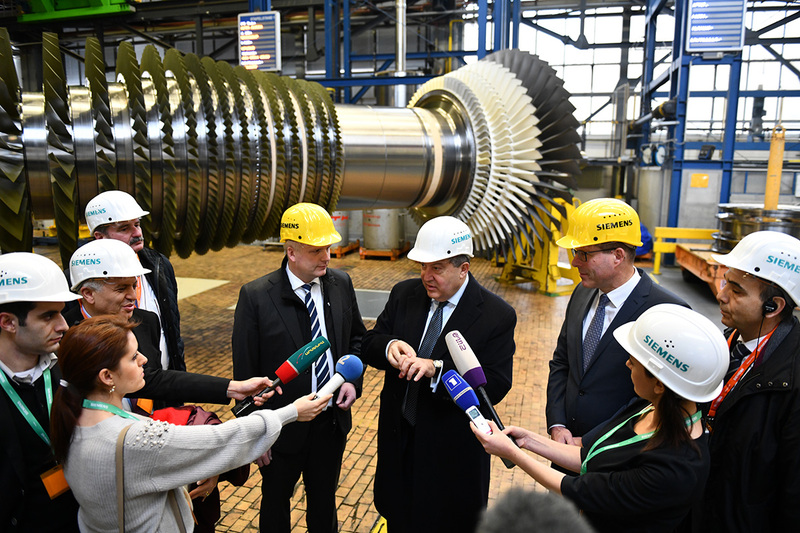 The President toured the gas turbine production unit, familiarized with the production process after which he met with the management. 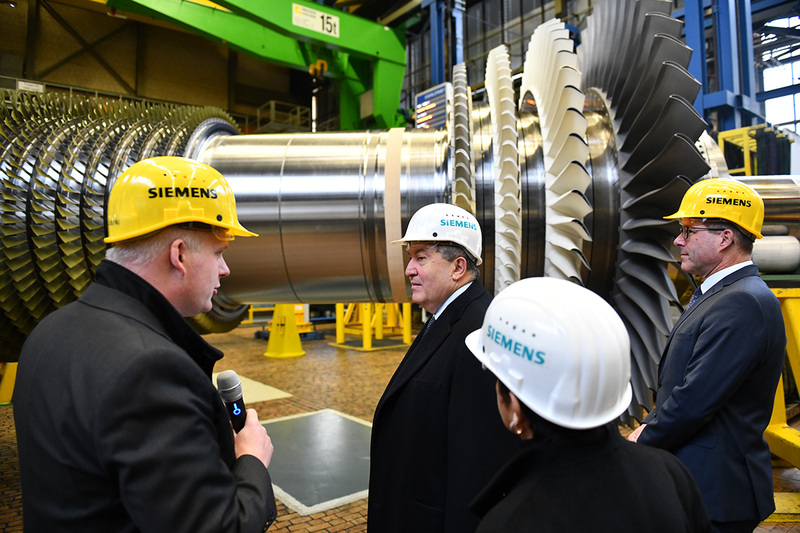 Siemens is involved in major investment projects in Armenia in the area of energy: Together with the Italian Renco and Armpower companies, Siemens will carry out the construction and operation of a hydropower station in Yerevan working on gas turbines. 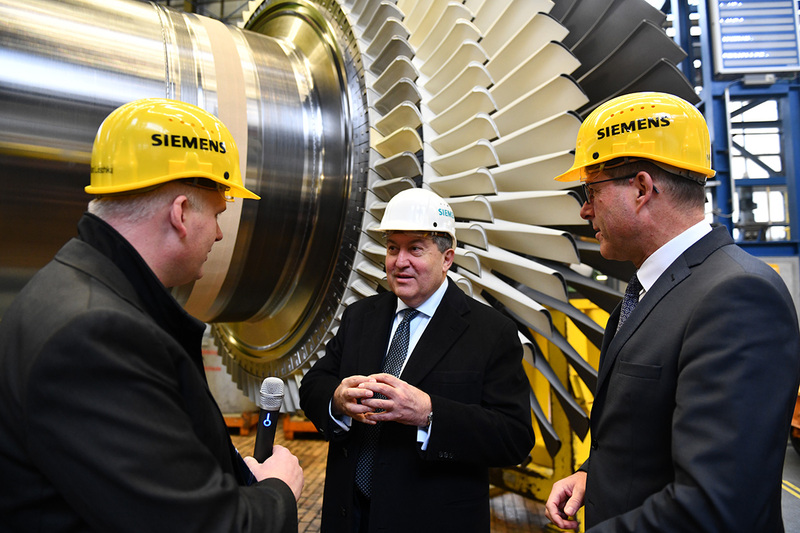 Superefficient gas turbines of Siemens will be used for the construction of a 250 megawatt power station. 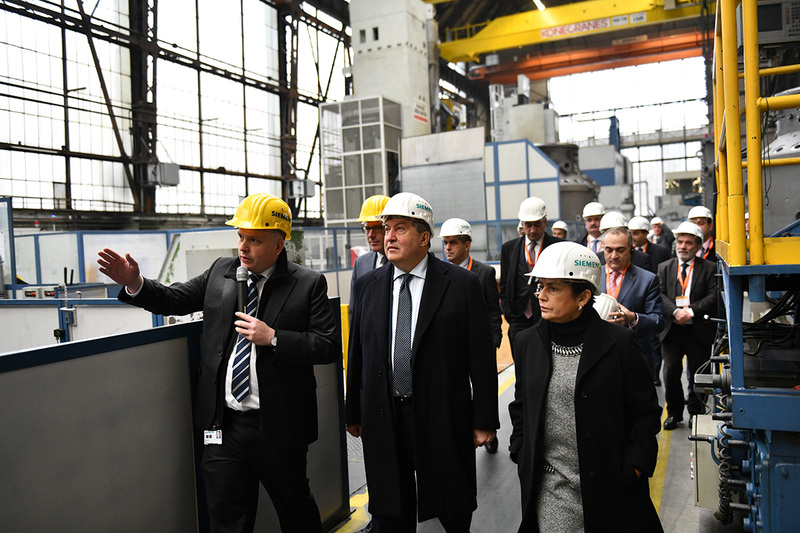 It is expected that the mentioned hydropower station will boost the considerably energy production capacities of Armenia. 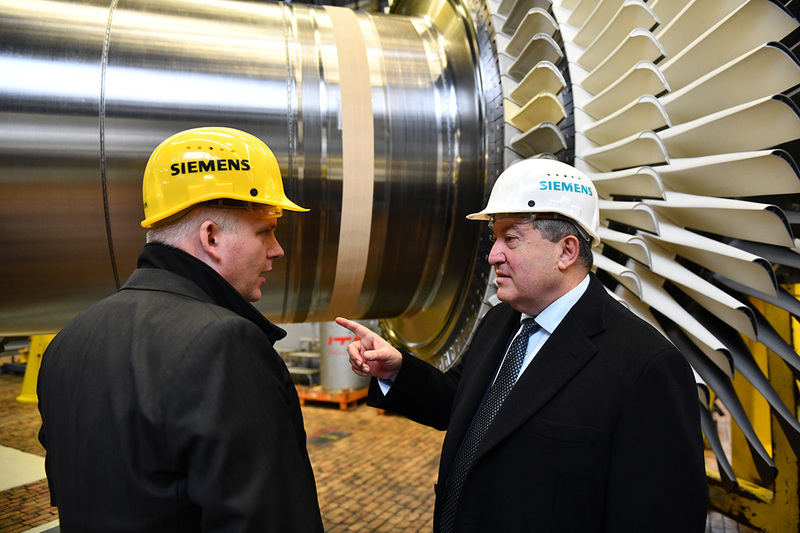 At the meeting, the President was informed on the process of implementation of the project and the technologies used there. 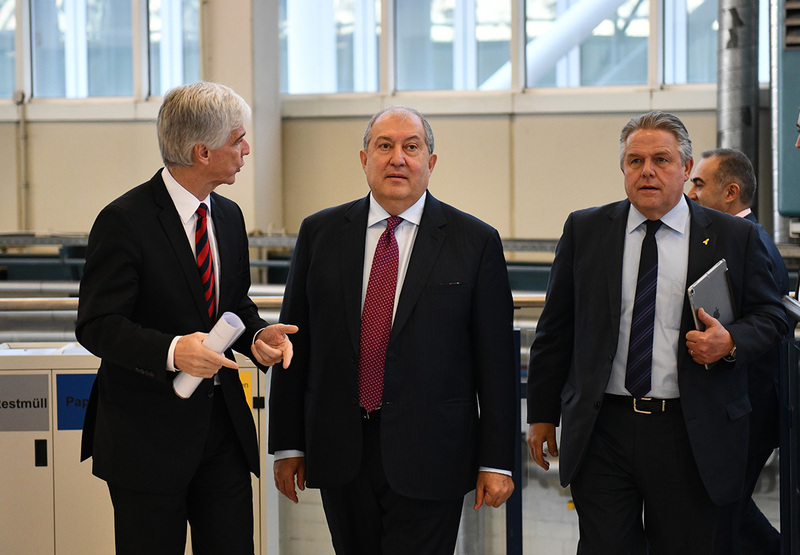 President Armen Sarkissian visited the famous German DESY research center located in Zeuthen. 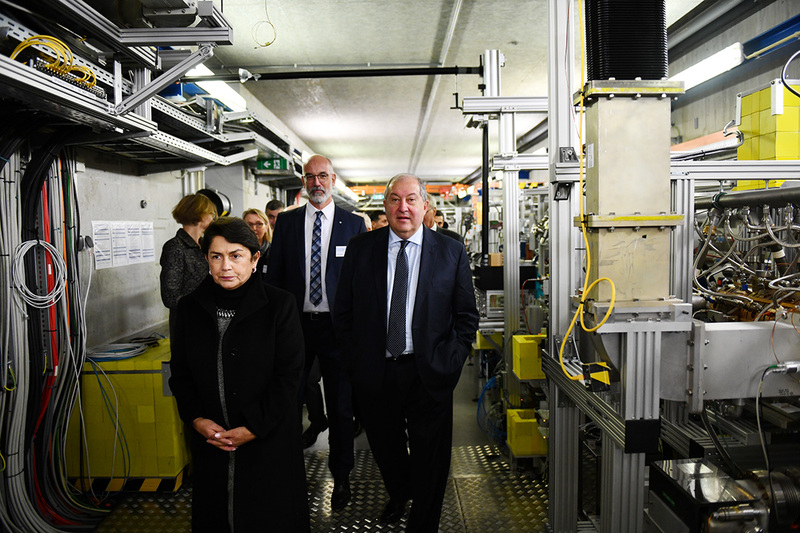 The Center is conducting fundamental studies in the area of energy resource and accelerator physics. 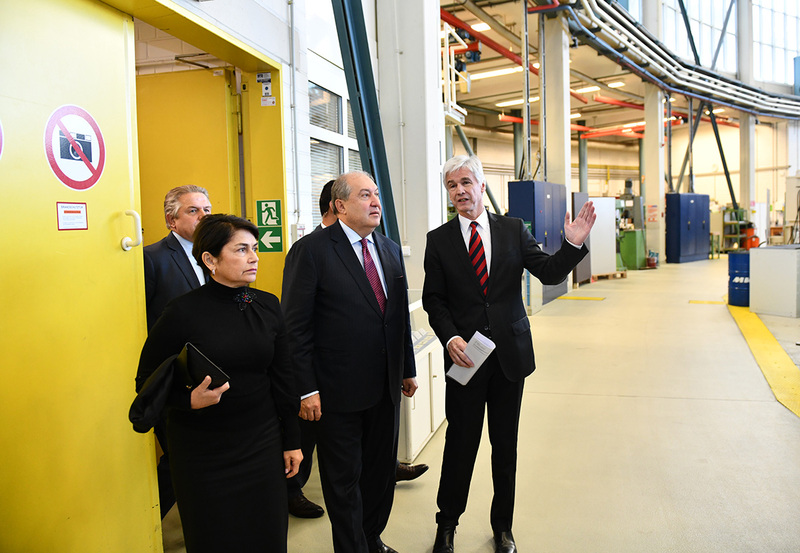 DESY is cooperating with the A. Alikhanian national research laboratory of the Yerevan Institute of Physics and with the CANDLE synchrophasotron research institute in Yerevan. 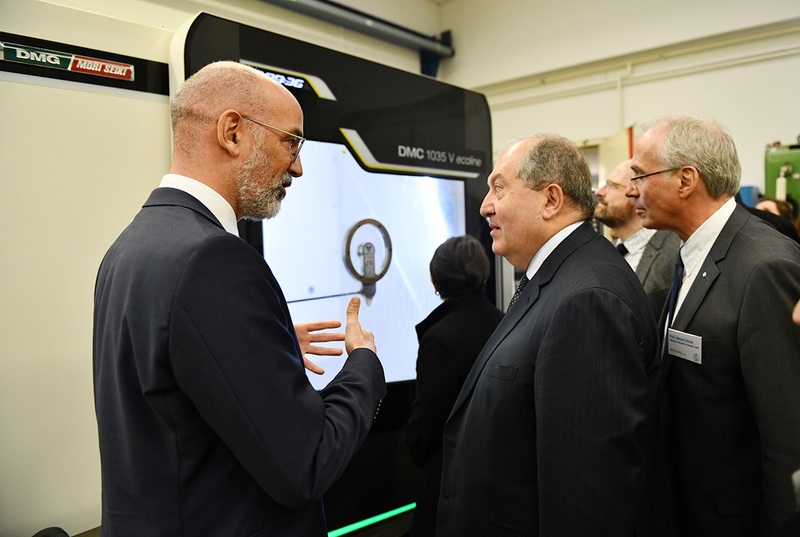 President of the Board of Directors of DESY, professor Helmut Dosch during the tour presented to Armen Sarkissian areas of the Center’s activities. 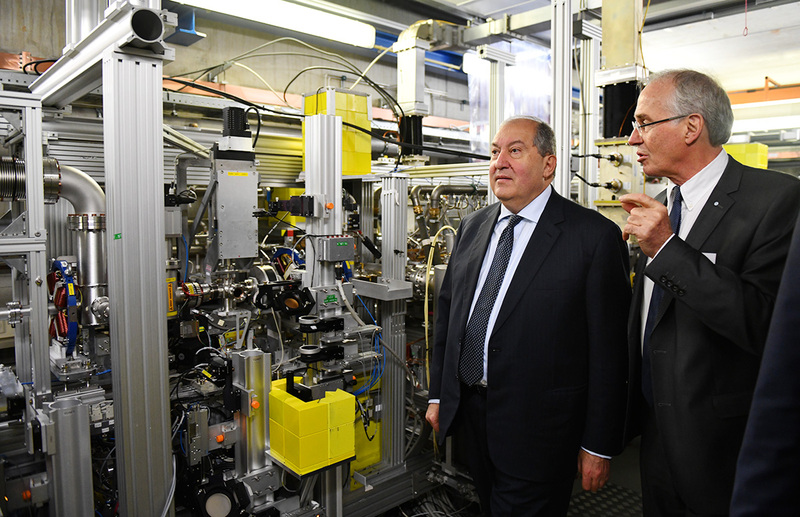 The President familiarized also with the capacities of the PITZ synchrophasotron located in the Center. 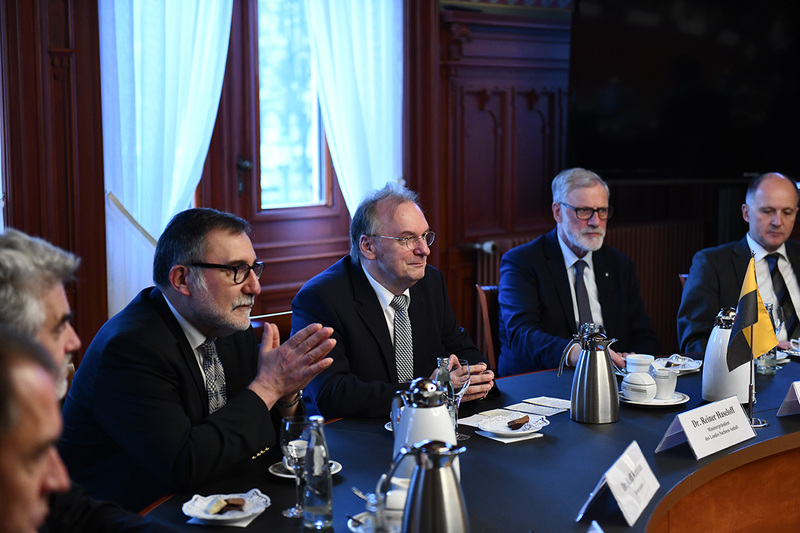 Later, he had a meeting with the Scientific Council of the Center. 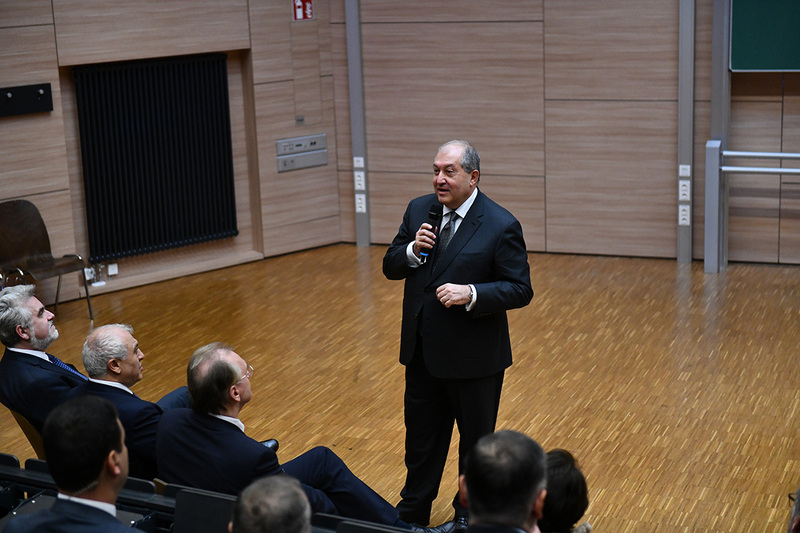 Noting that Armenia too has serious traditions in fundamental sciences, particularly, in physics, President Sarkissian underscored that Armenia possesses a great potential to expand the existing cooperation with scientific and research institutions. 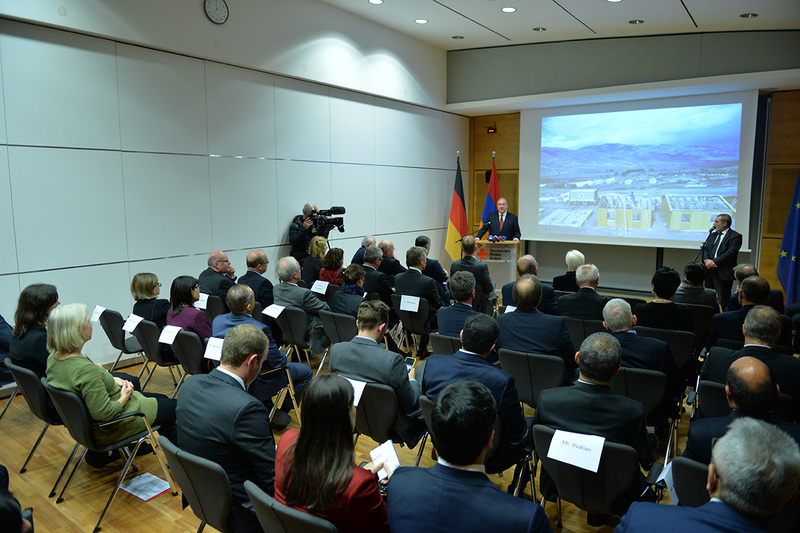 “I was glad to see also Armenian scientists in DESY, their presence here testified to a real Armenian-German cooperation. 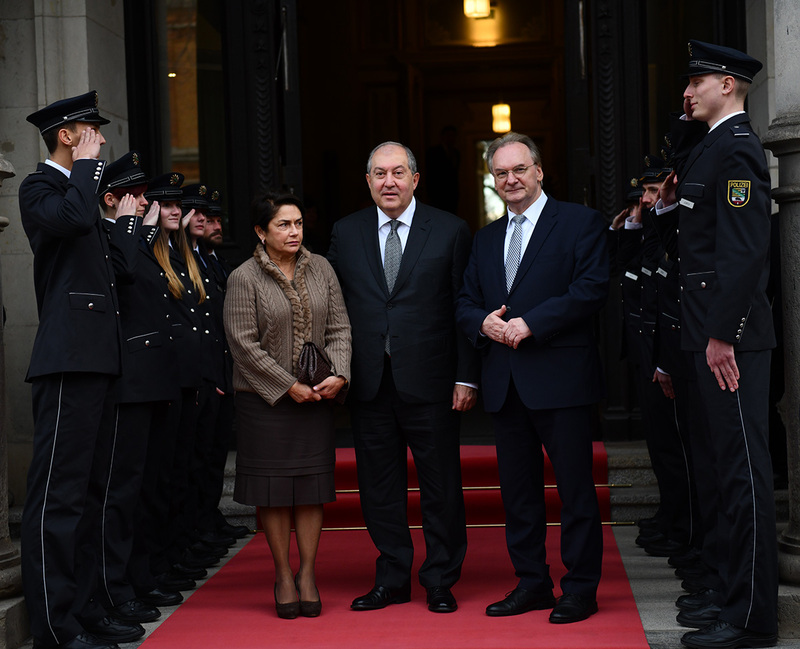 I believe in the framework of your new projects, there are serious opportunities to deepen the cooperation. 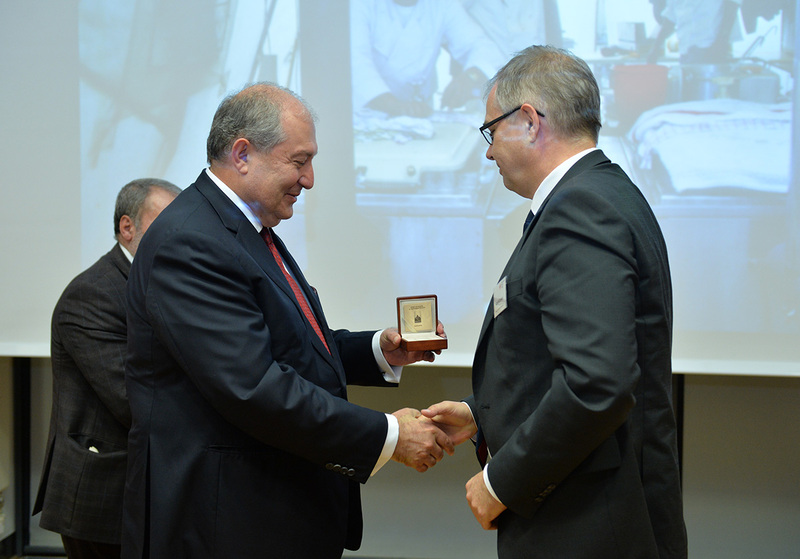 Armenia has good specialists and ties; Armenia has proved that is able to produce high-quality products. 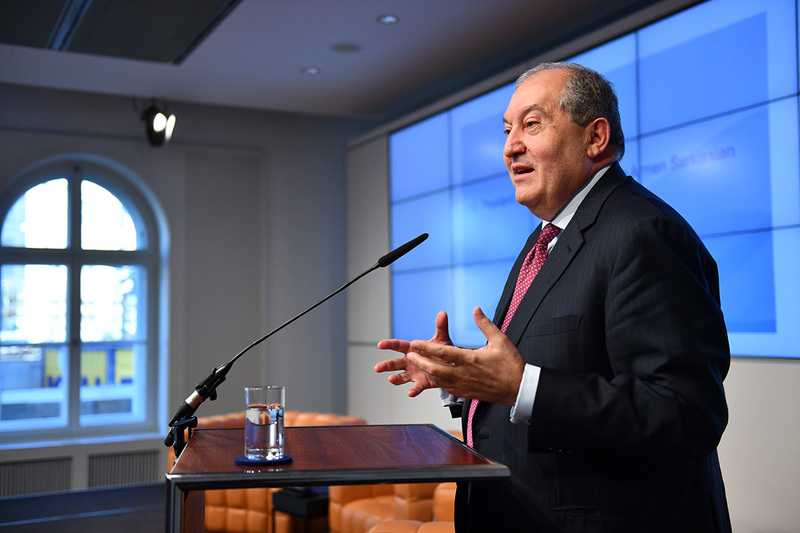 Thus, I believe we need to continue to develop our cooperation,” President Armen Sarkissian underlined and added that he was ready to assist in deepening the existing cooperation.